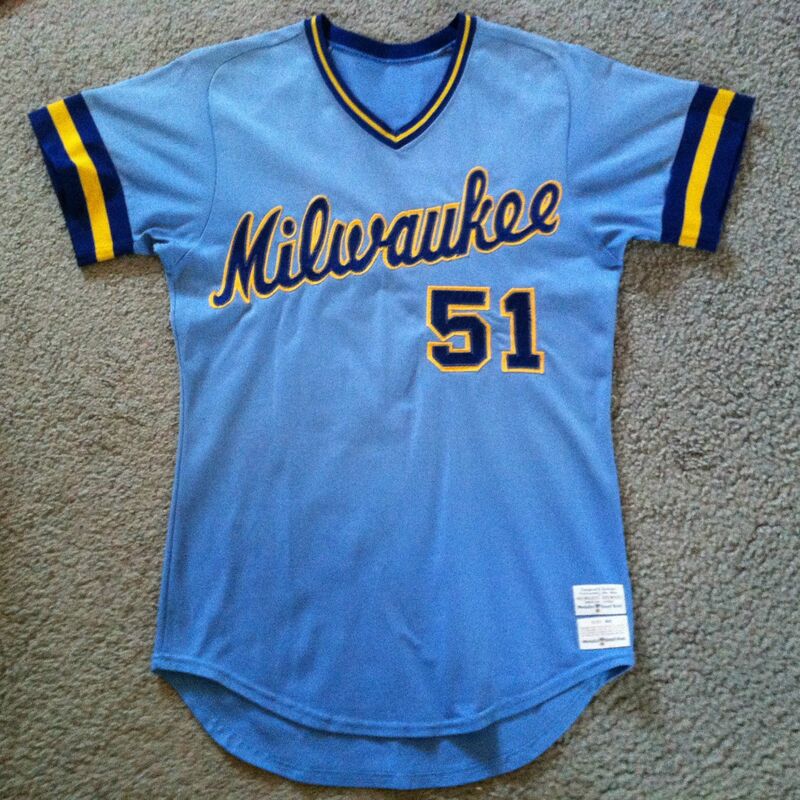 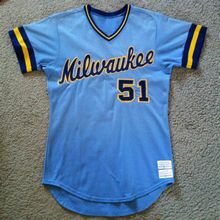 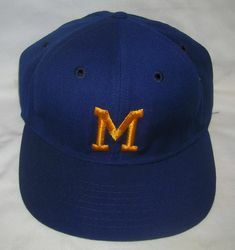 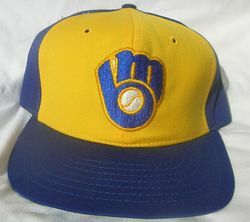 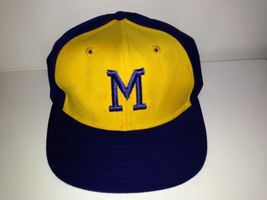 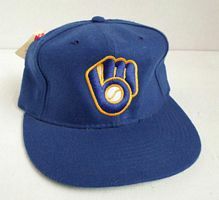 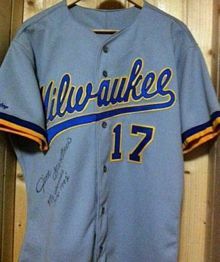 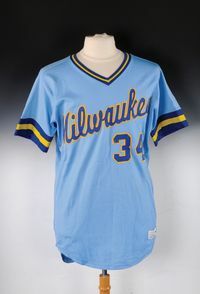 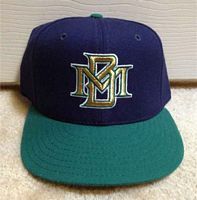 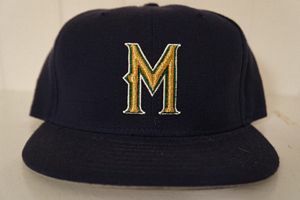 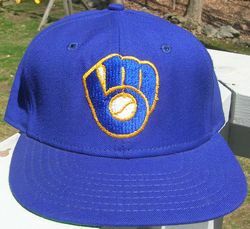 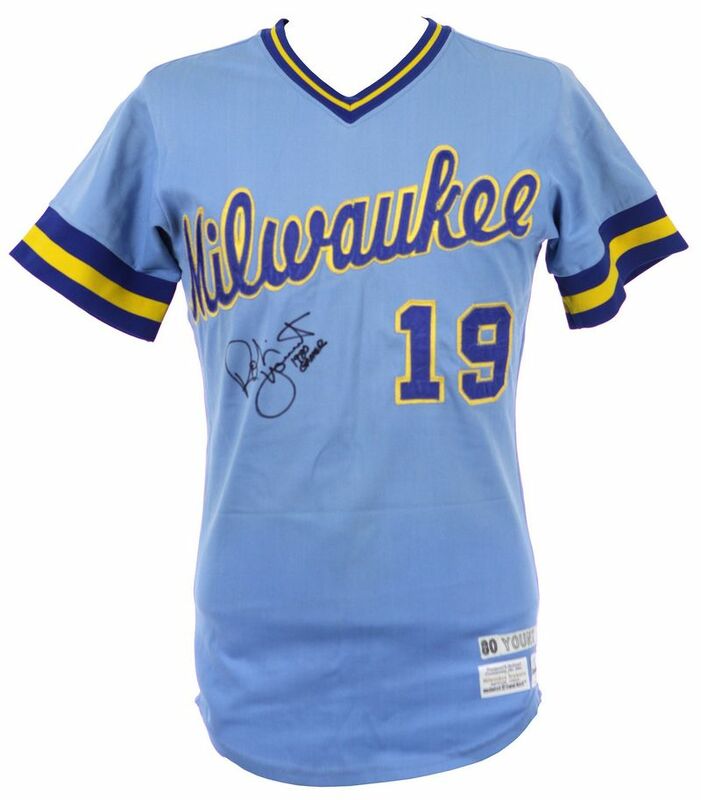 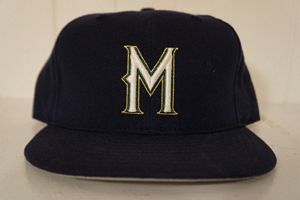 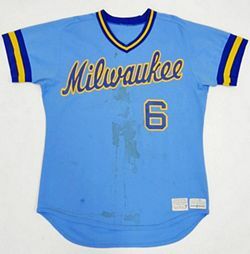 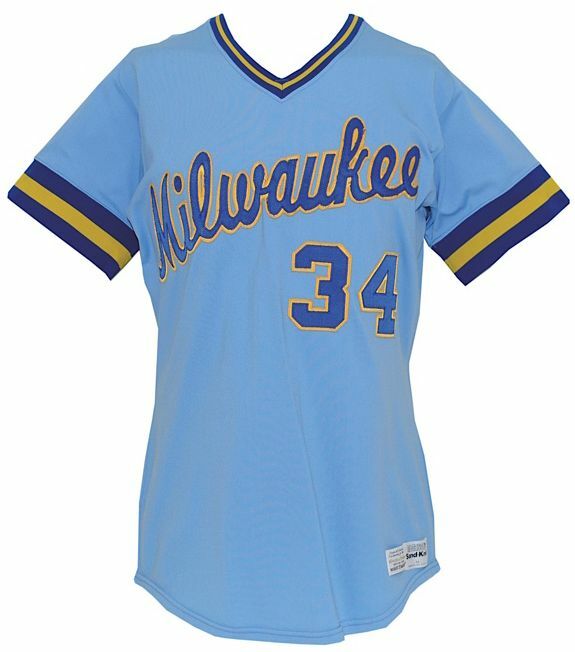 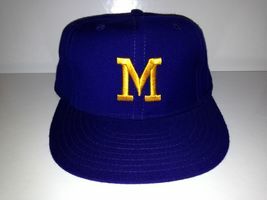 The Seattle Pilots relocated to Milwaukee suddenly in the spring of 1970. 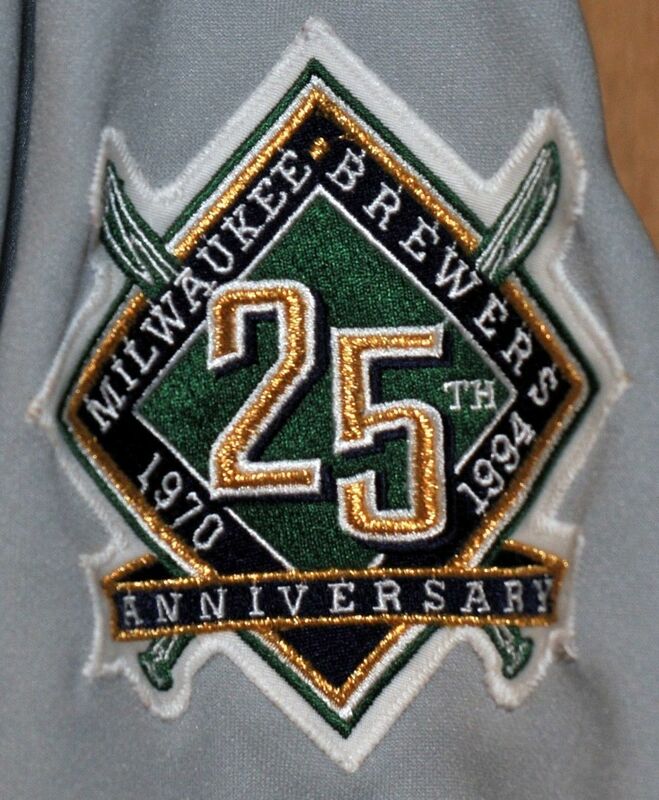 There's less than a week between the announced move to Milwaukee and the first regular season game. 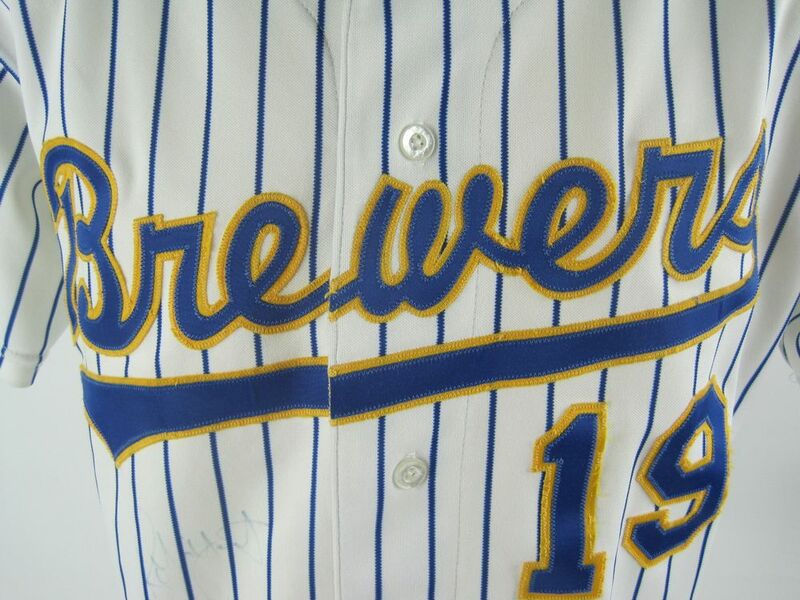 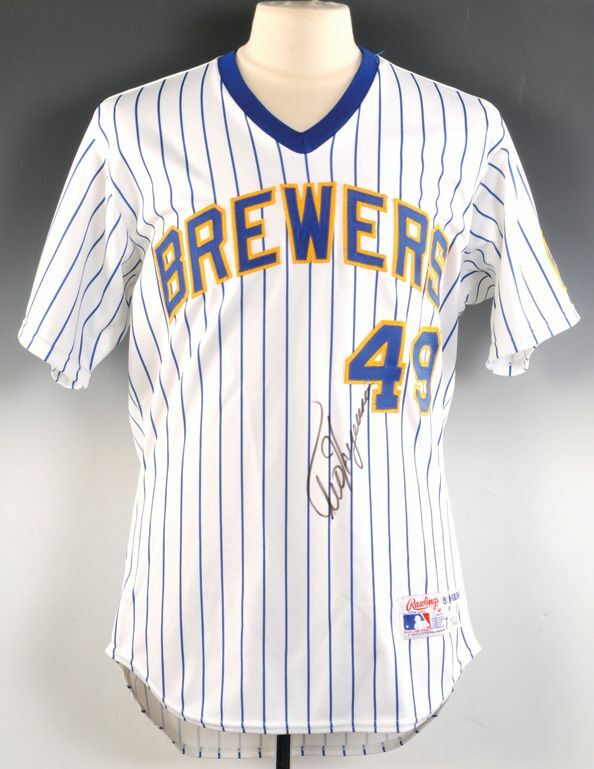 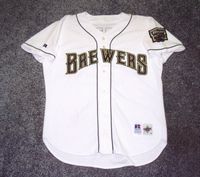 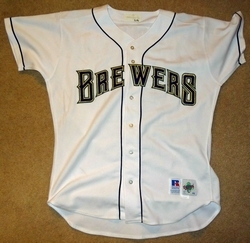 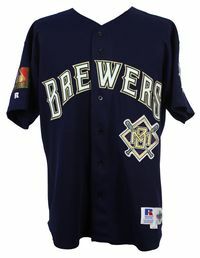 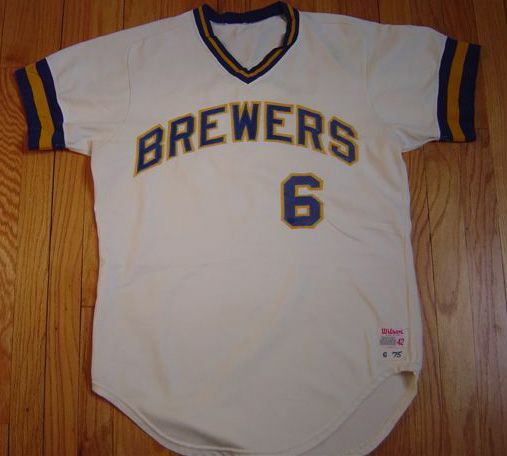 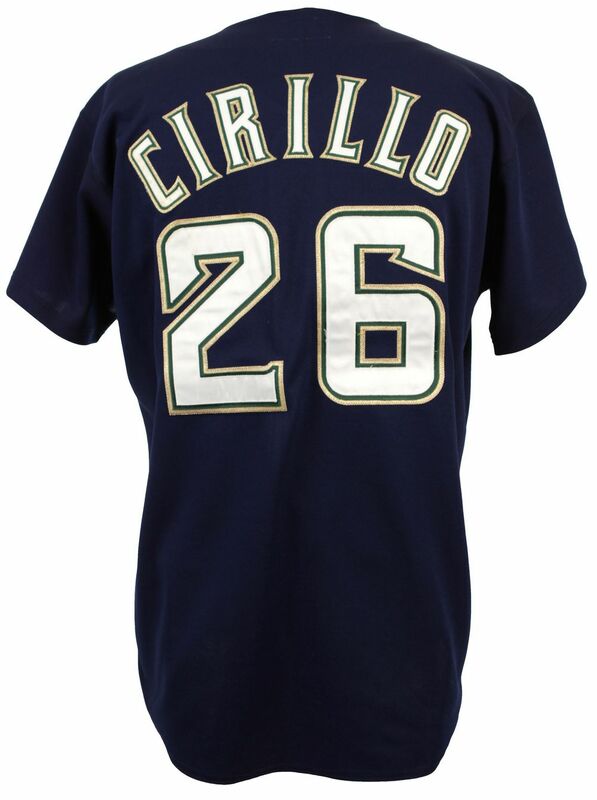 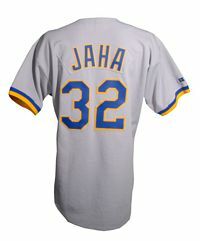 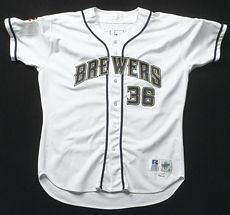 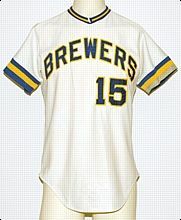 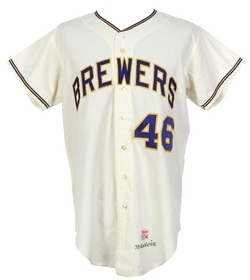 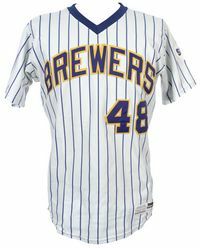 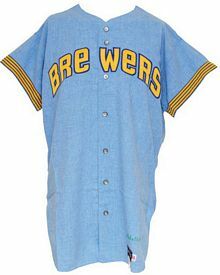 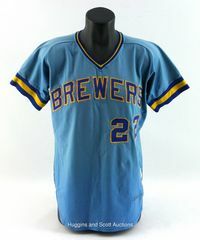 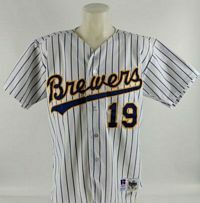 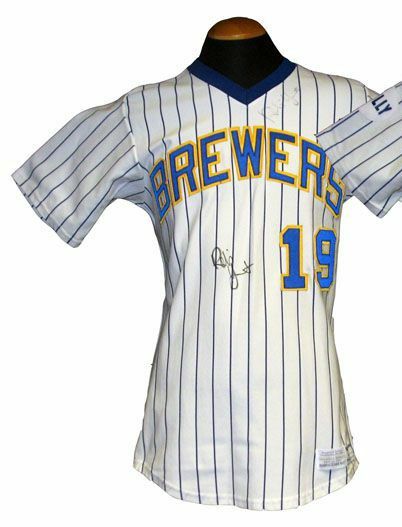 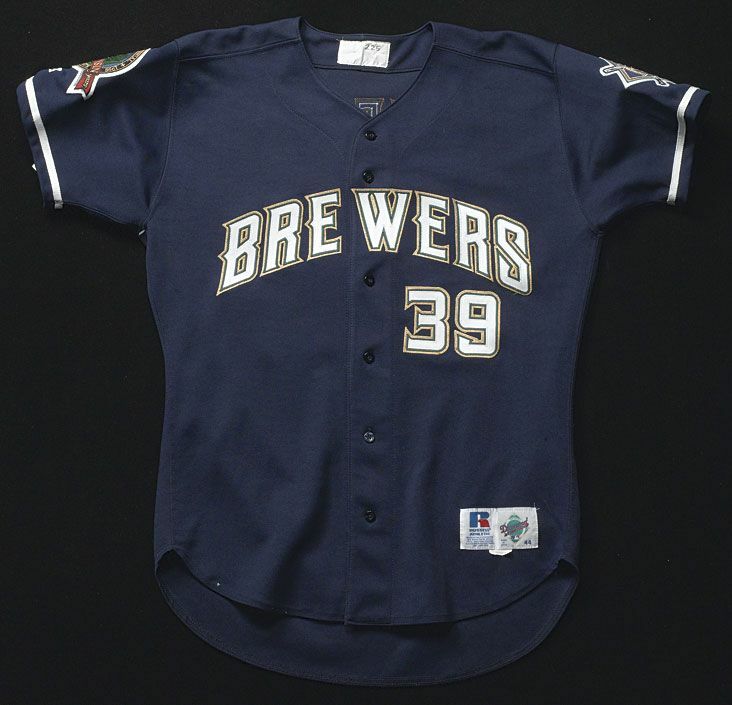 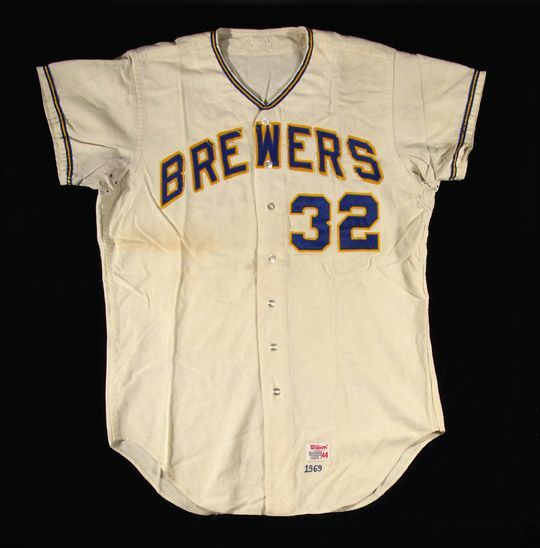 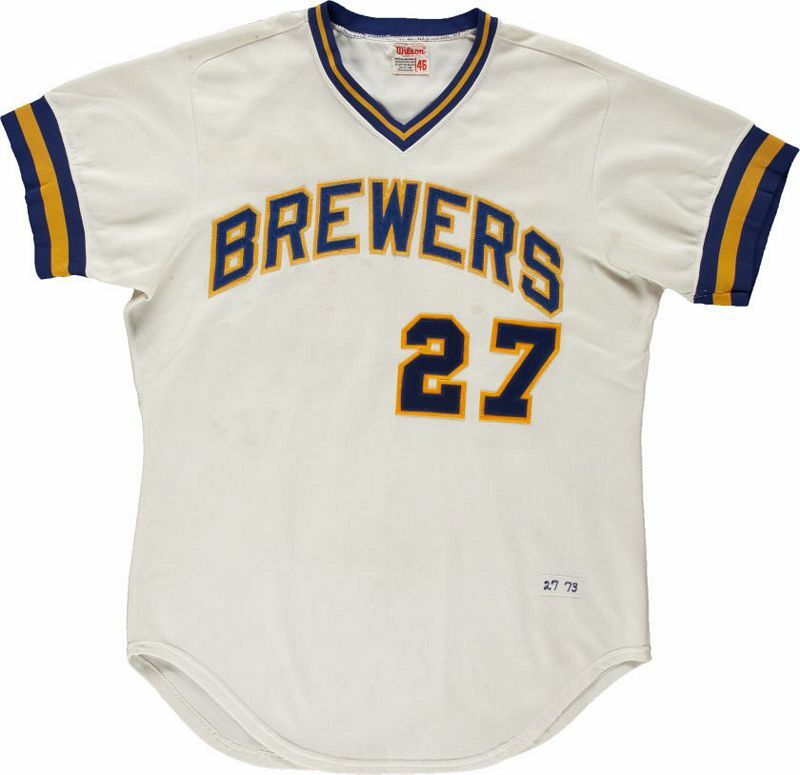 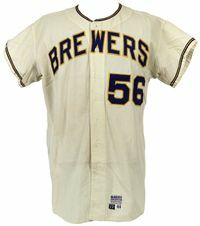 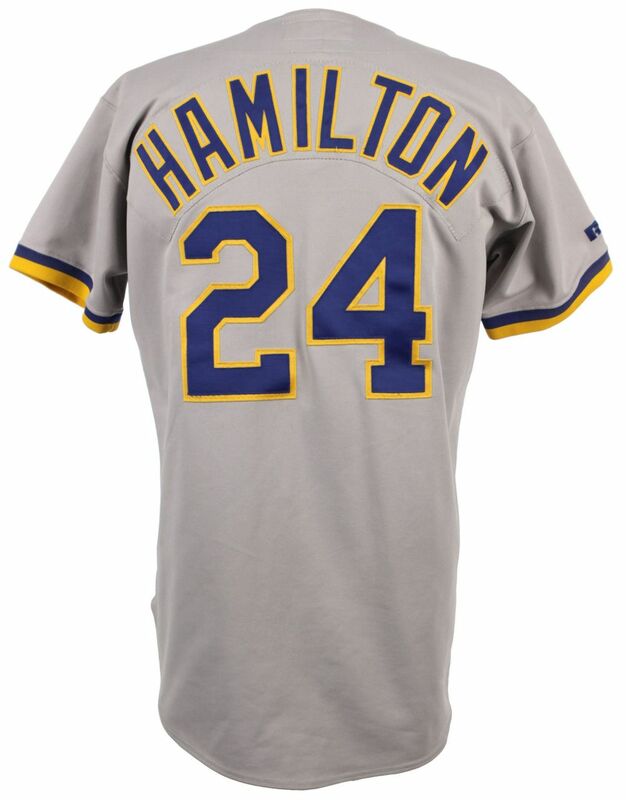 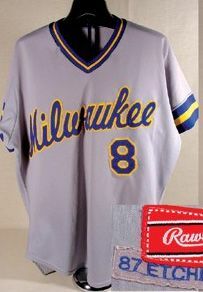 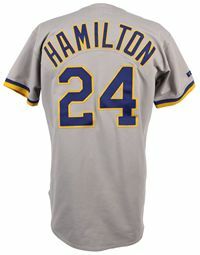 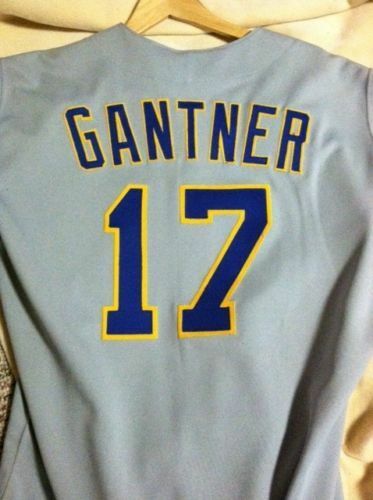 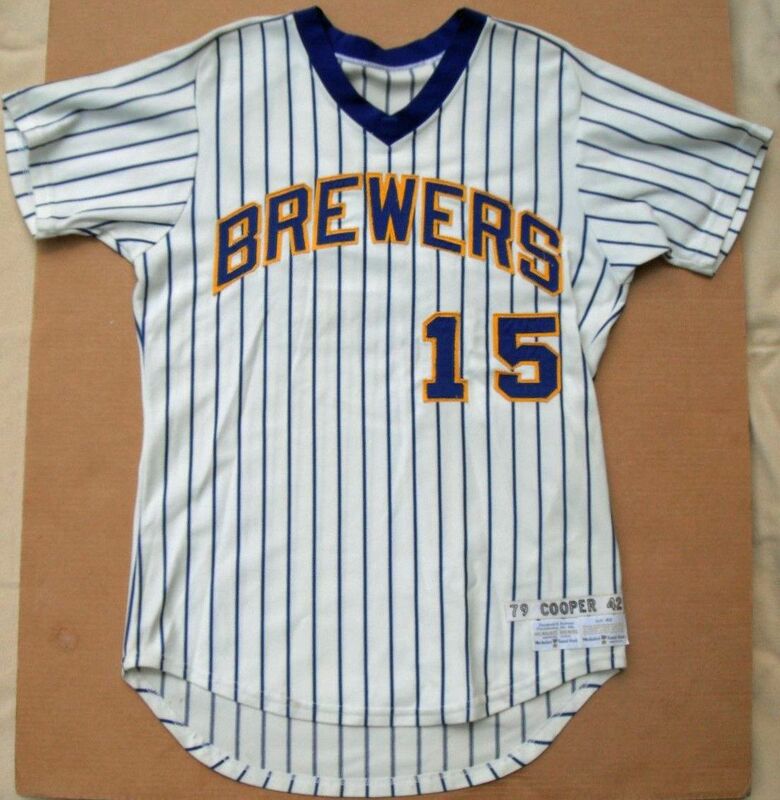 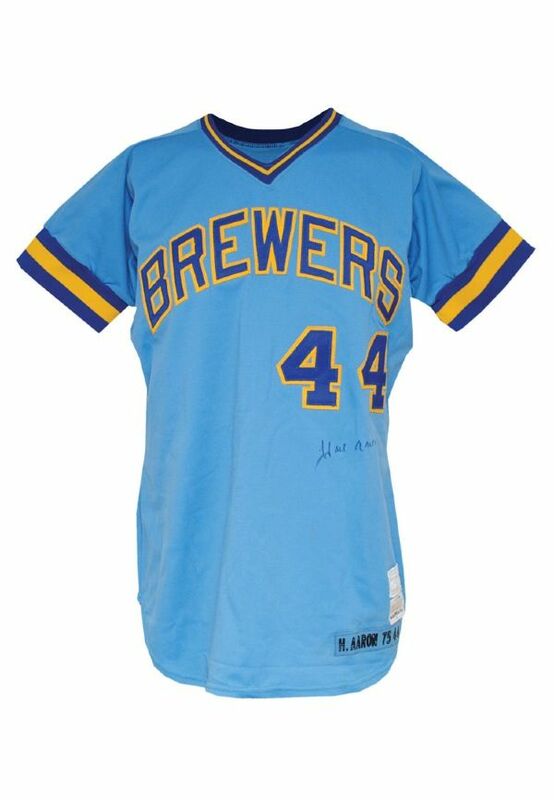 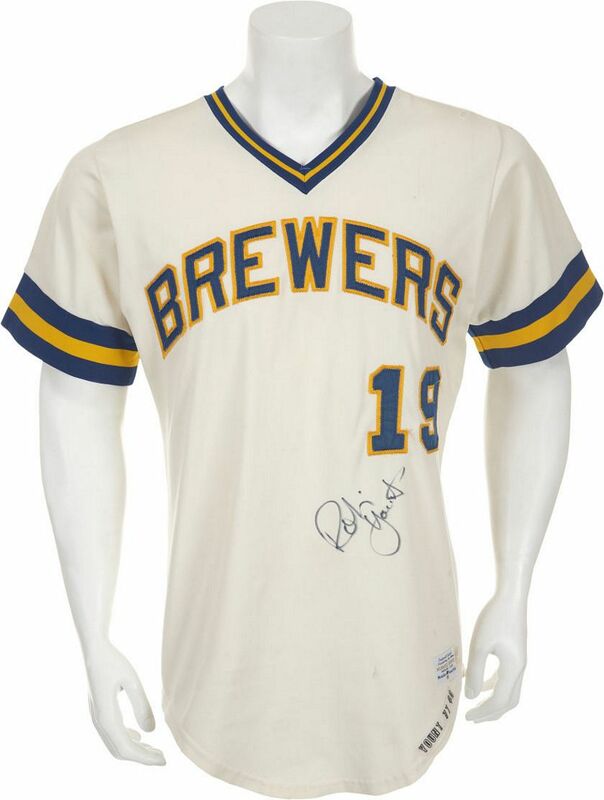 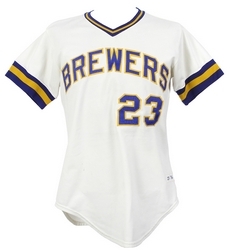 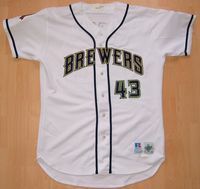 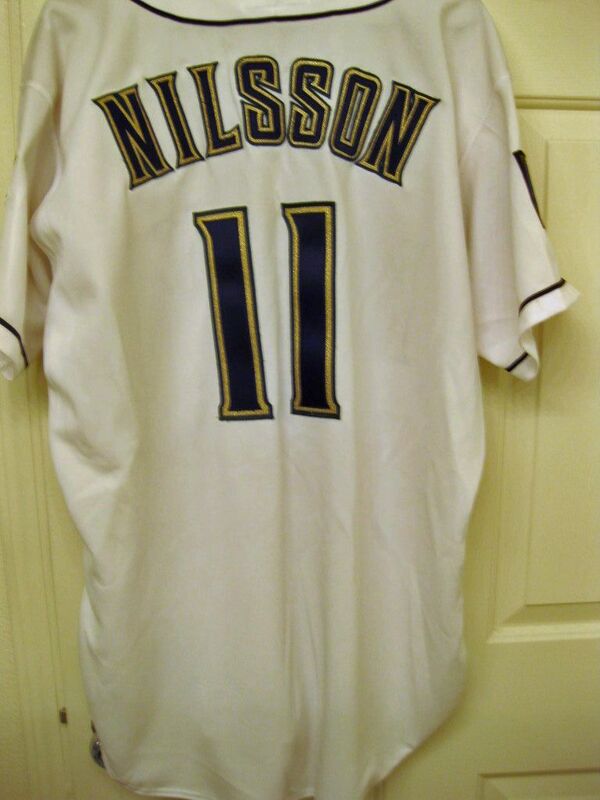 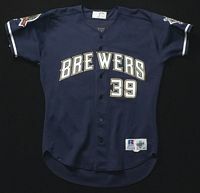 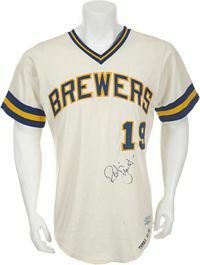 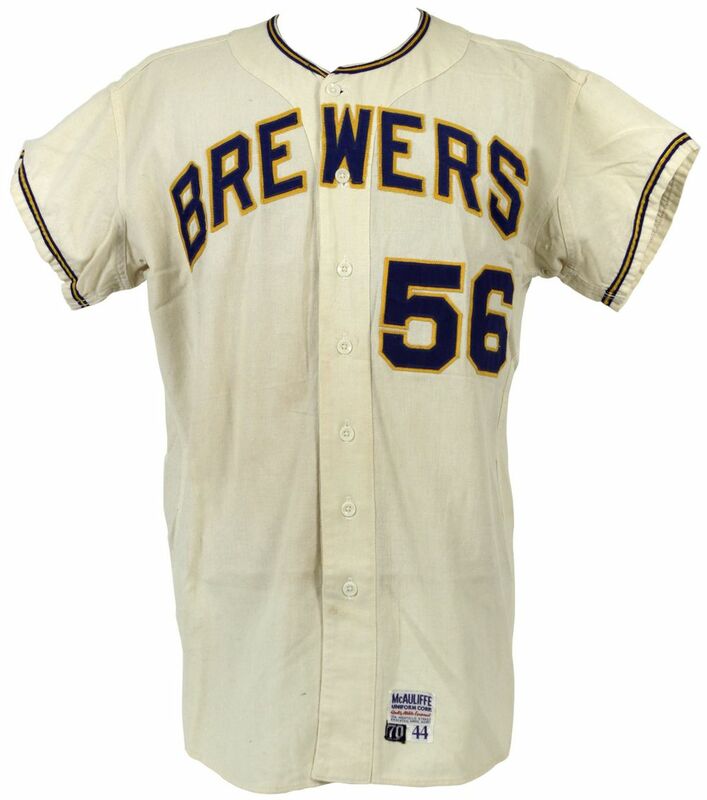 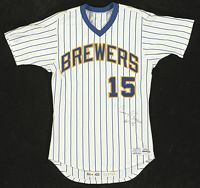 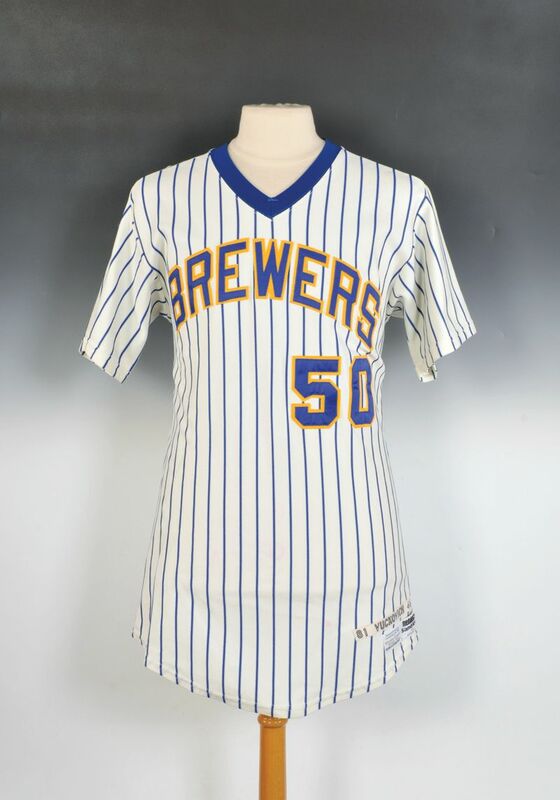 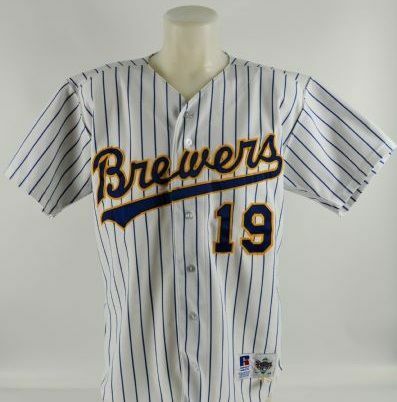 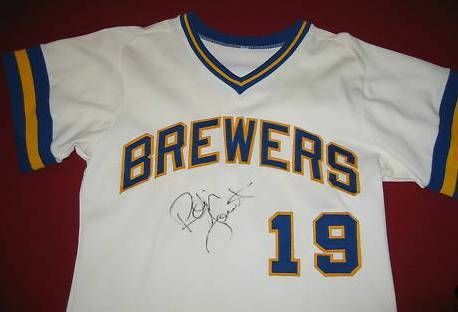 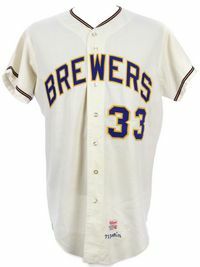 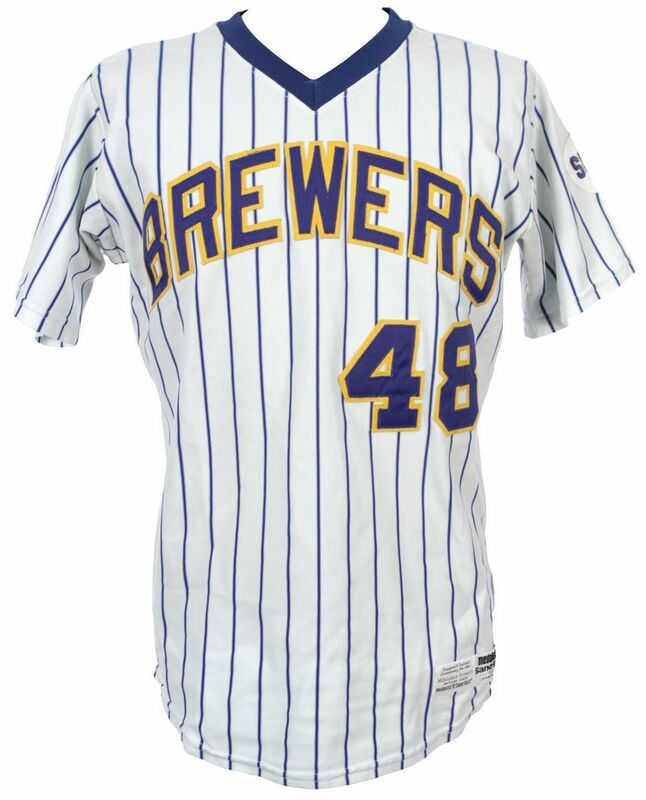 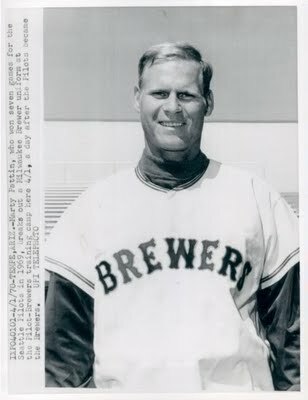 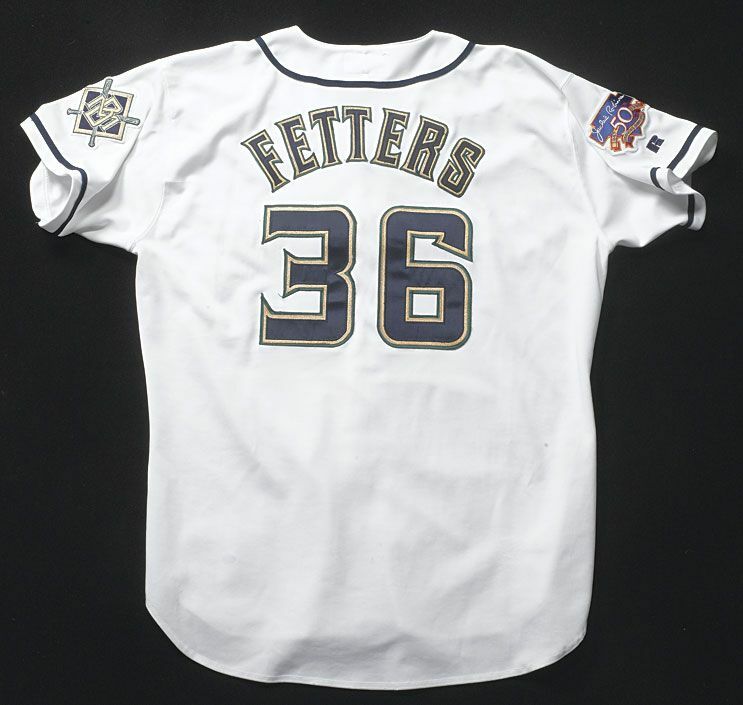 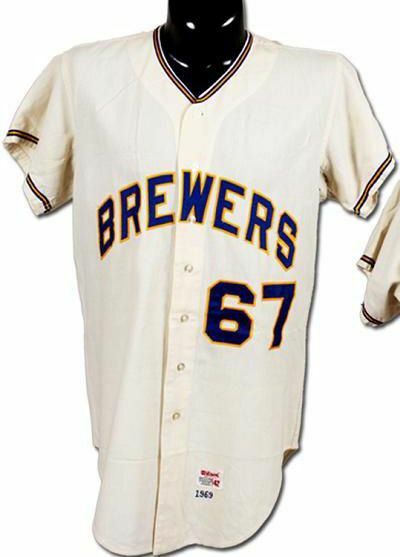 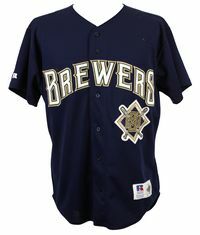 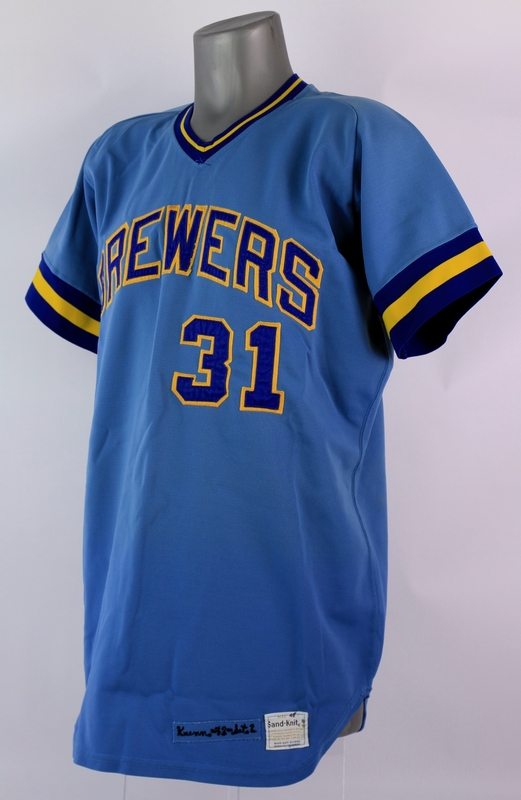 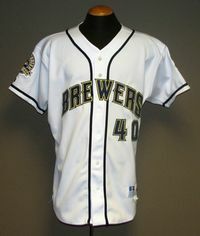 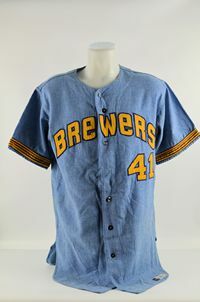 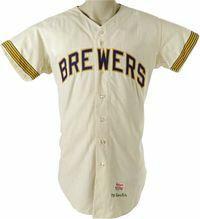 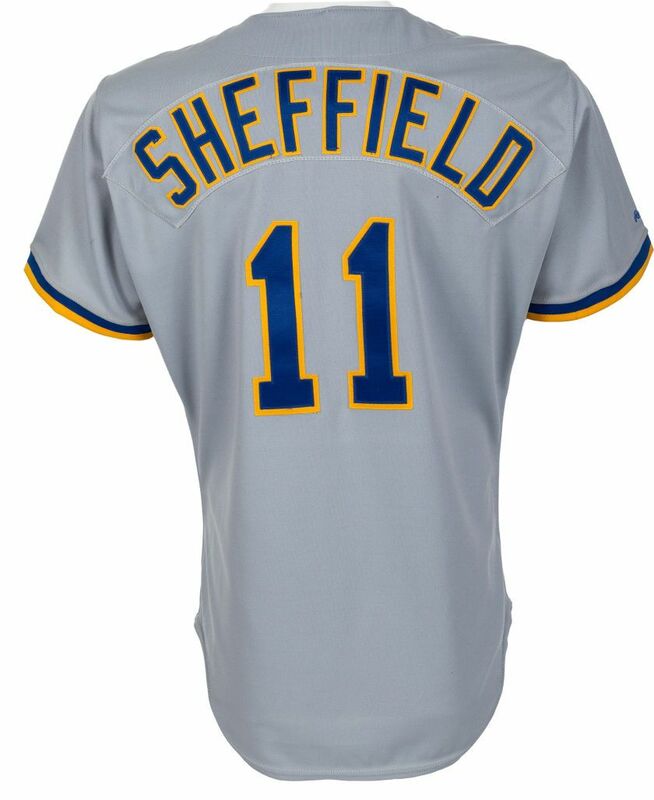 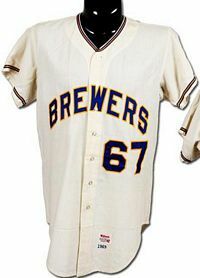 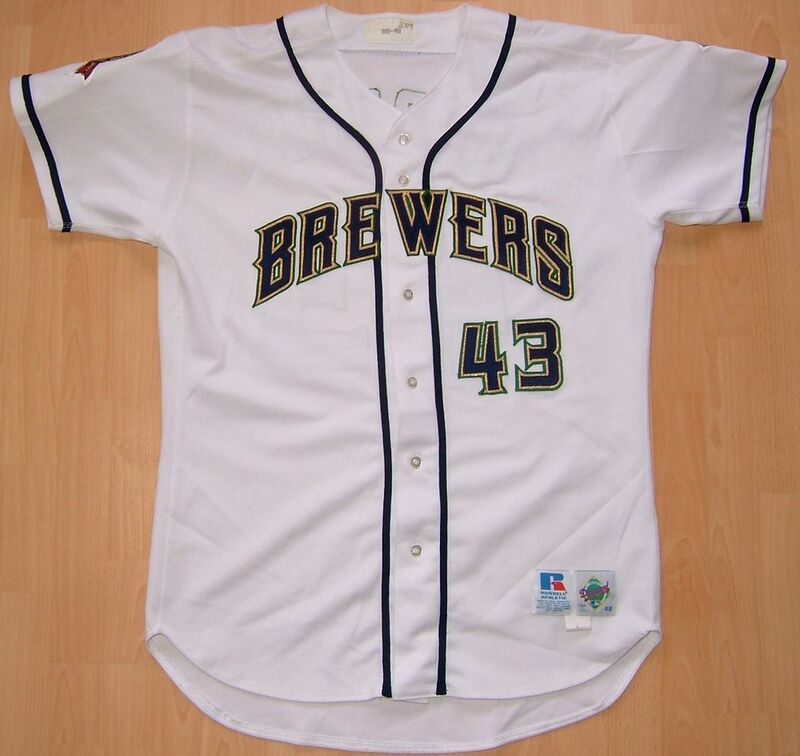 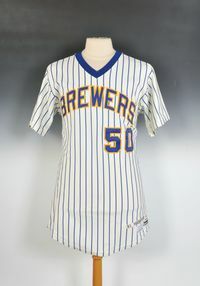 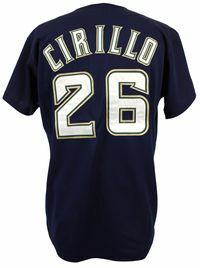 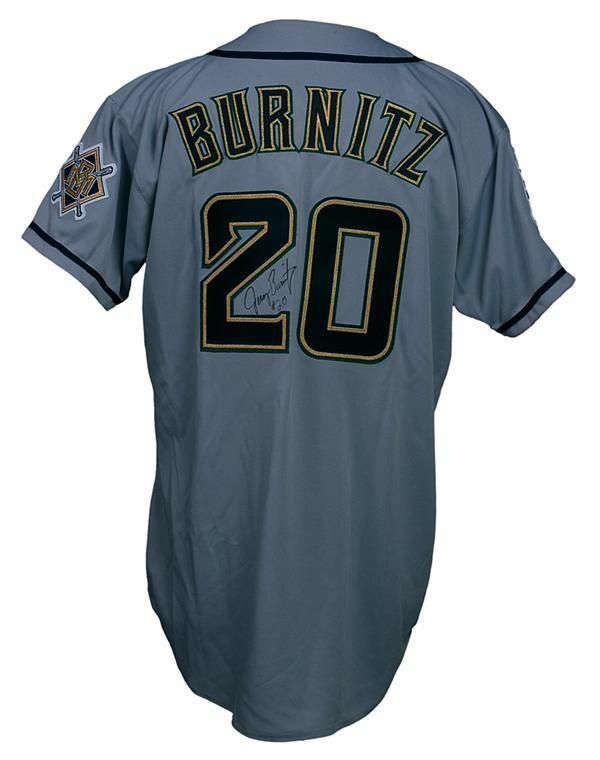 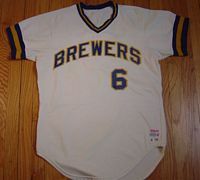 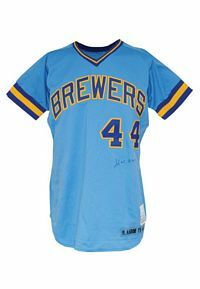 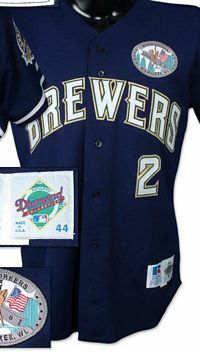 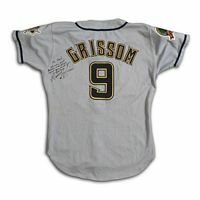 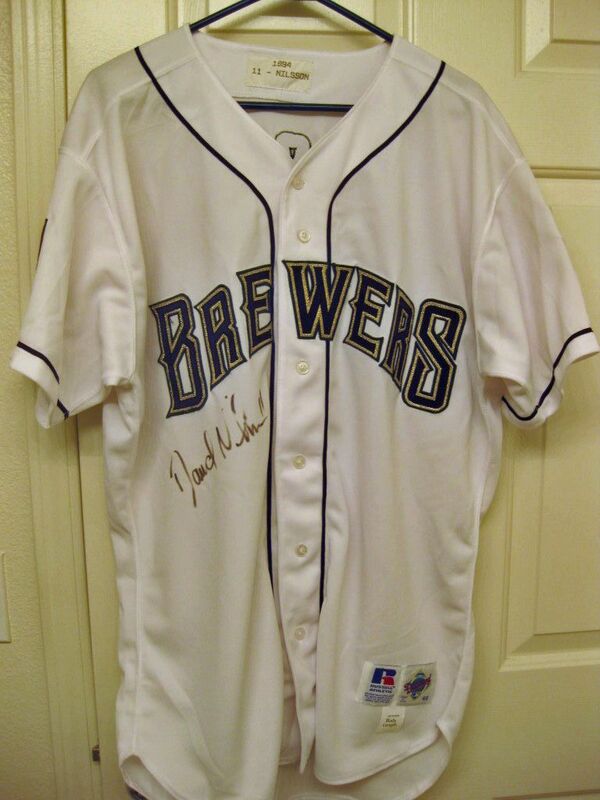 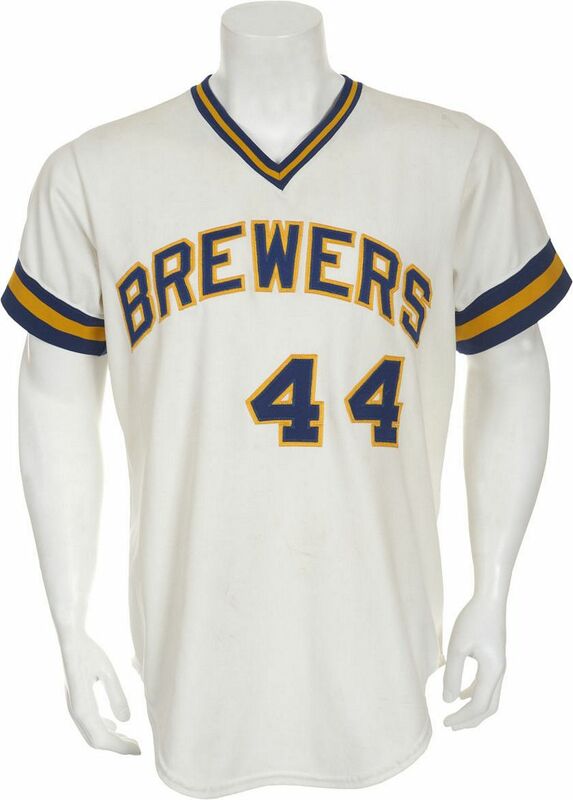 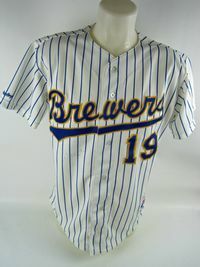 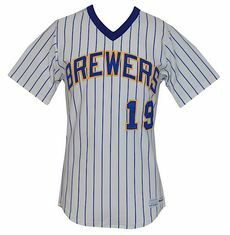 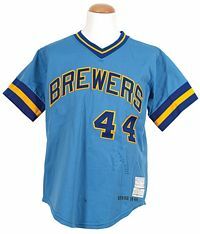 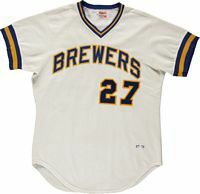 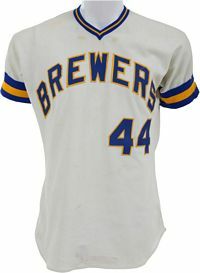 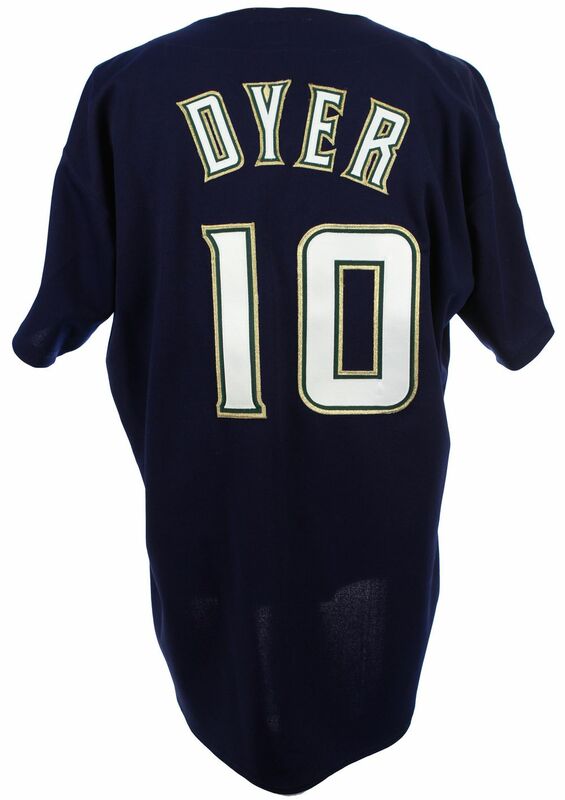 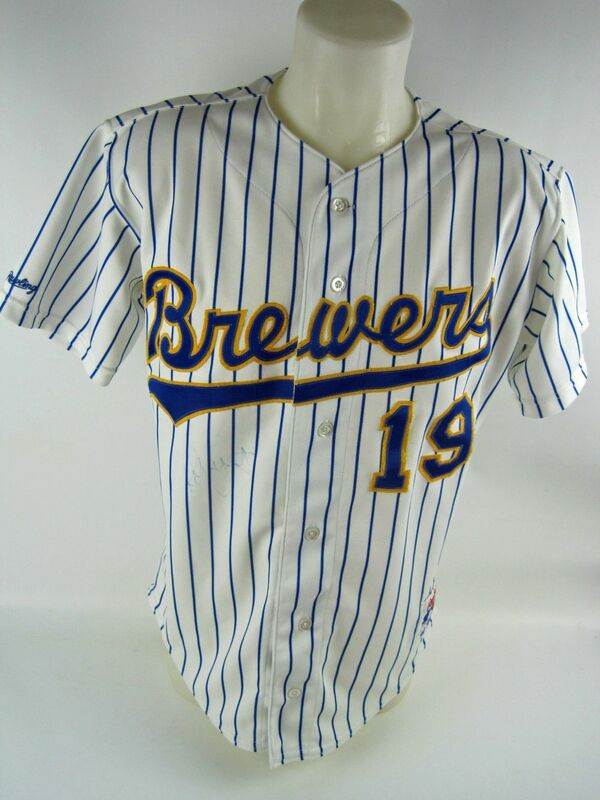 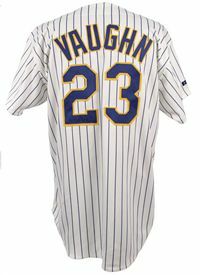 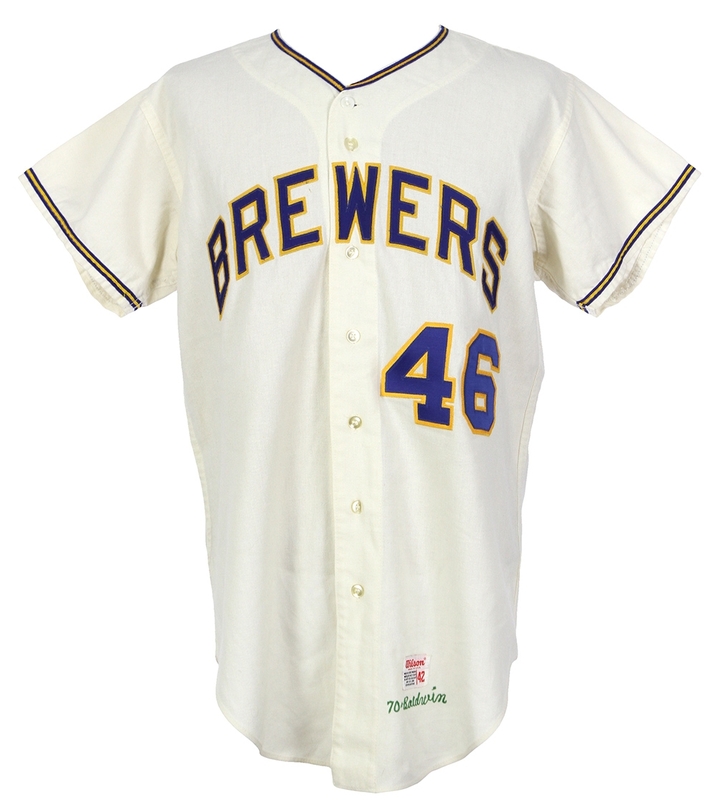 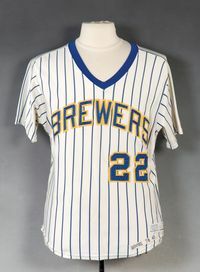 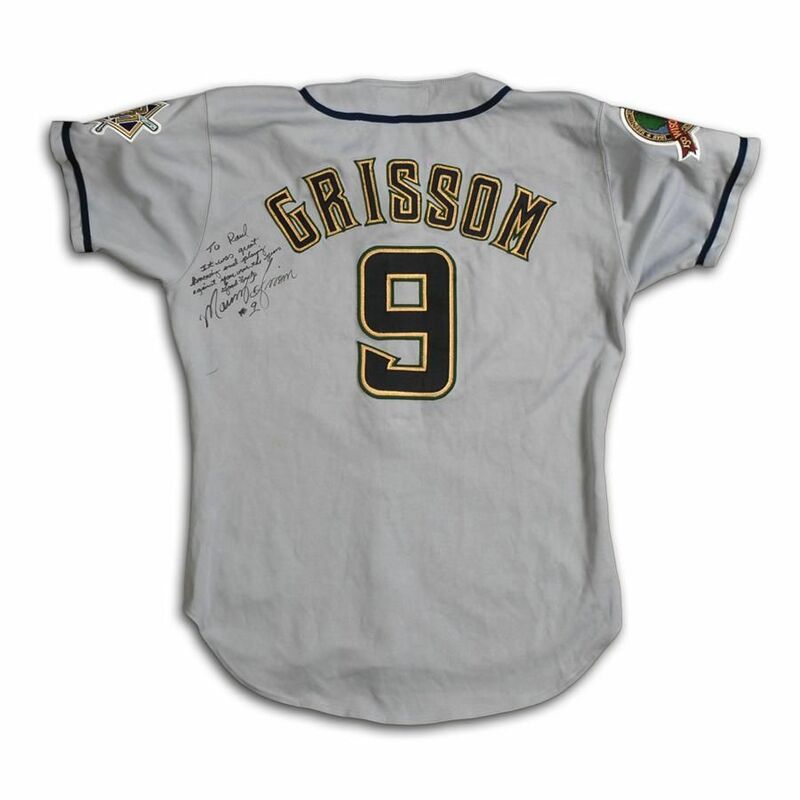 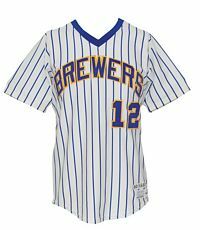 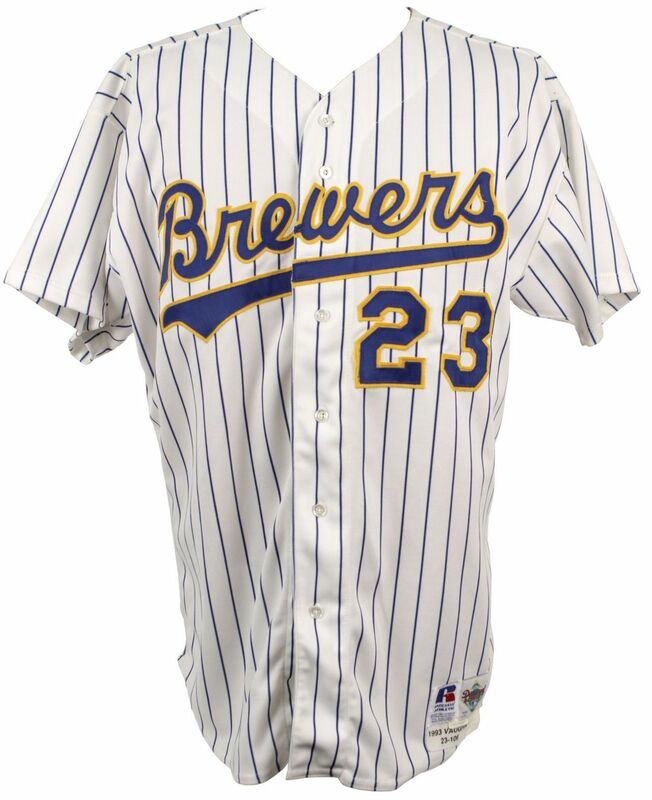 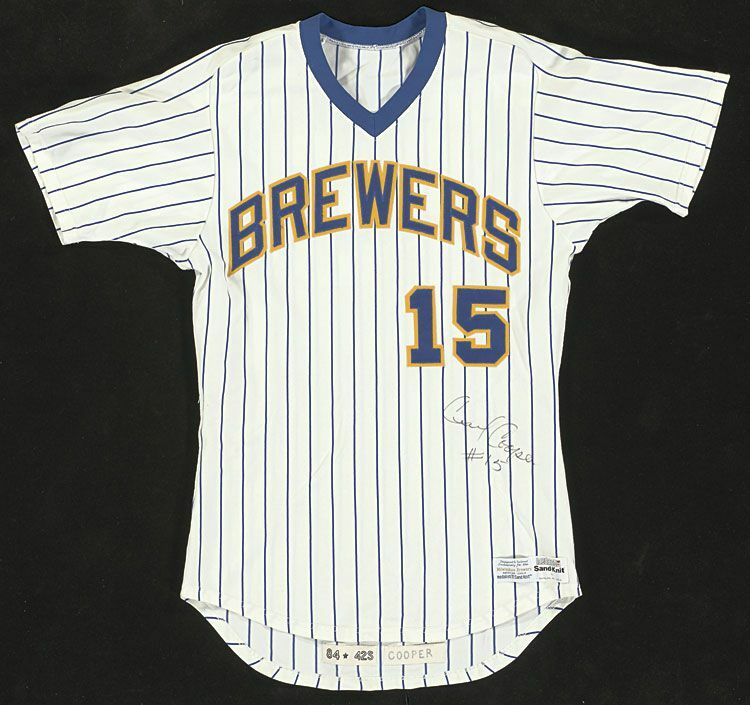 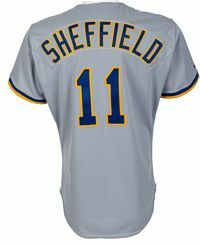 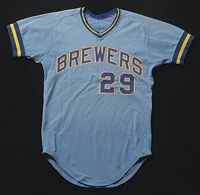 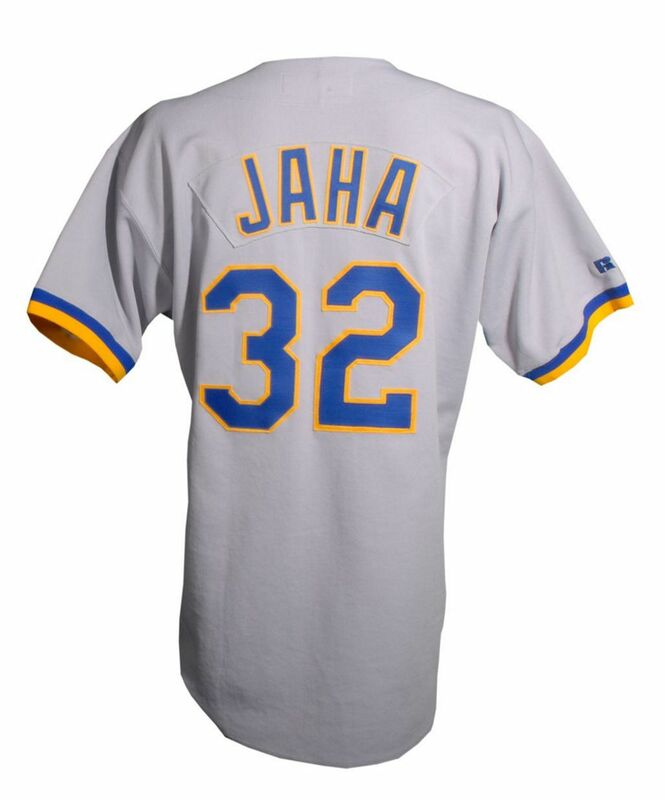 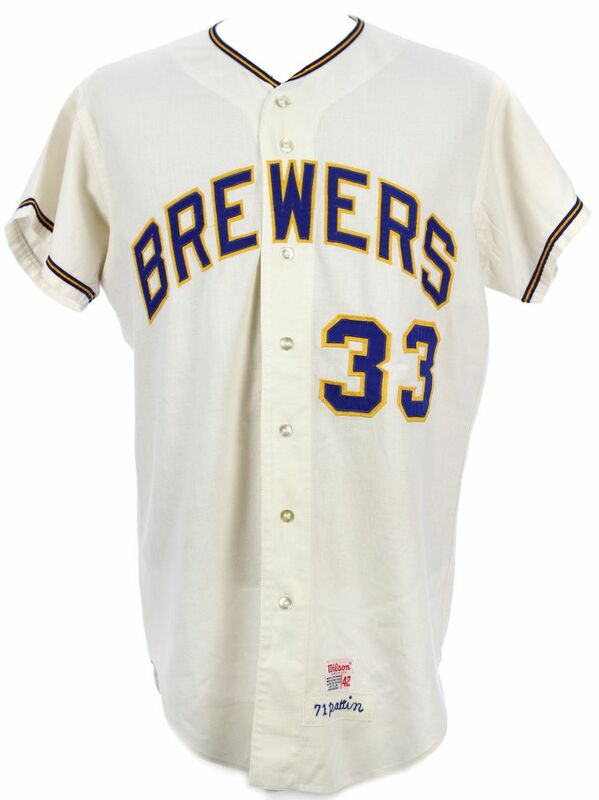 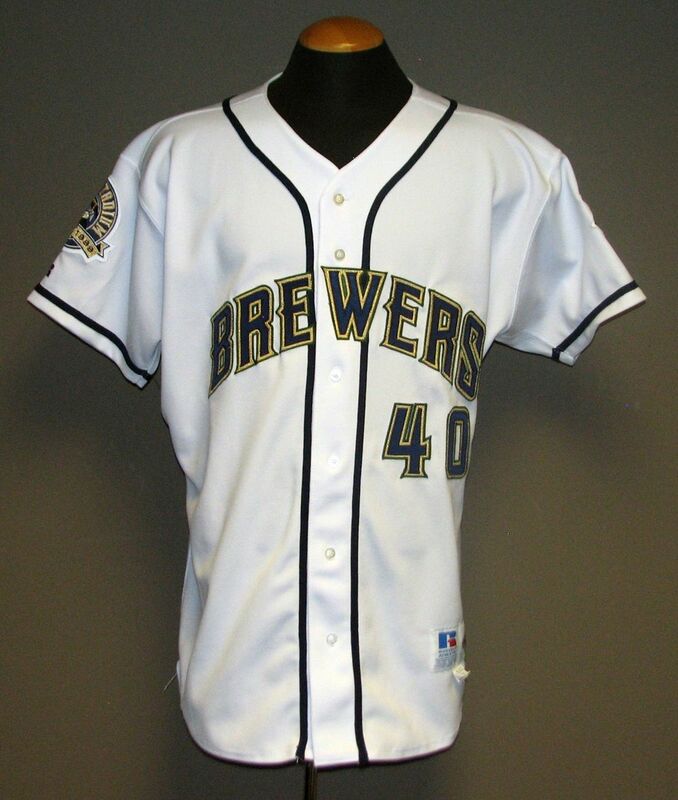 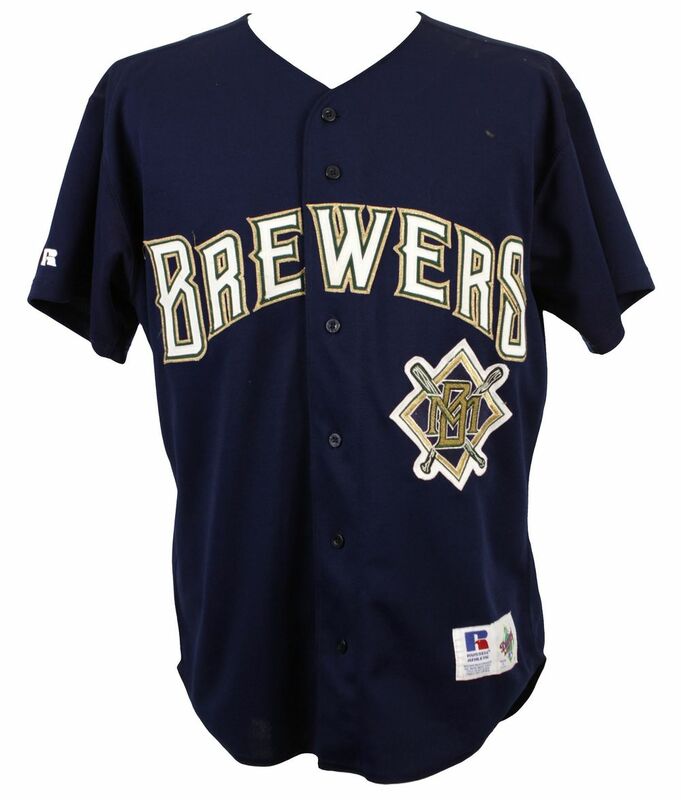 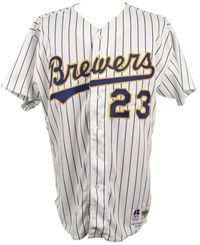 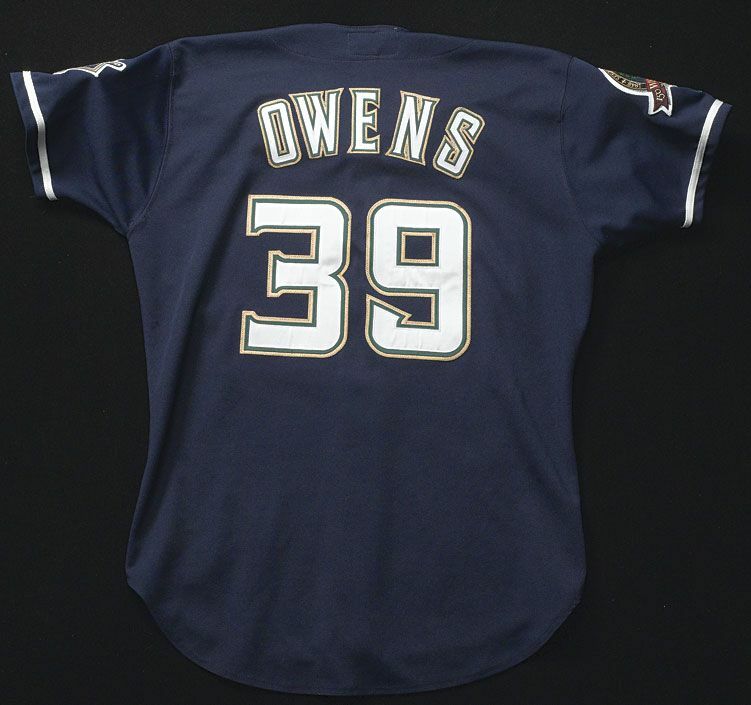 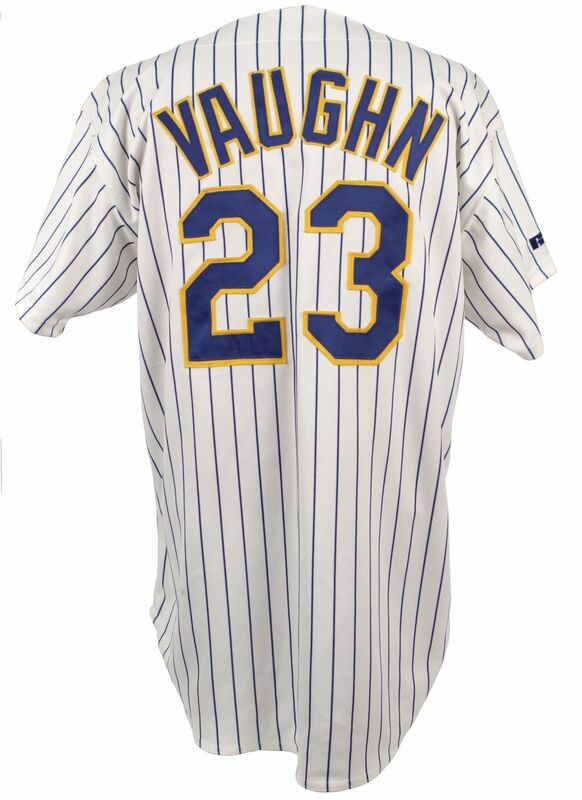 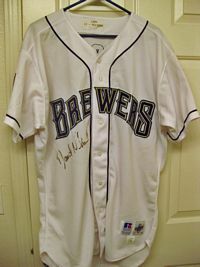 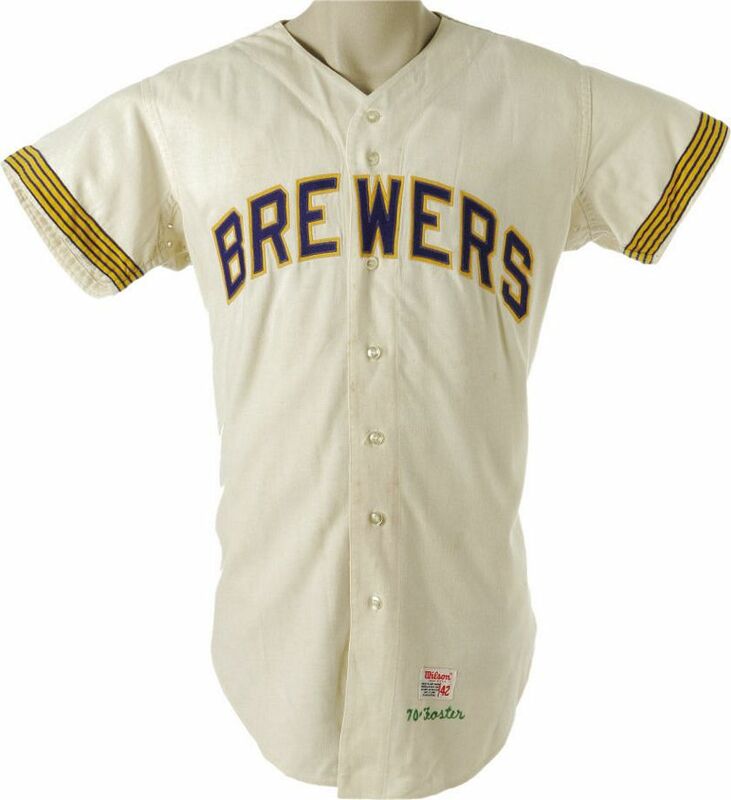 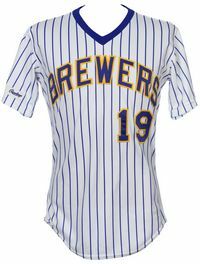 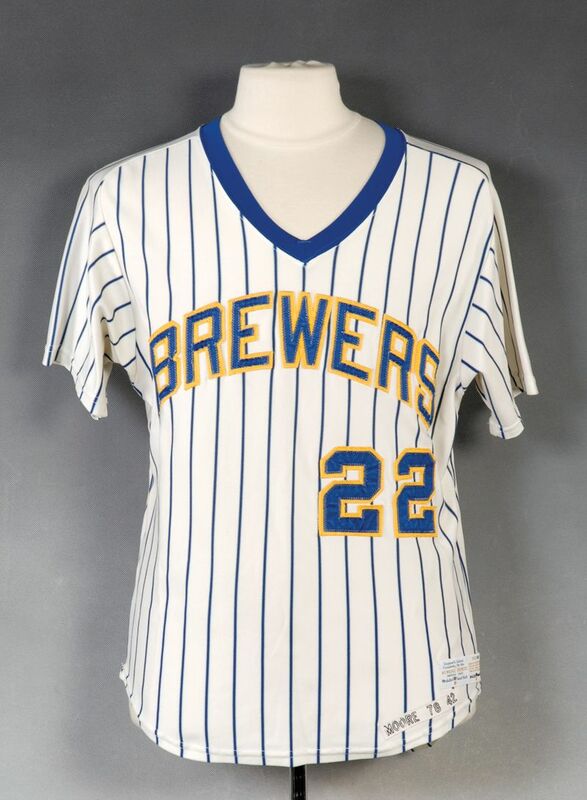 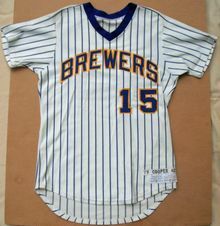 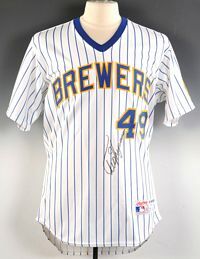 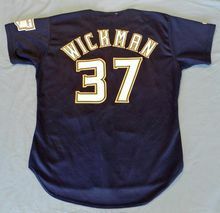 The Brewers strip and recrest a Pilots jersey for this promotional photo. 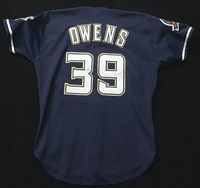 .... and lower on the chest. 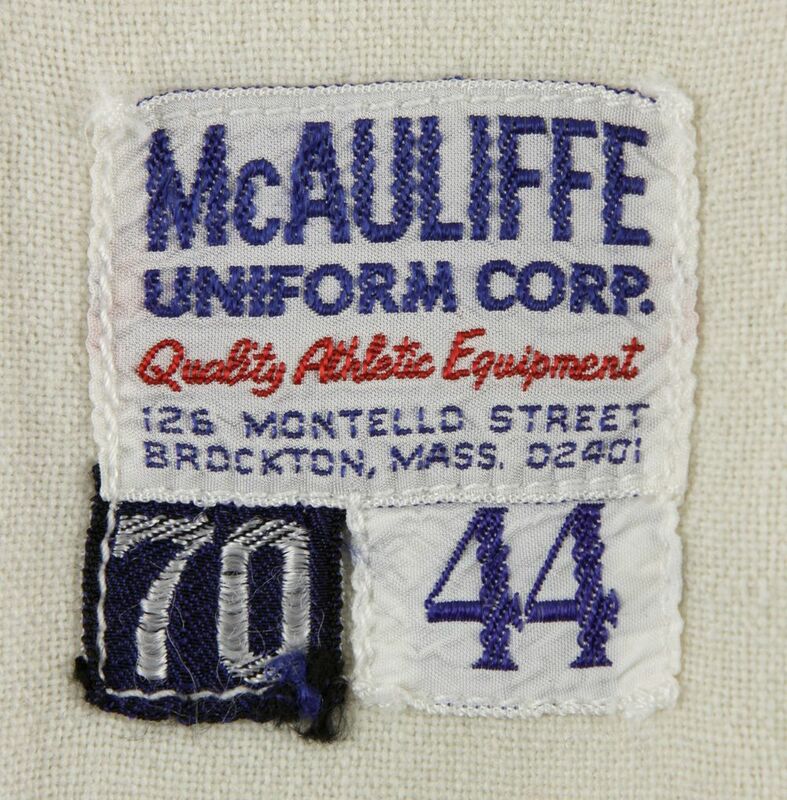 And here's a McAuliffe from 1970, also with lettering high up on the chest. 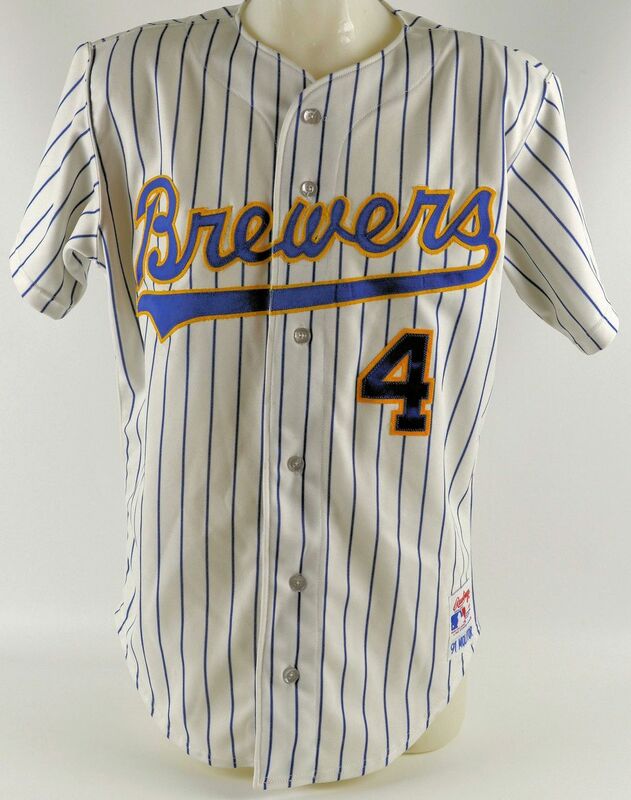 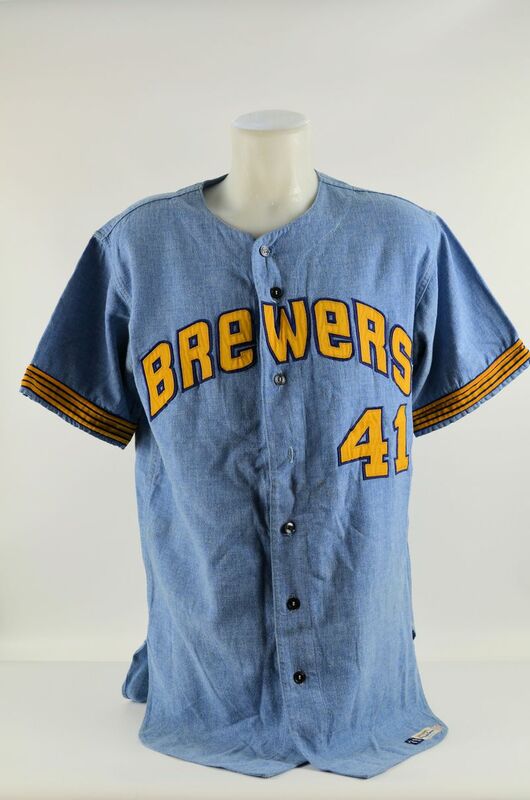 I do not think McAuliffe made a Pilots set and that this is a prototype made for the Brewers and not a recrested Pilots shirt. 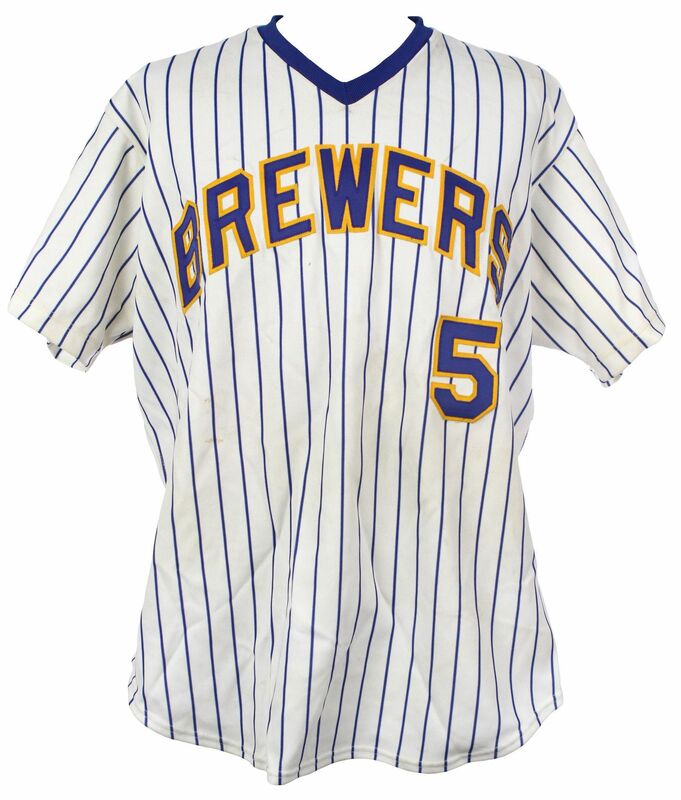 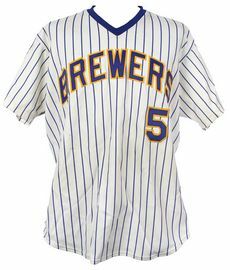 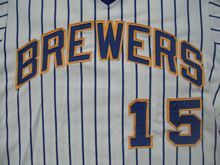 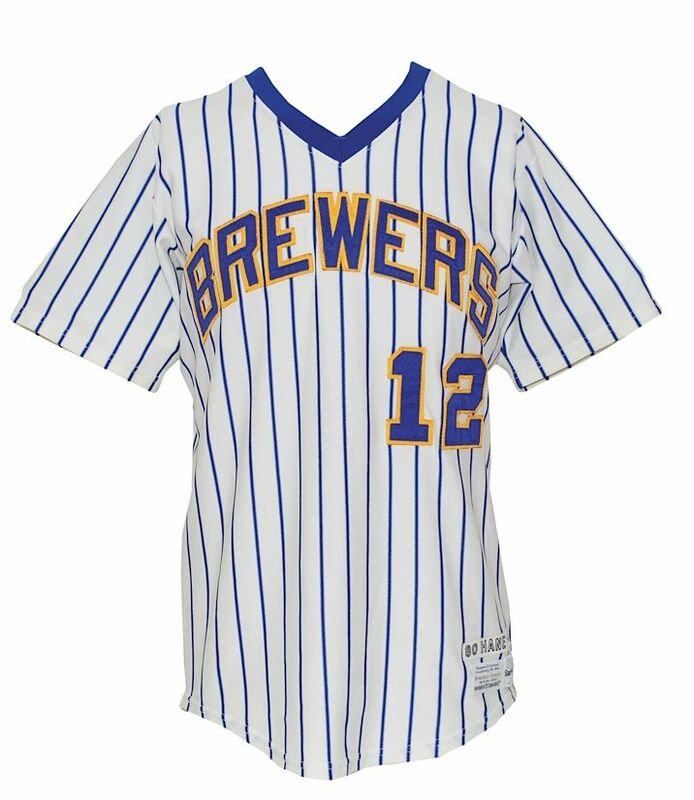 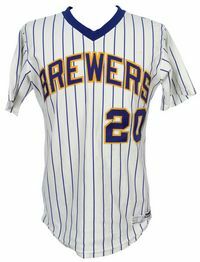 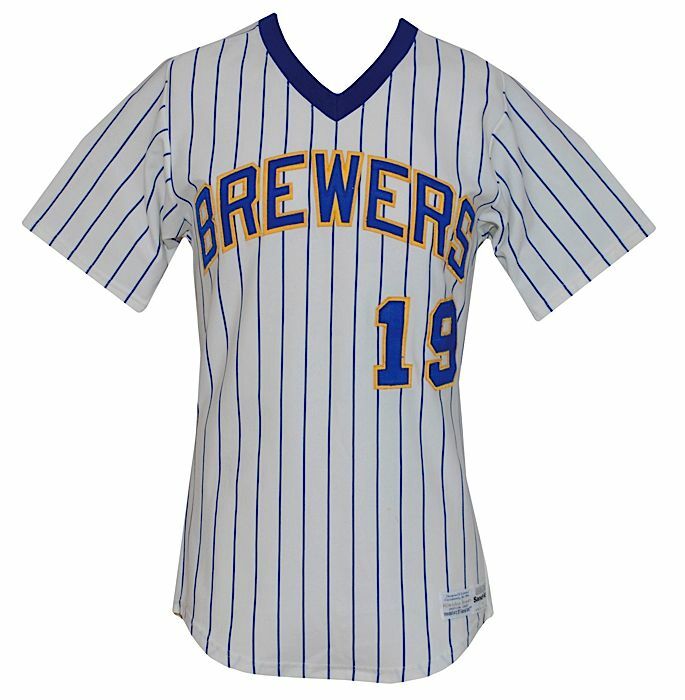 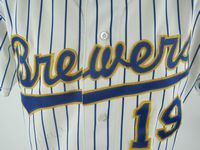 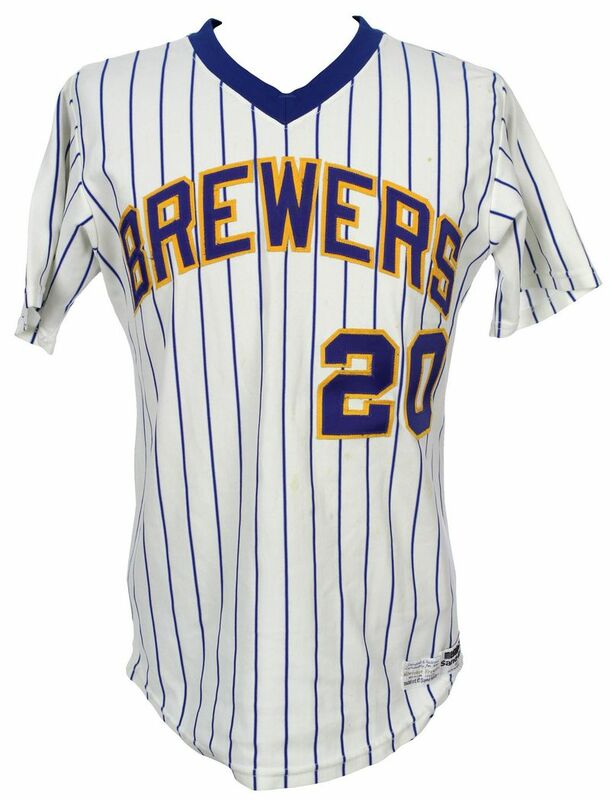 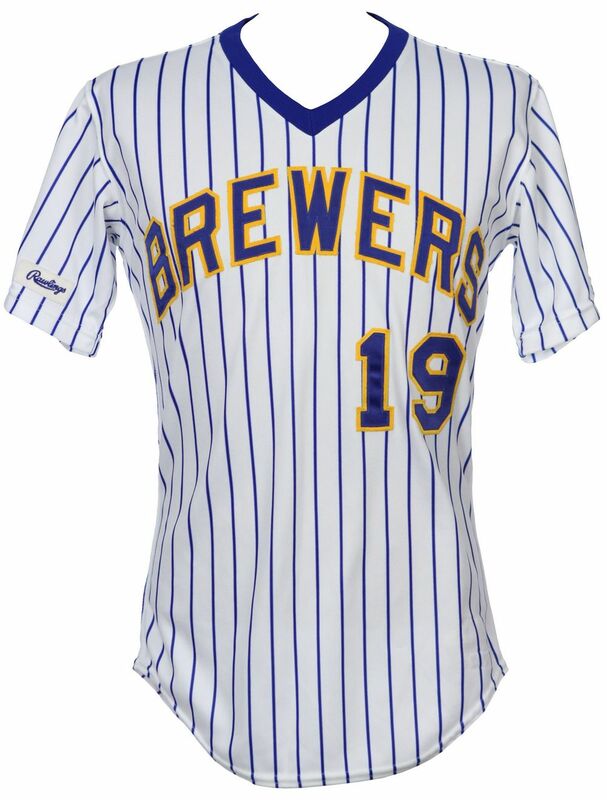 But with time running out, the team simply replaces the Pilots logo with "BREWERS" in block (placement is a bit lower on the chest). 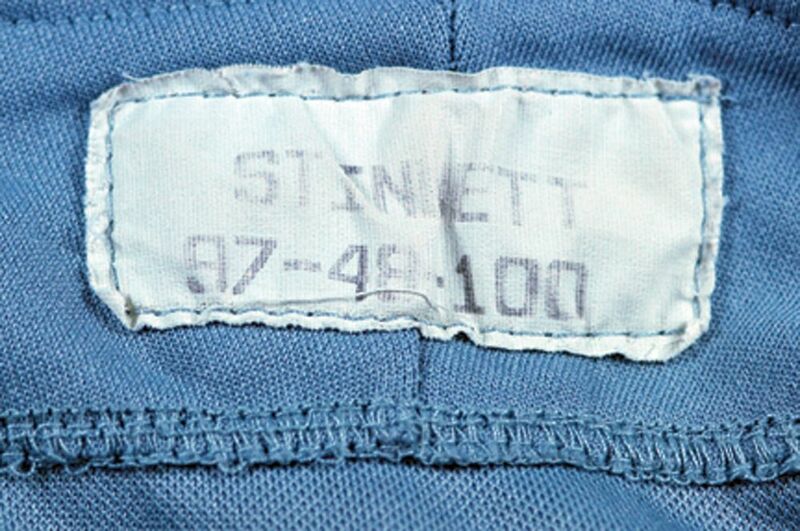 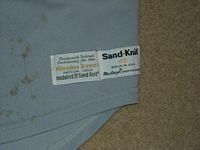 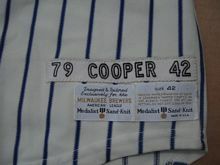 No front number, nautical nine-stripe sleeve cuffs intact. 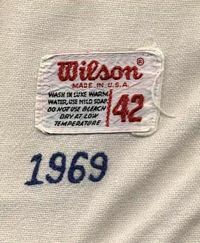 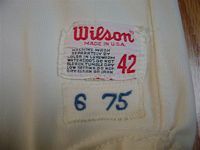 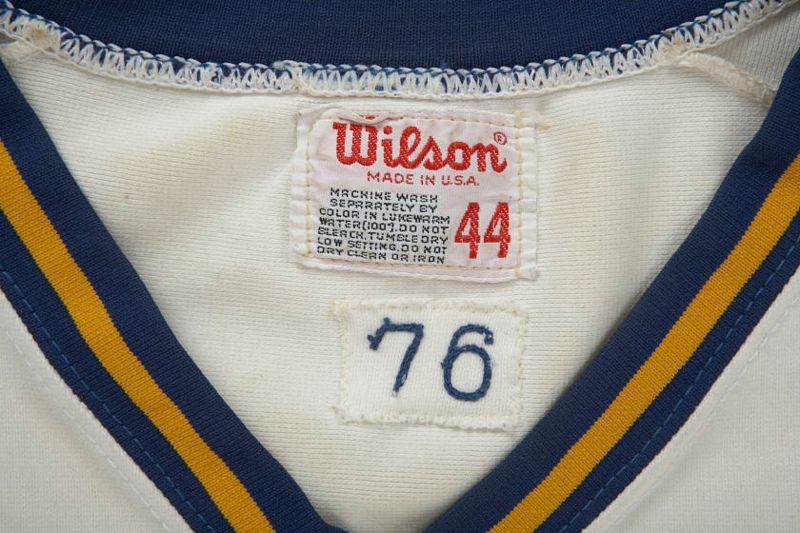 I've only seen Wilson 1970 regular season home jerseys, I've yet to see a McAuliffe. 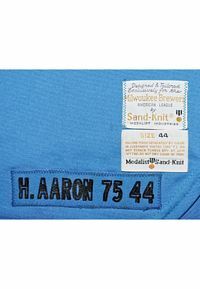 Why the funky mix of uppercase and lowercase letters on the road shirt? 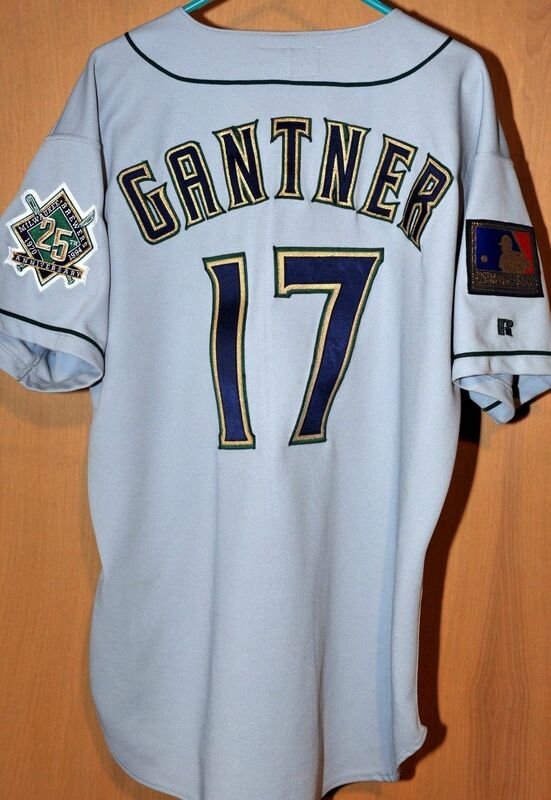 Because they re-used the "s" and the two "e's" from "seattle". 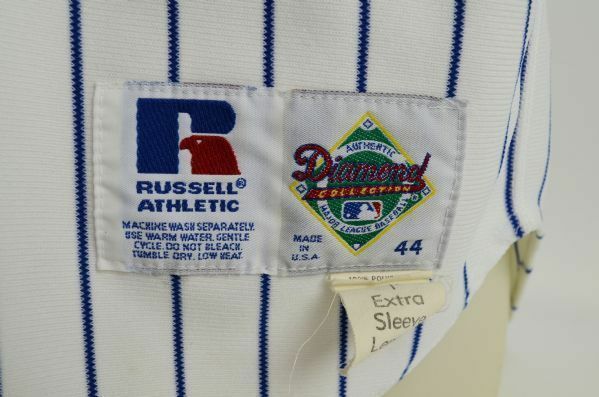 That way they only needed B, W, and two R's. 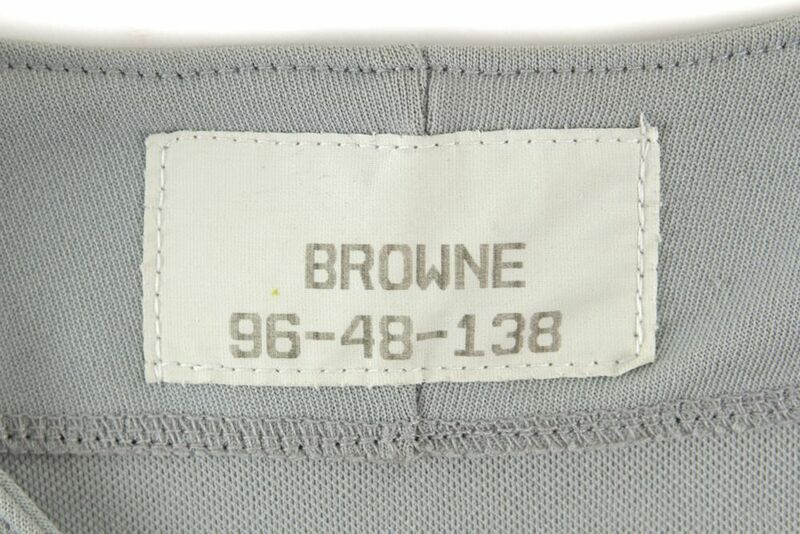 But why use uppercase letters for those, and not lowercase to match? 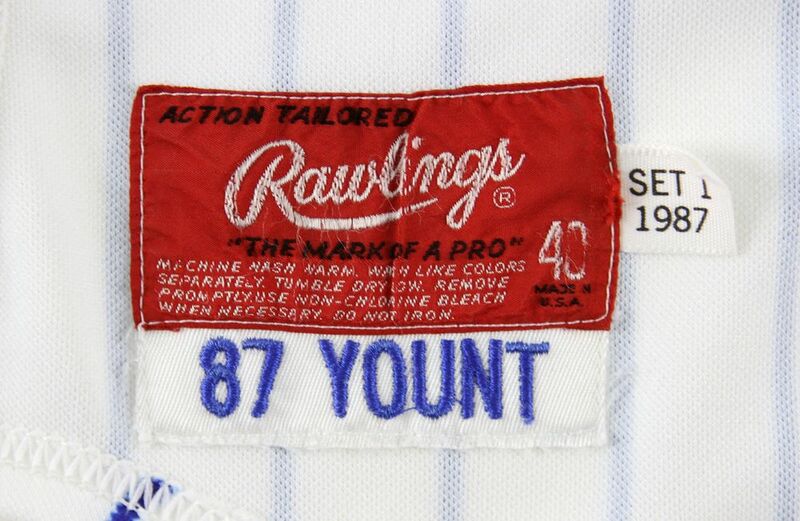 My guess - probably only uppercase letters were in stock and they were too cheap to make a batch of lowercase letters. 1971 home shirts get the front number and single sleeve stripe. 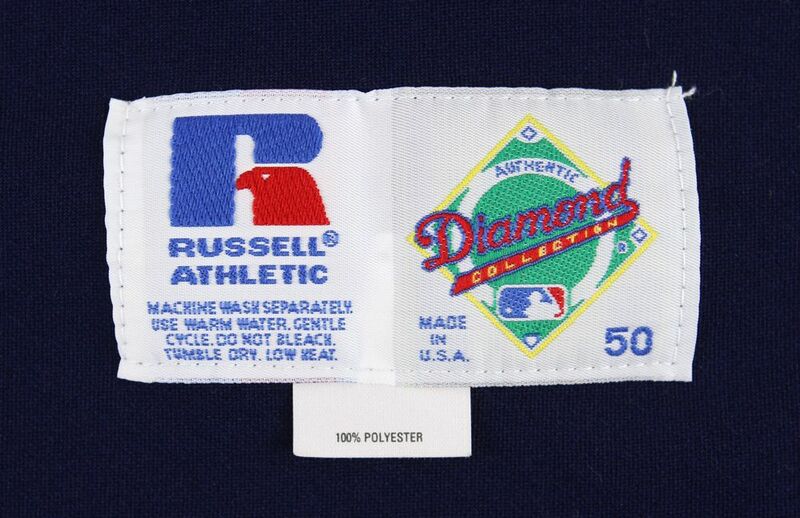 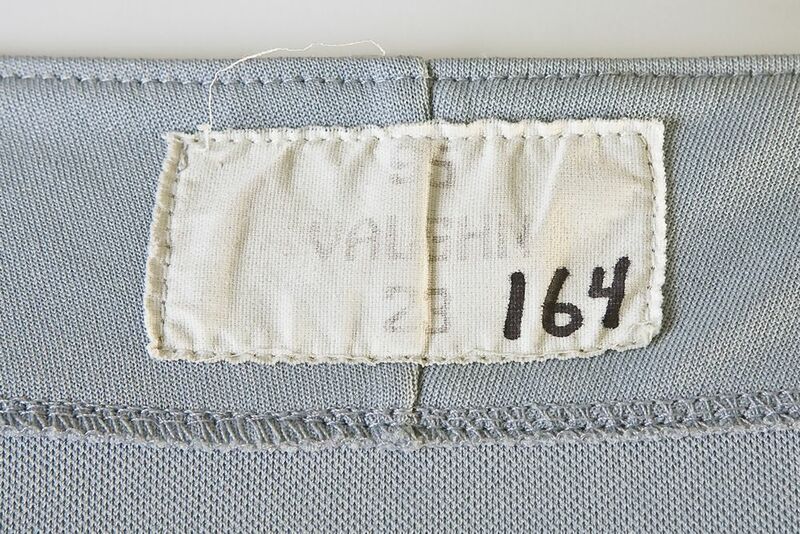 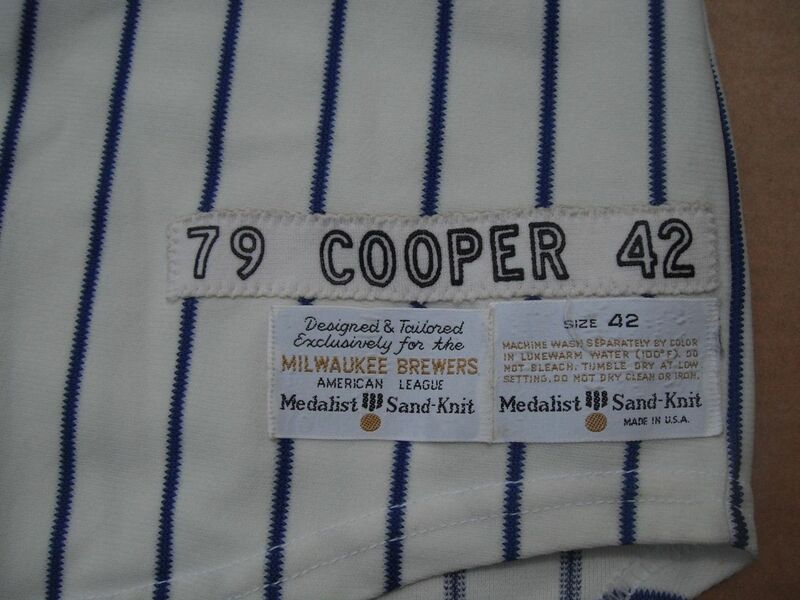 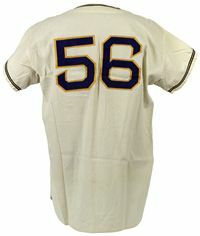 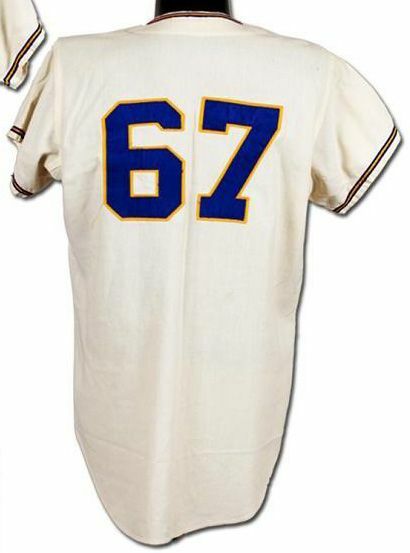 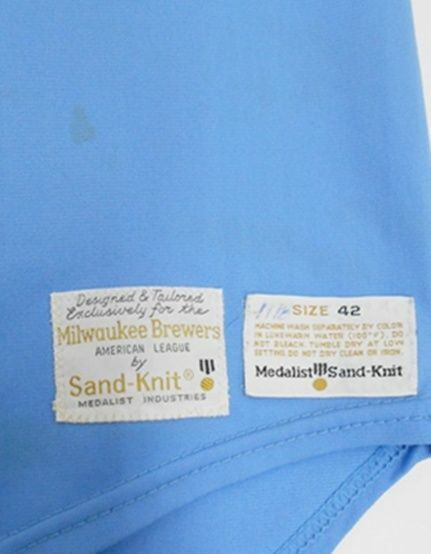 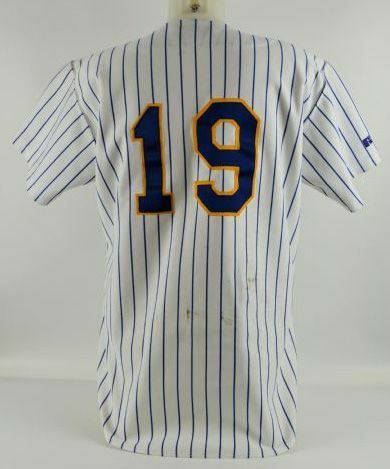 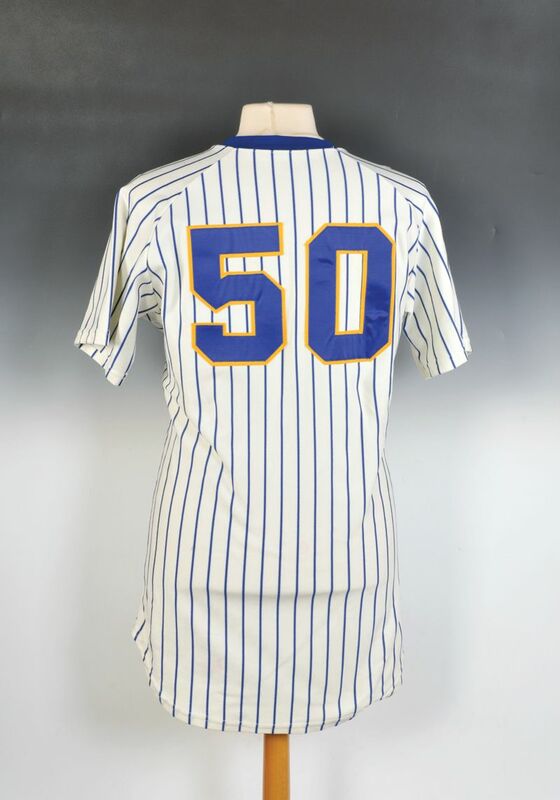 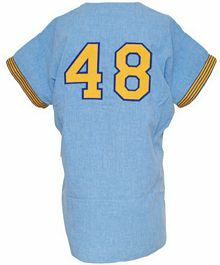 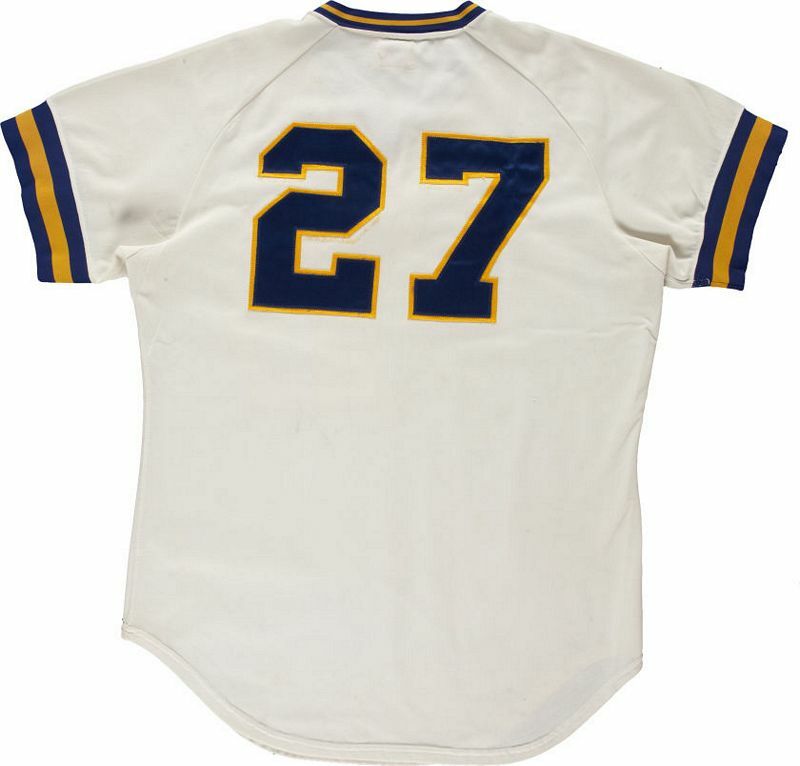 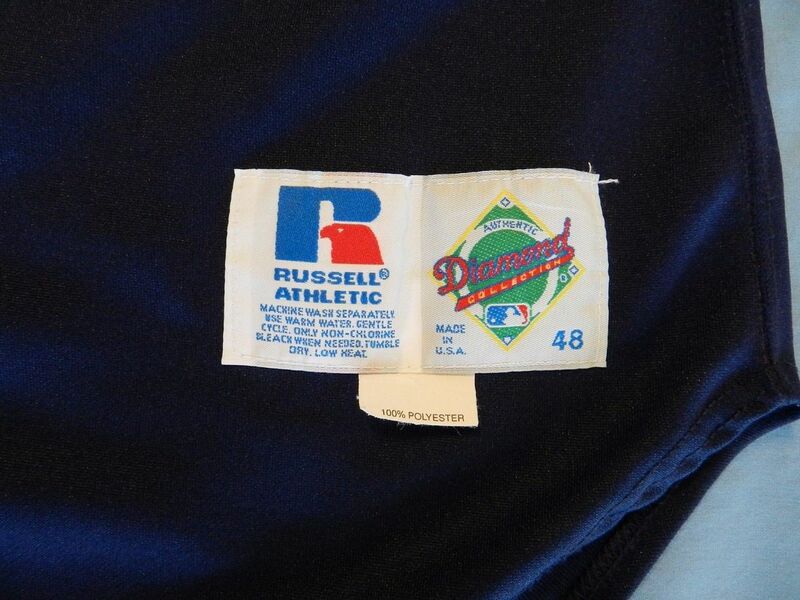 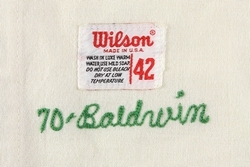 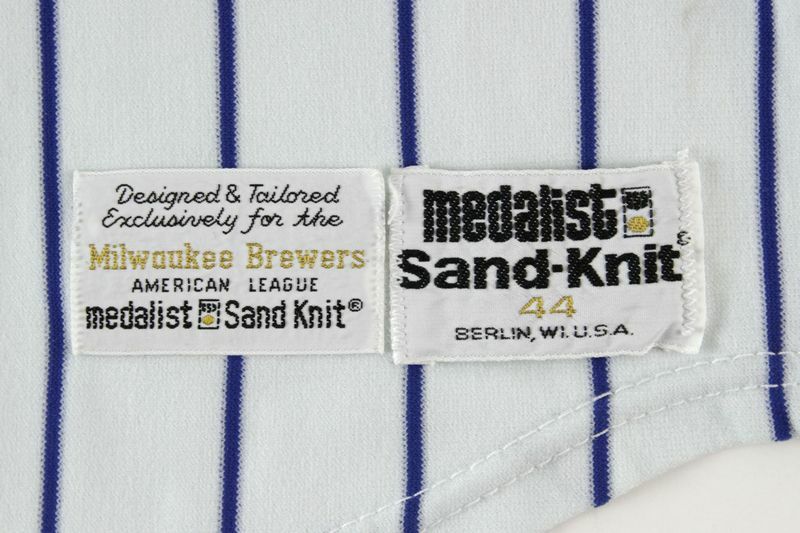 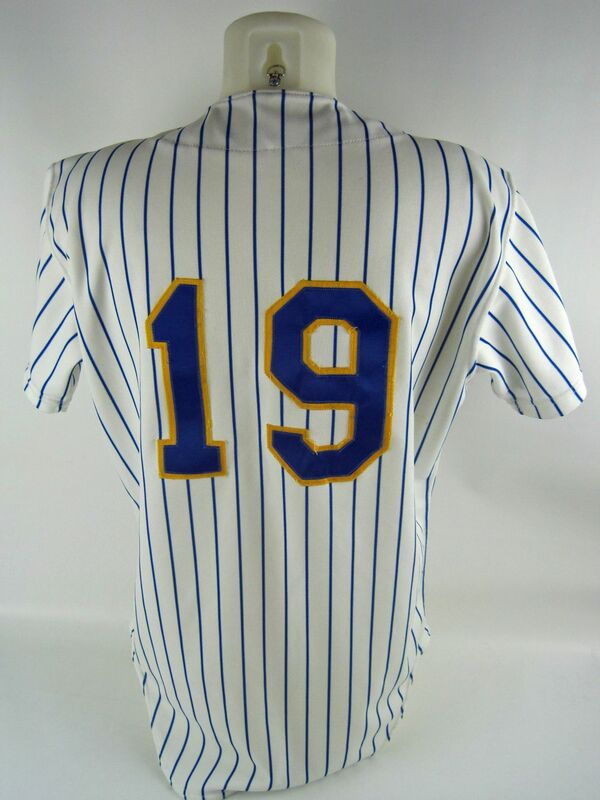 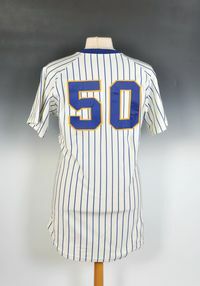 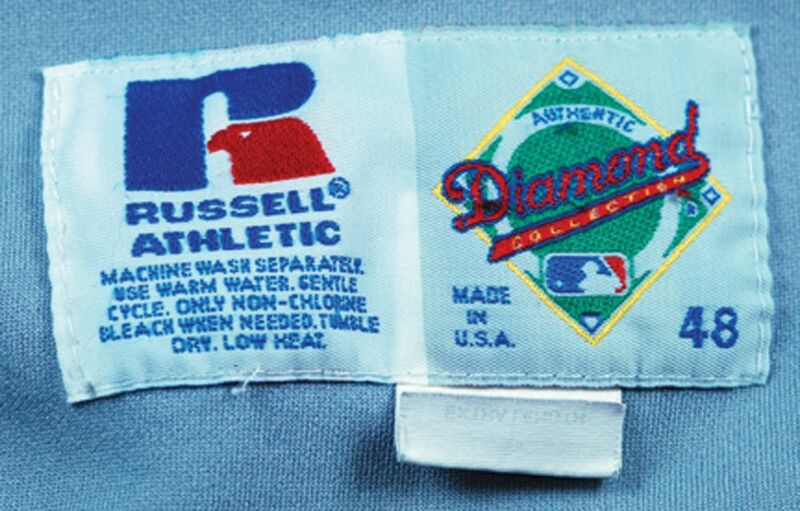 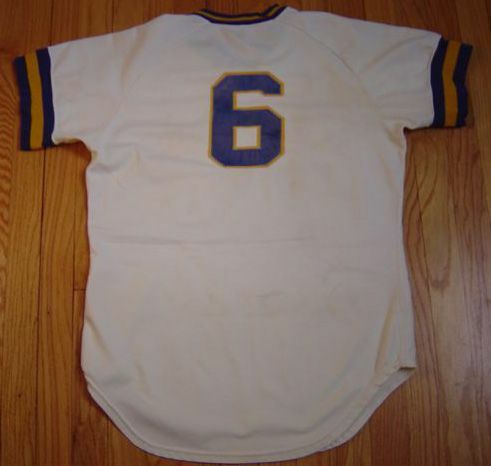 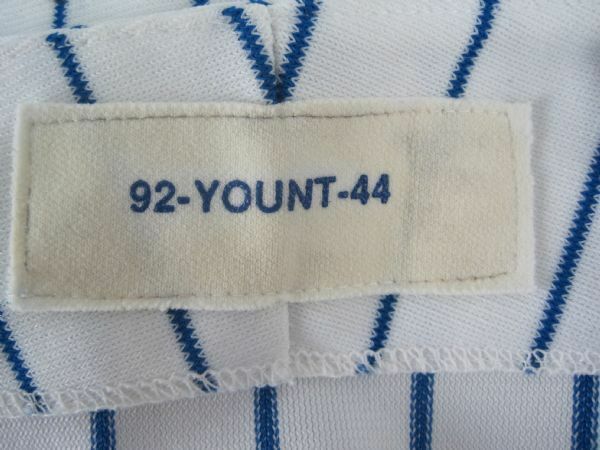 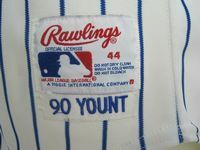 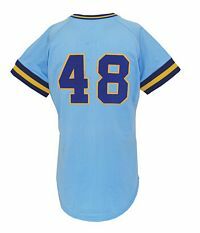 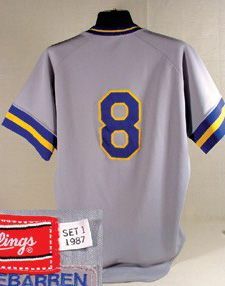 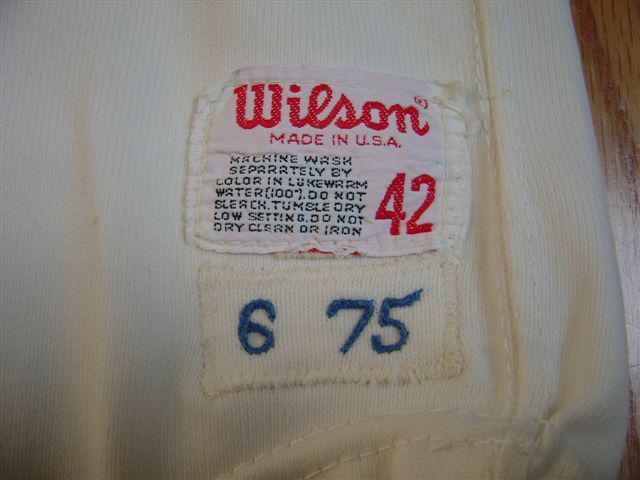 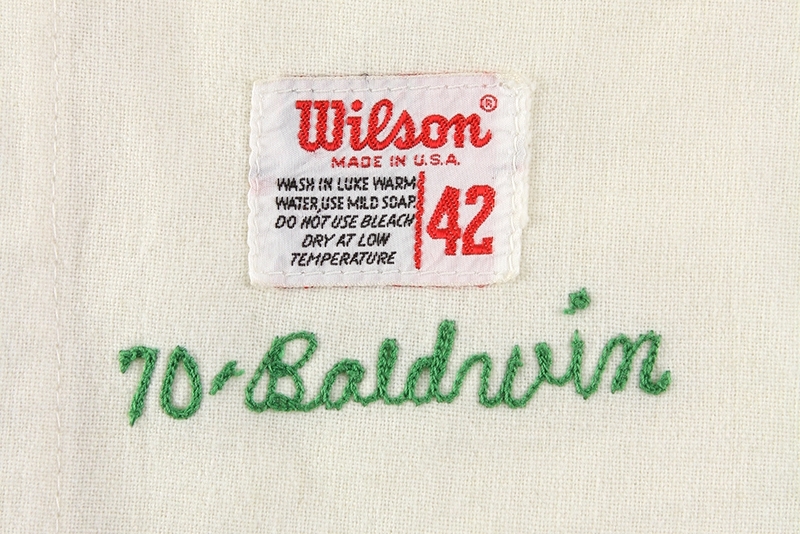 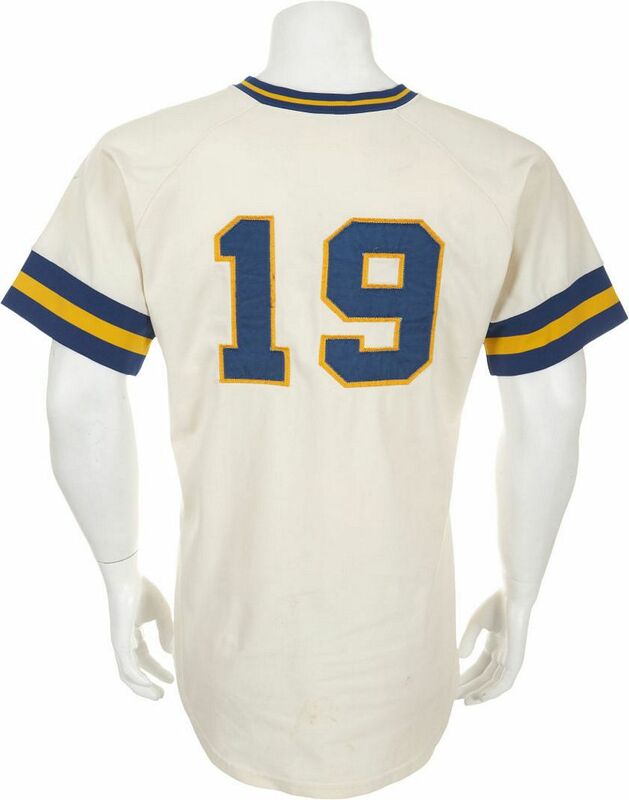 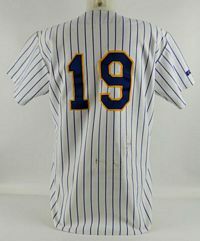 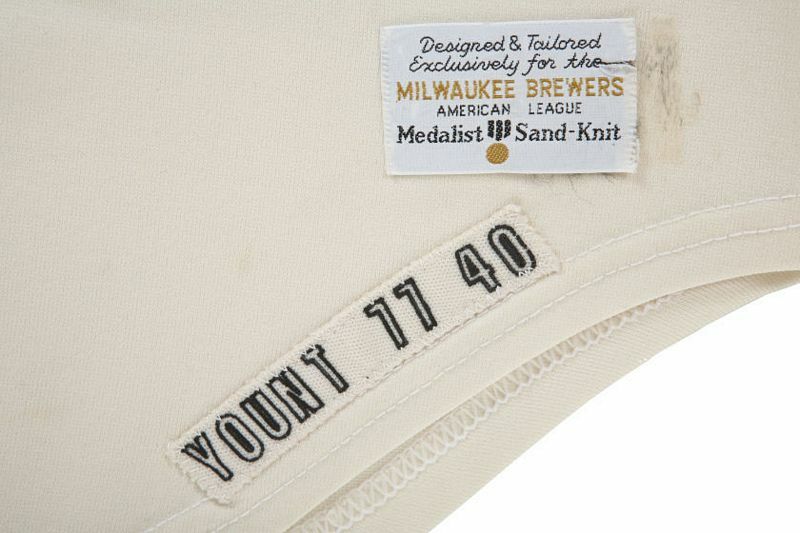 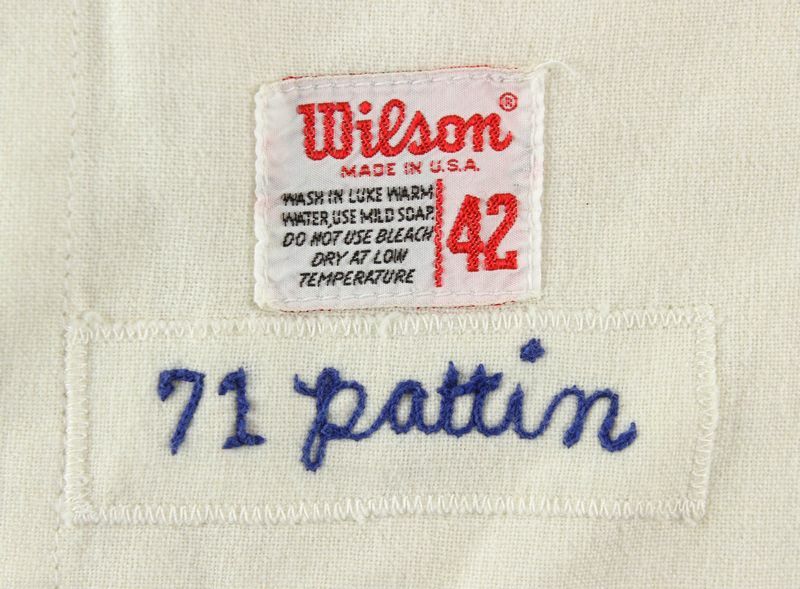 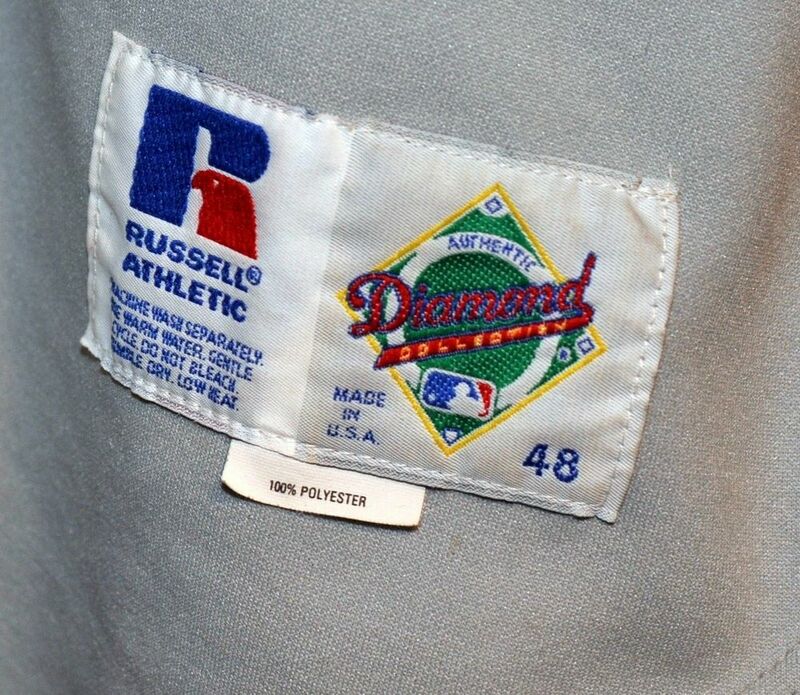 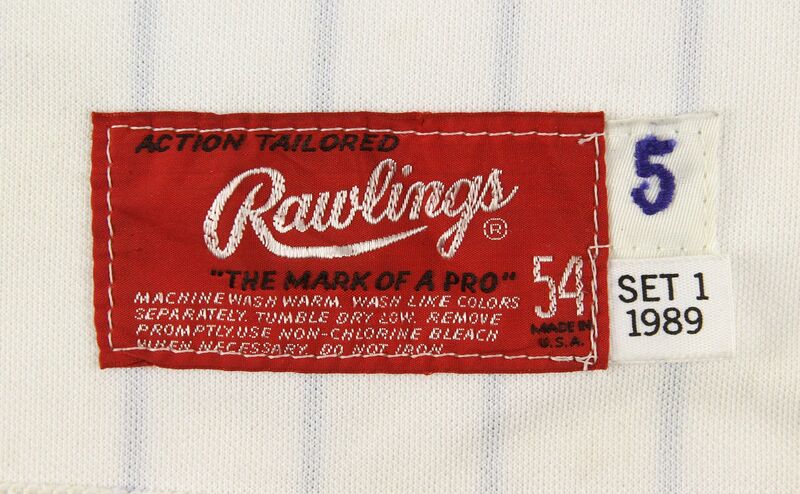 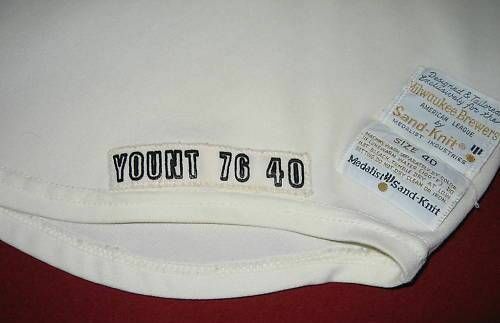 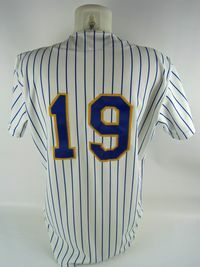 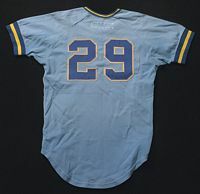 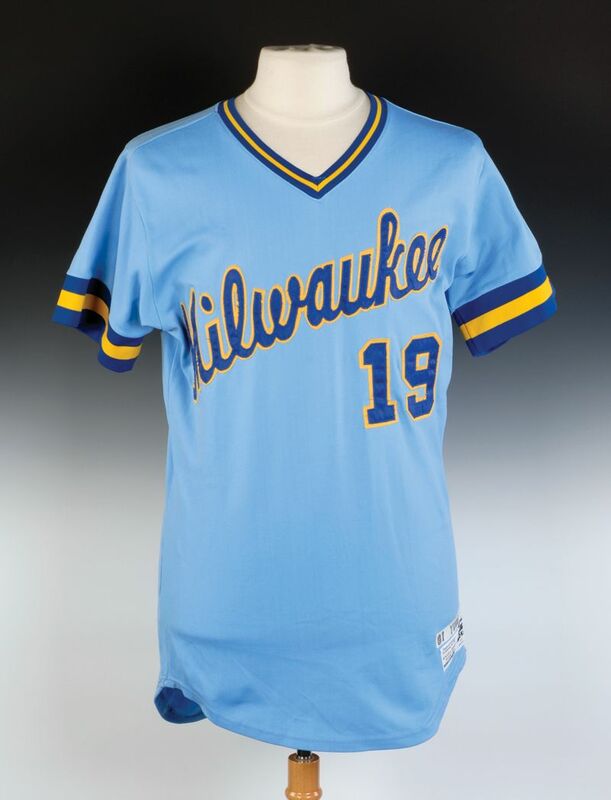 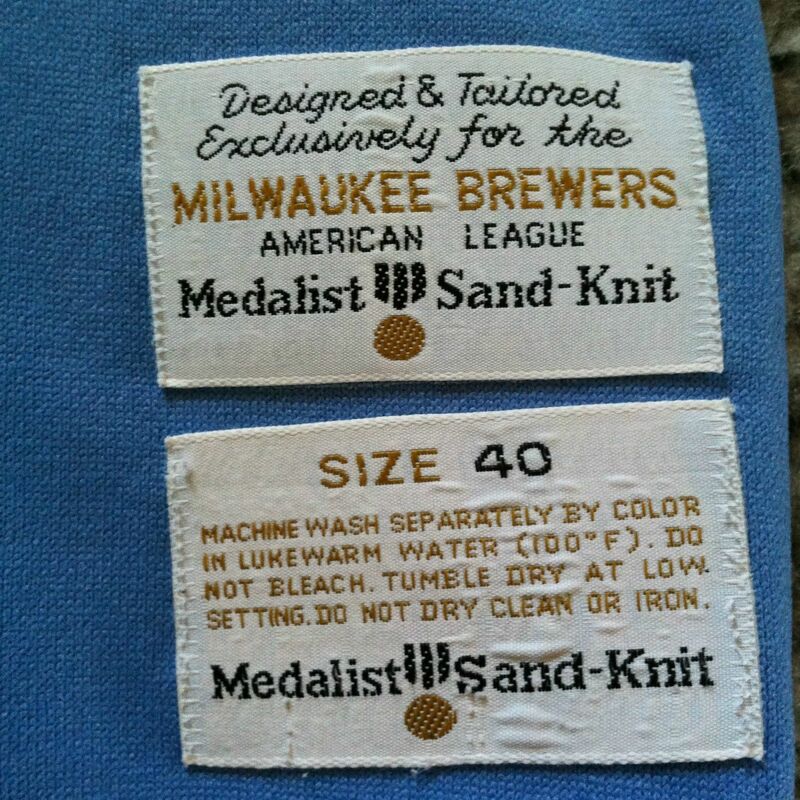 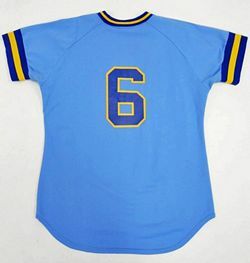 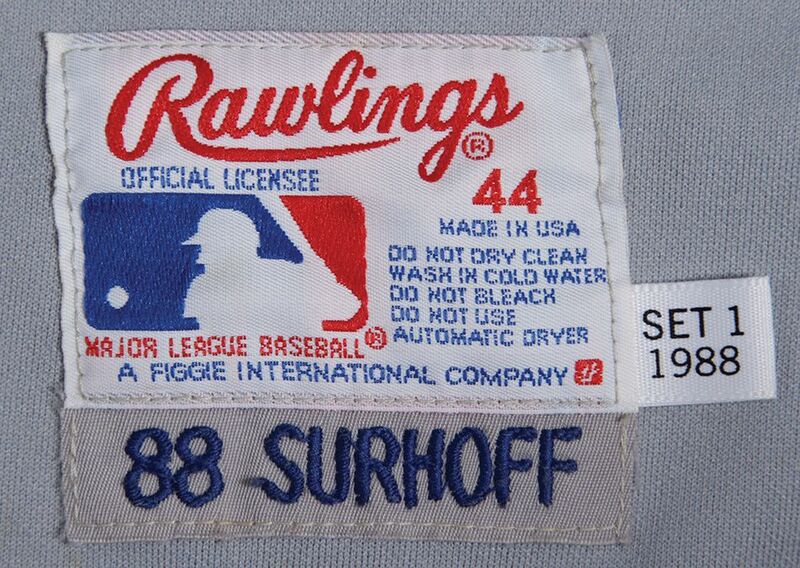 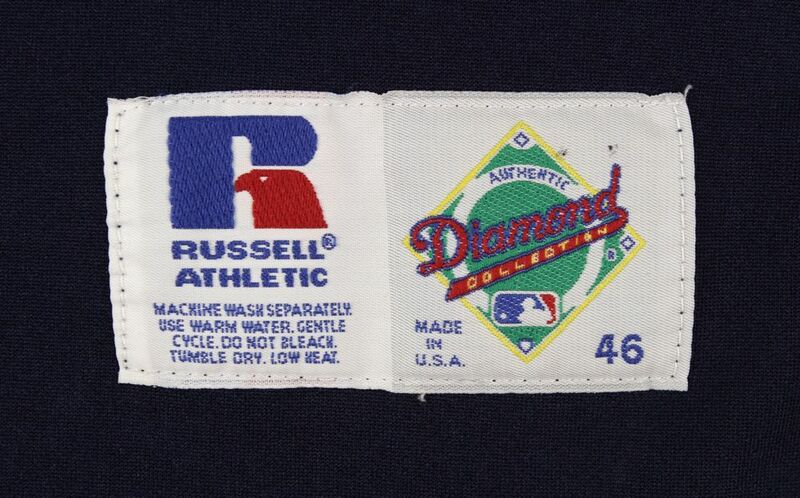 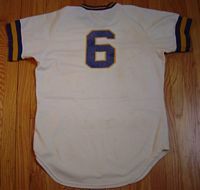 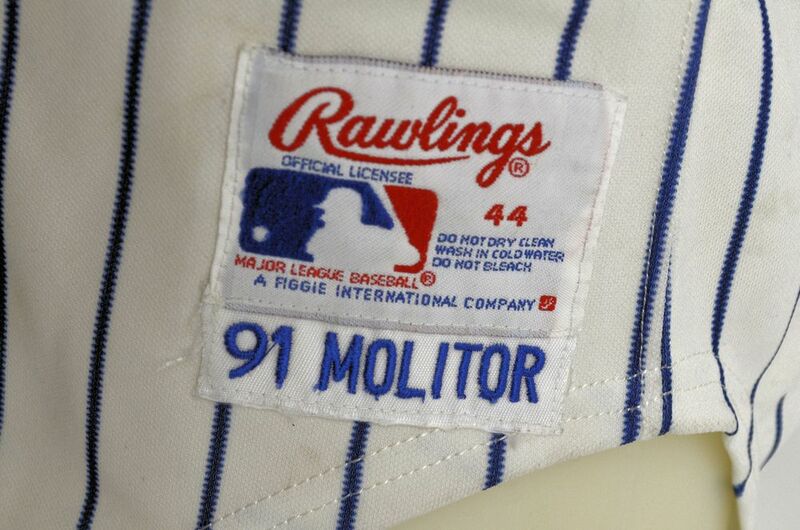 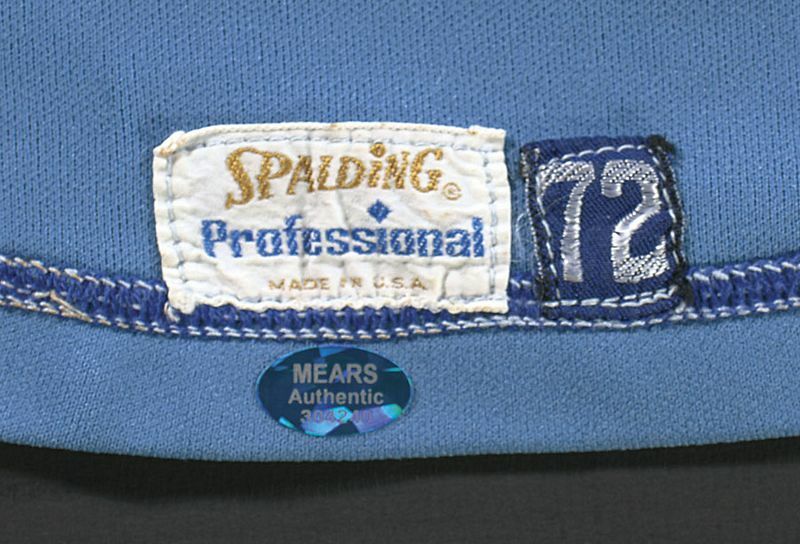 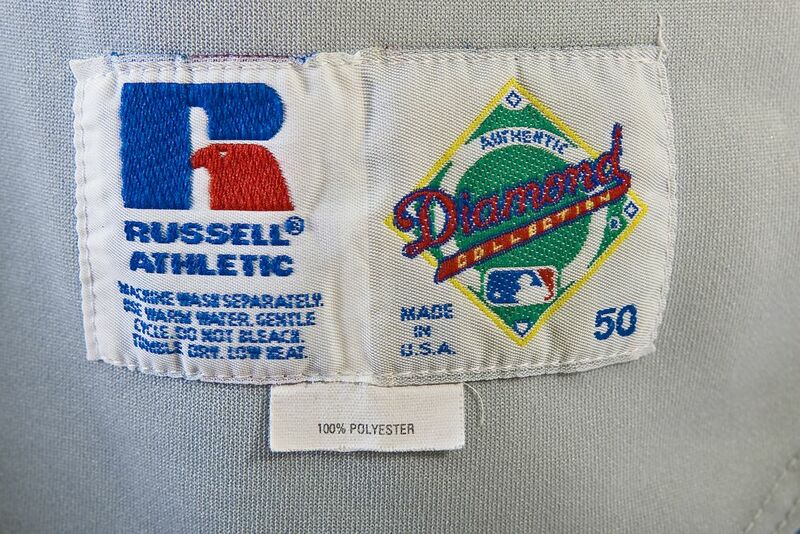 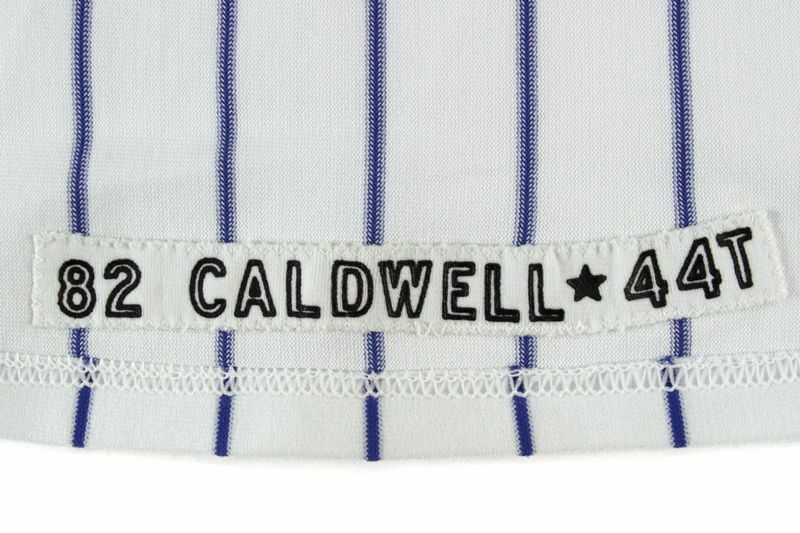 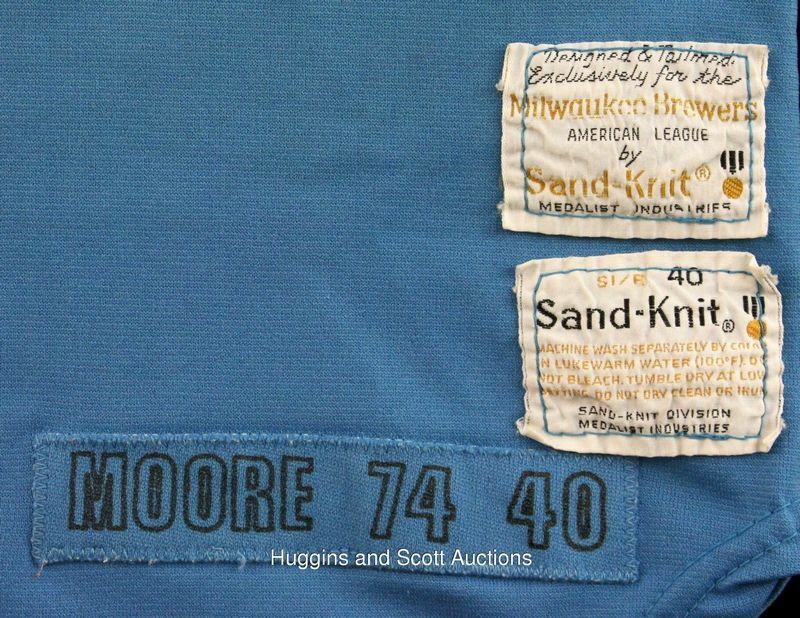 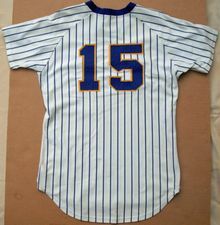 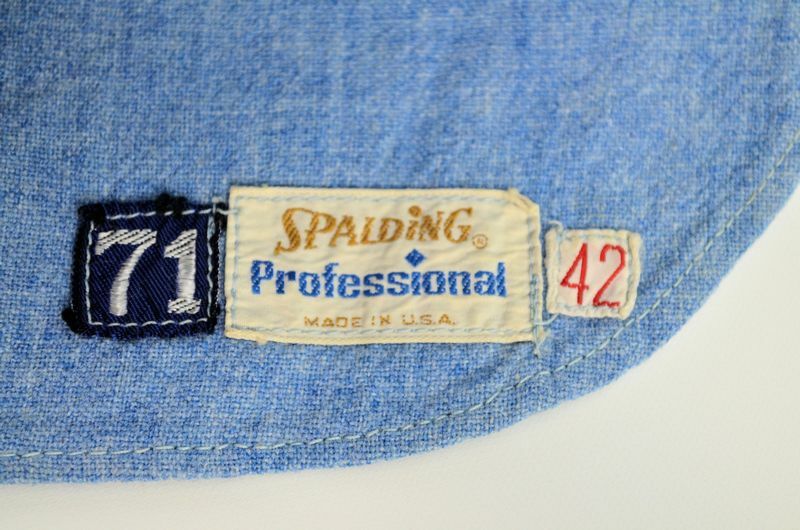 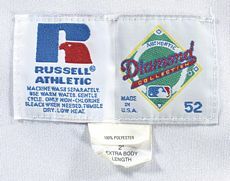 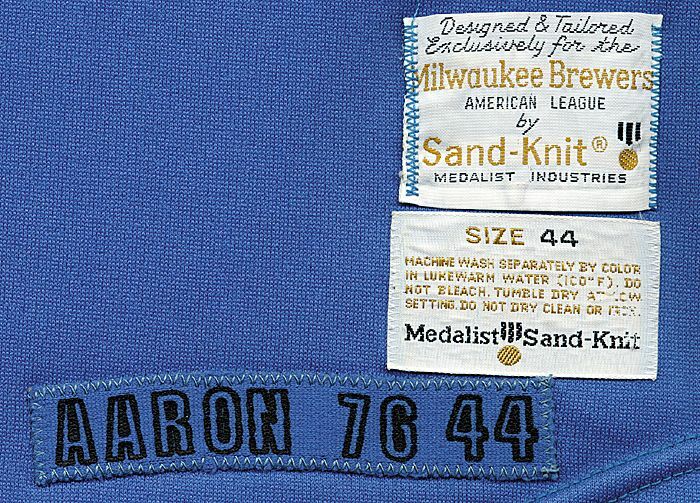 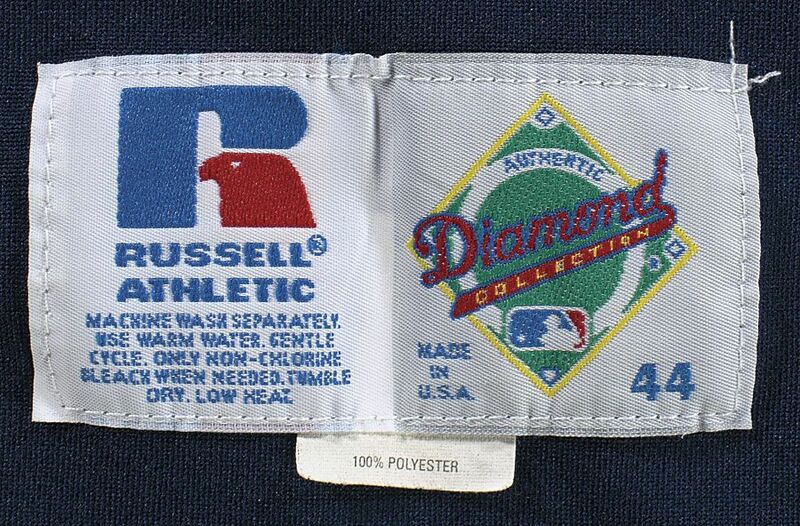 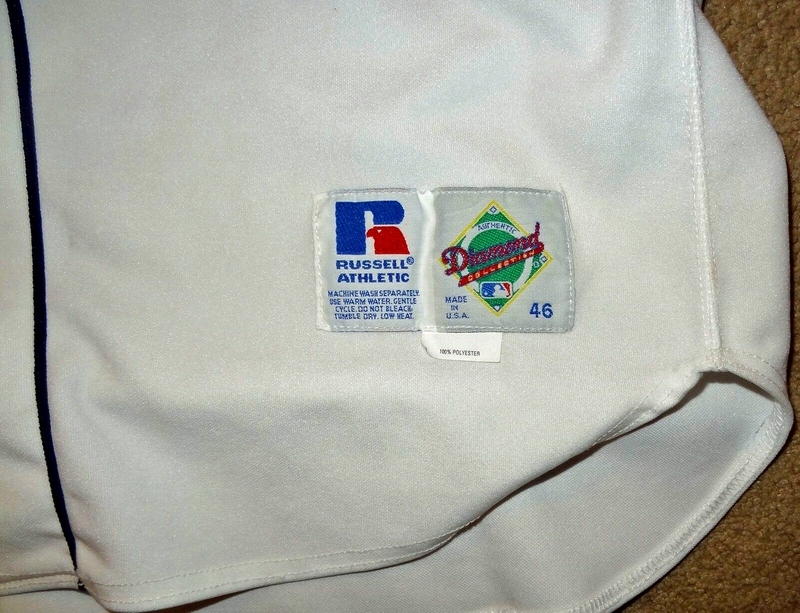 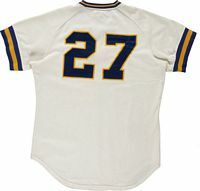 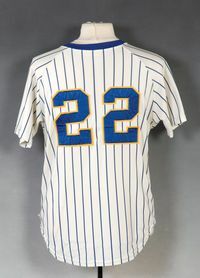 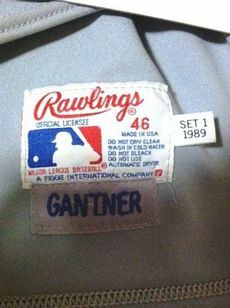 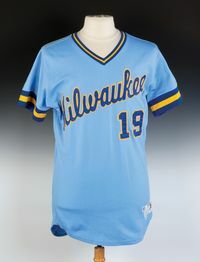 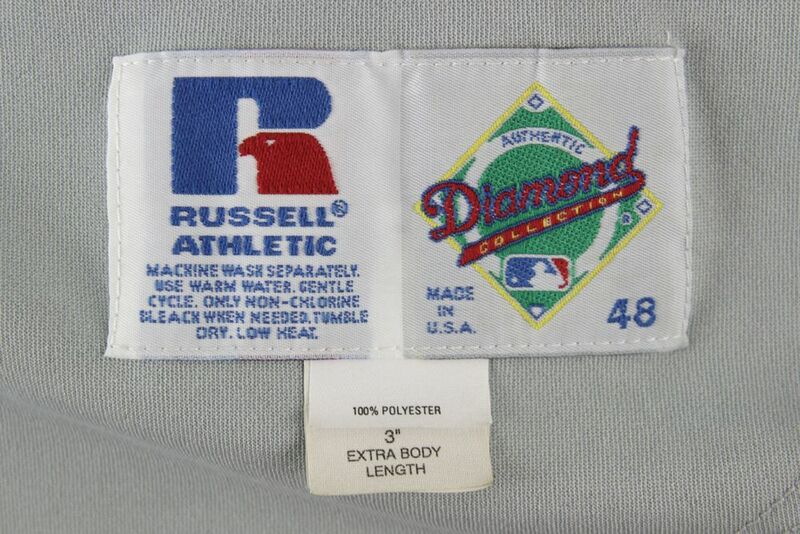 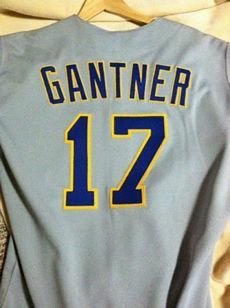 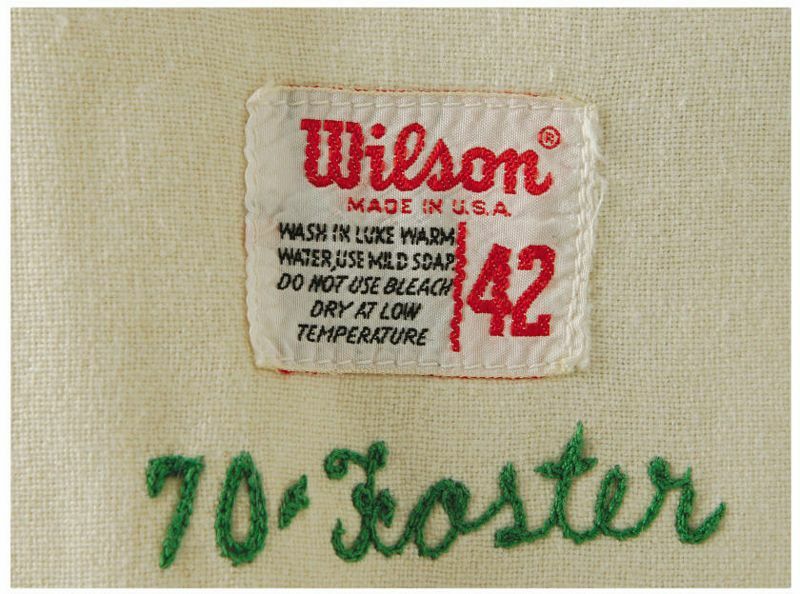 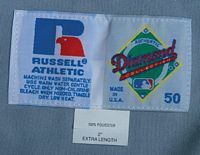 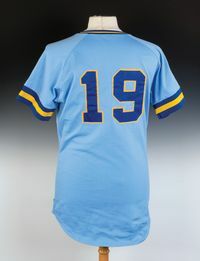 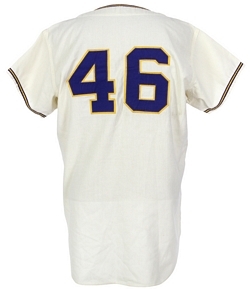 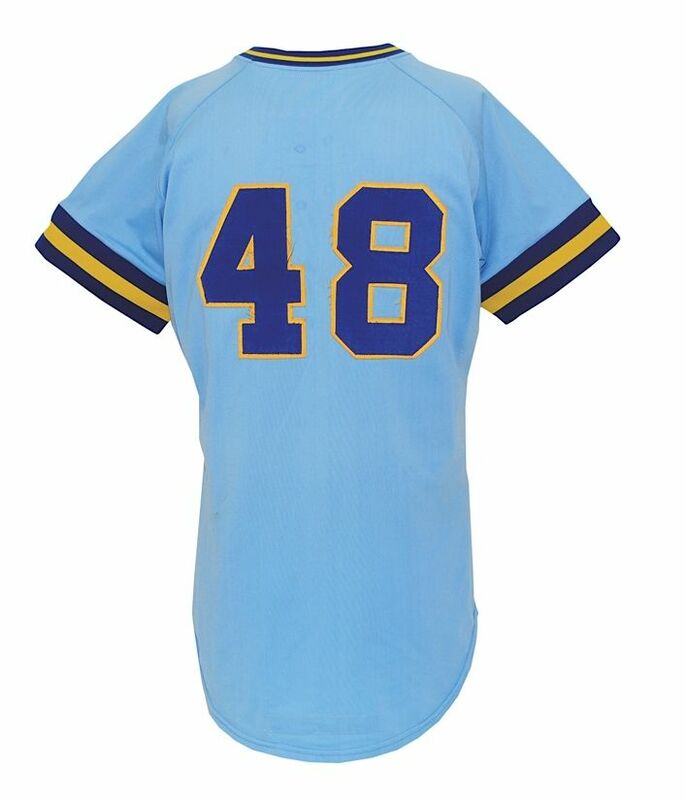 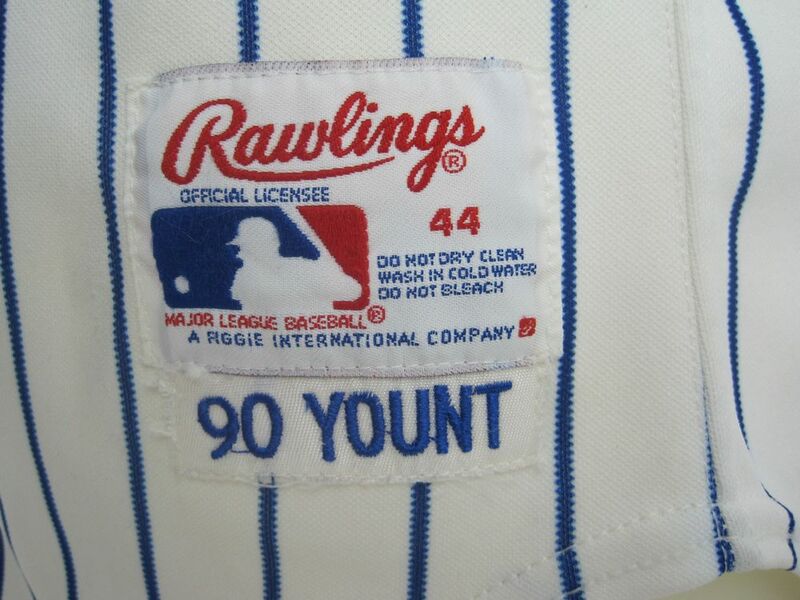 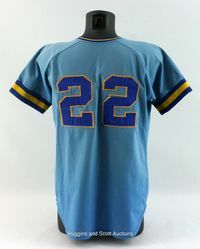 Front numbers are added to some 1970 jerseys for reuse in 1971. And who knows, maybe some of the 1969 shirts shown above were used in 1971 too. 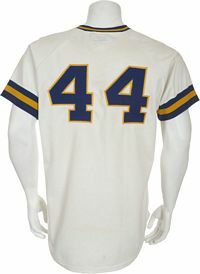 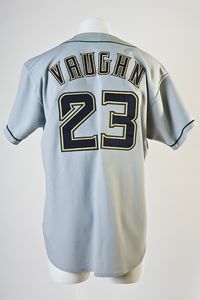 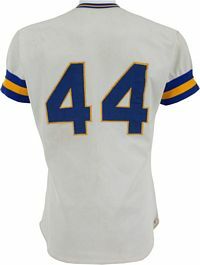 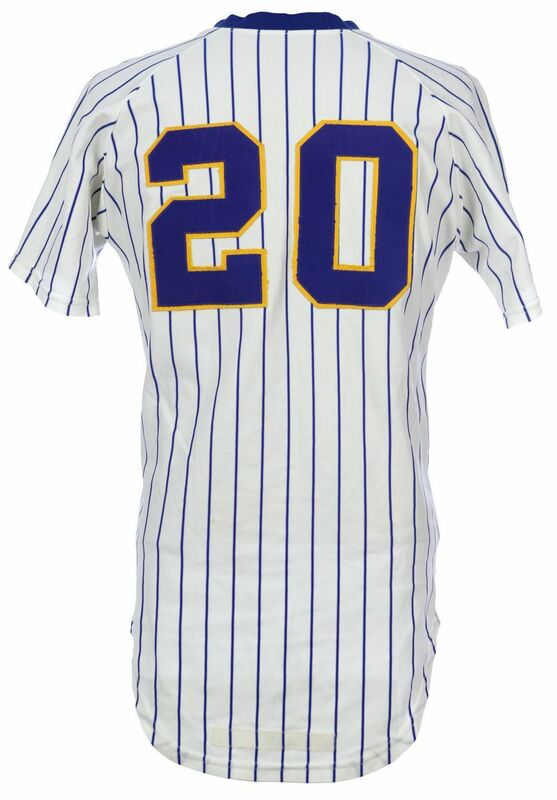 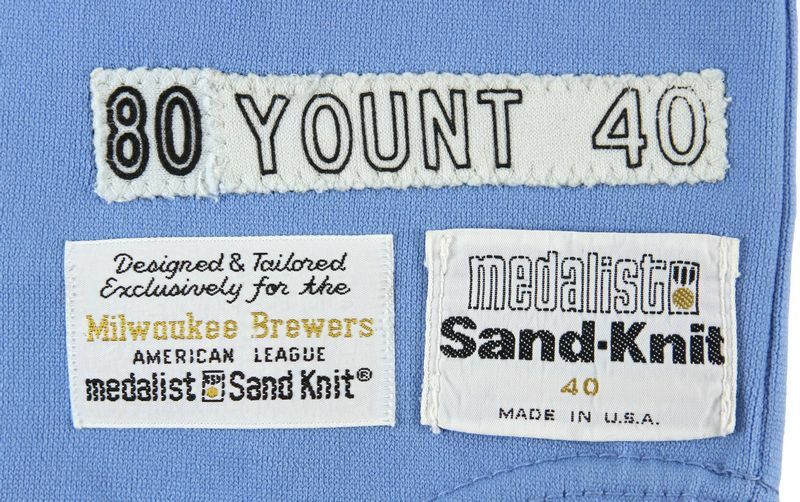 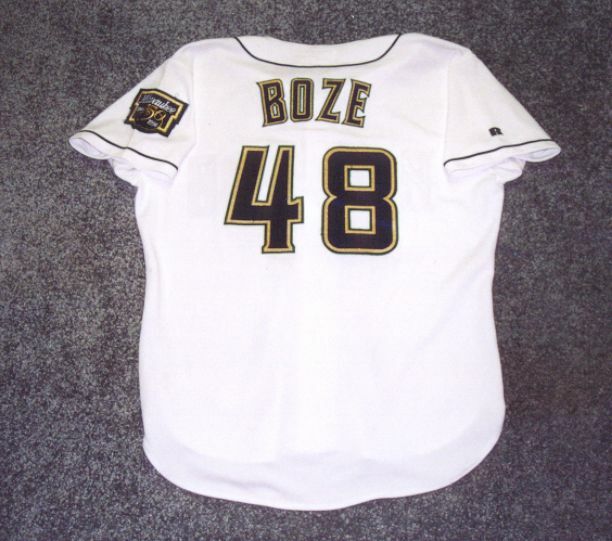 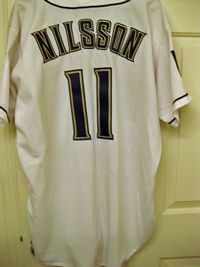 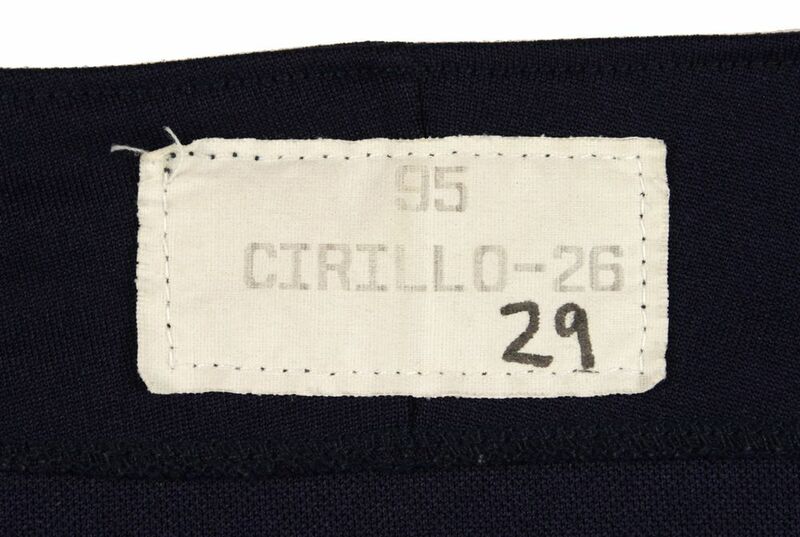 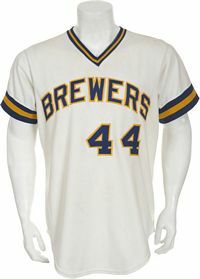 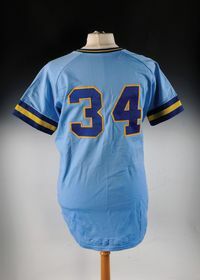 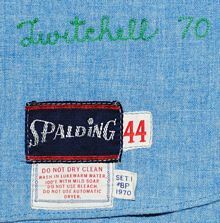 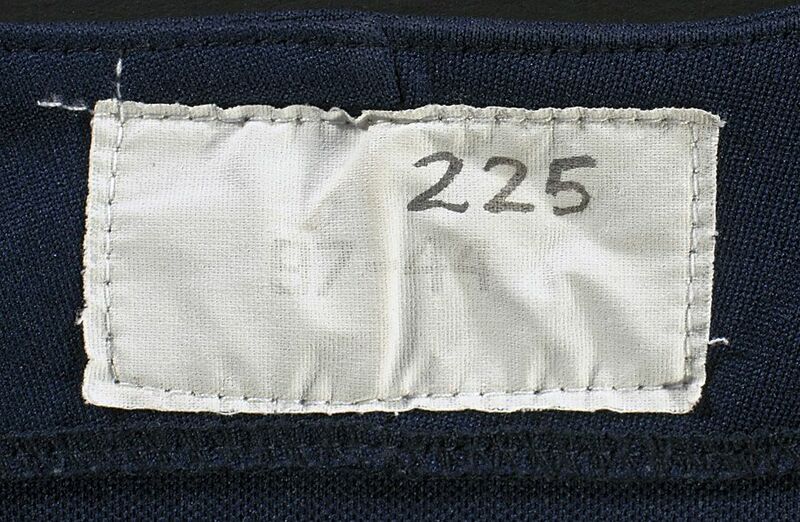 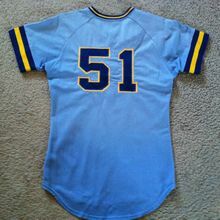 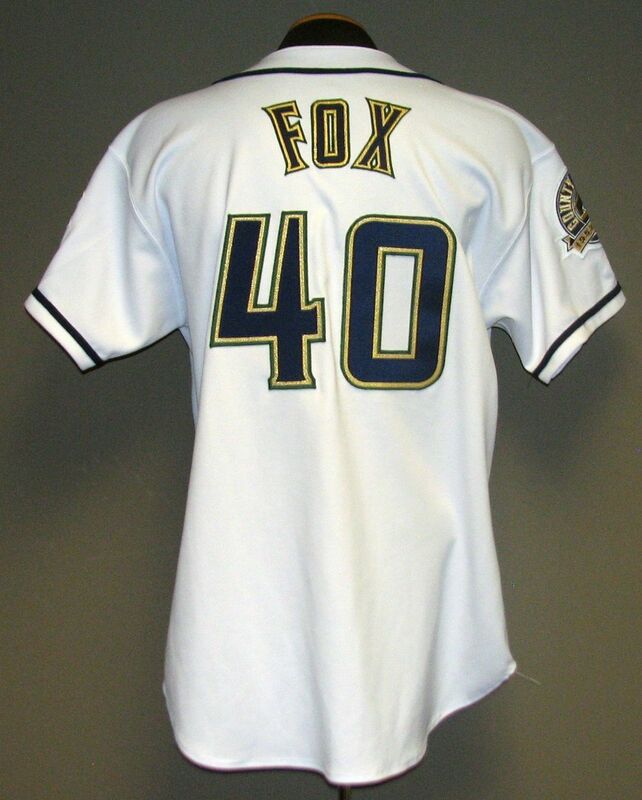 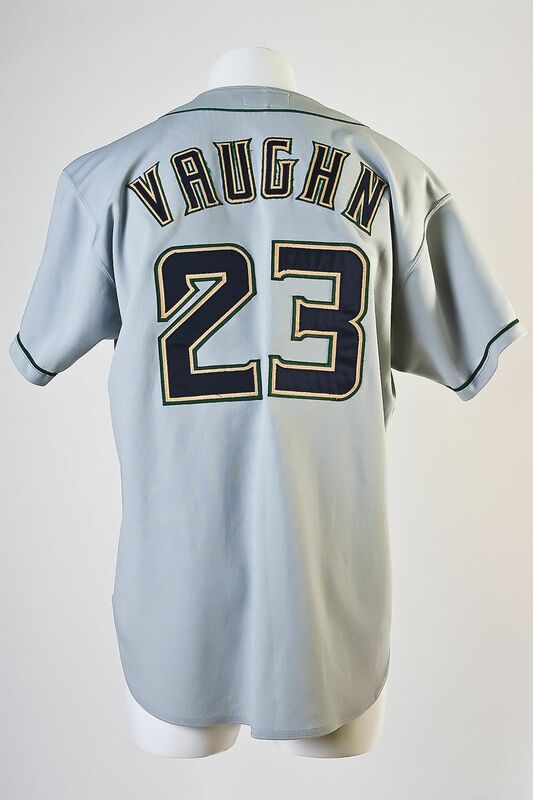 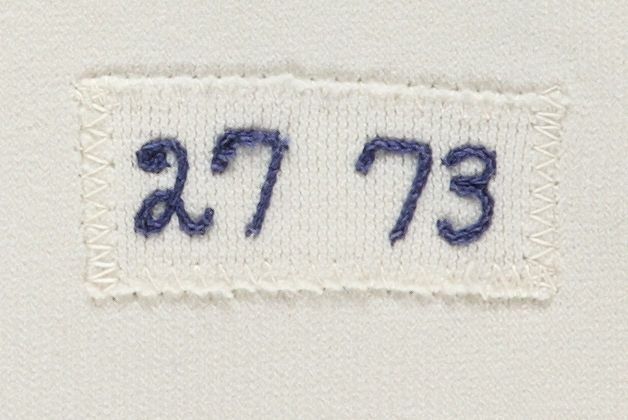 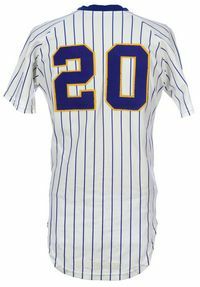 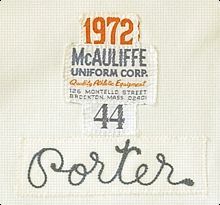 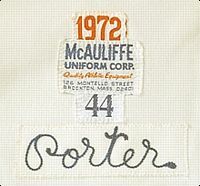 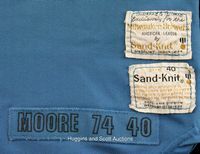 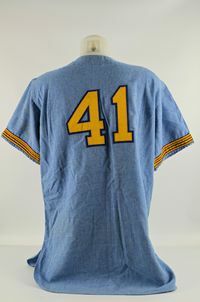 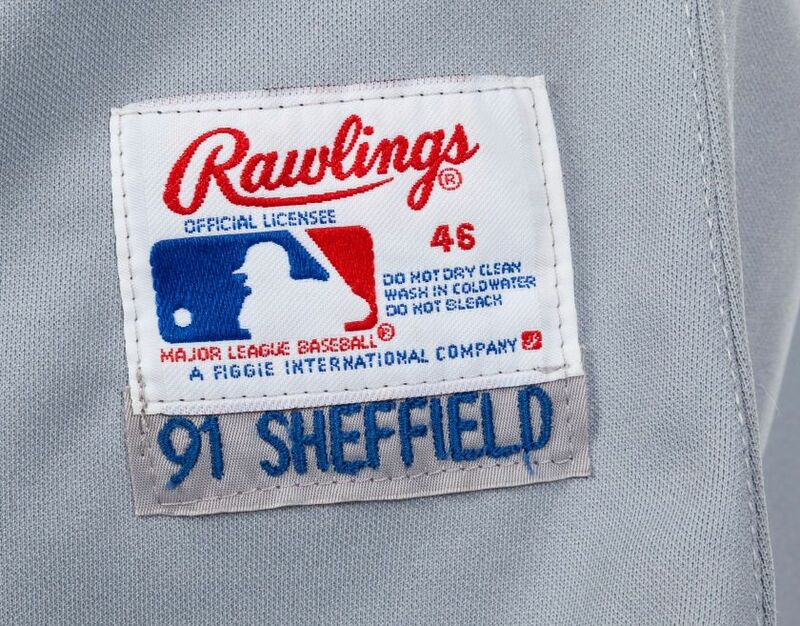 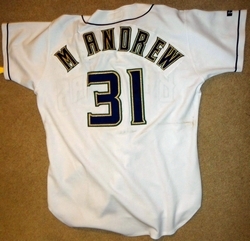 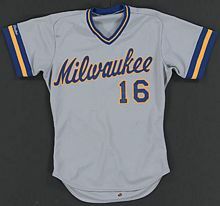 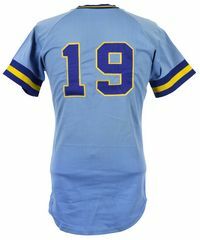 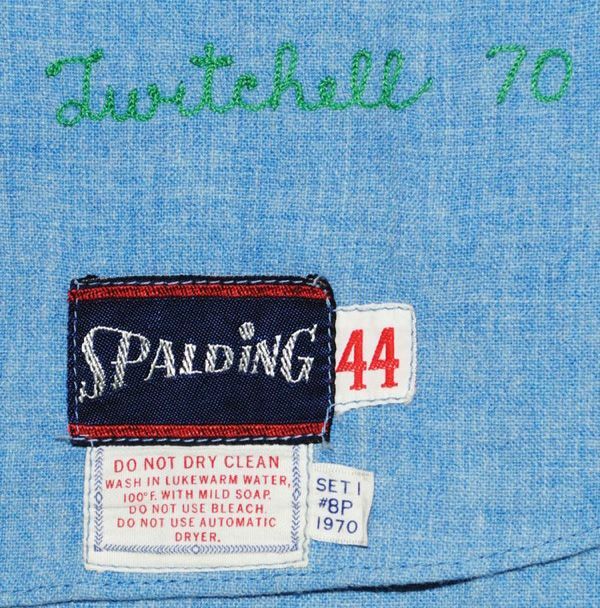 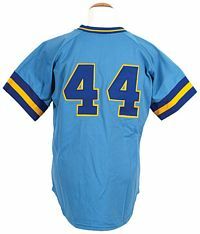 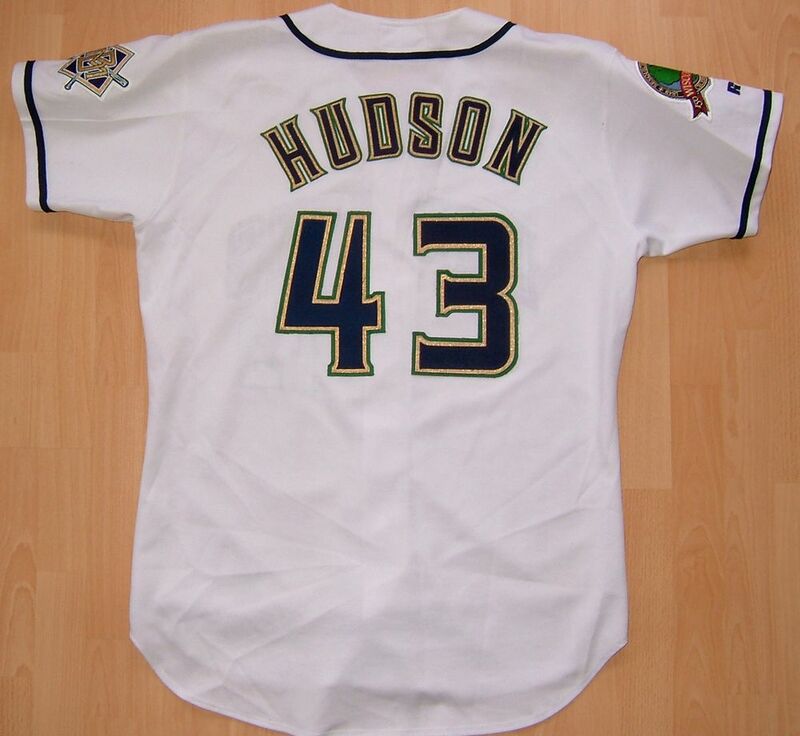 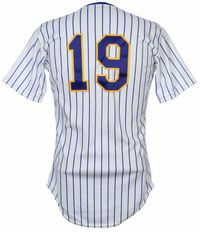 Front numbers are added to the road jersey in 1971 but for reasons unknown the funky upper-lower lettering mix and nautical sleeve cuffs remain. Double knit jerseys arrive. 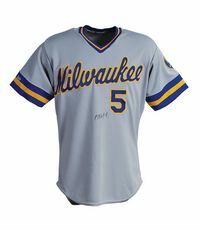 The road jersey now matches the home jersey. Road jersey lettering inverts to blue with gold trim. 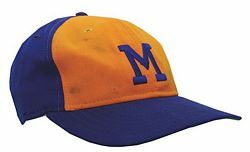 Yellow front panel cap introduced for road jerseys. Not sure if this is authentic. 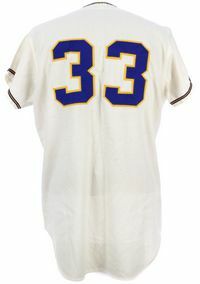 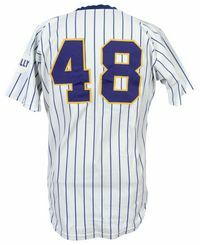 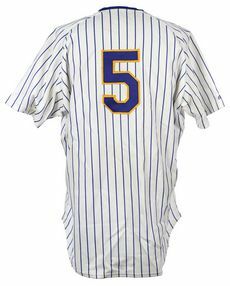 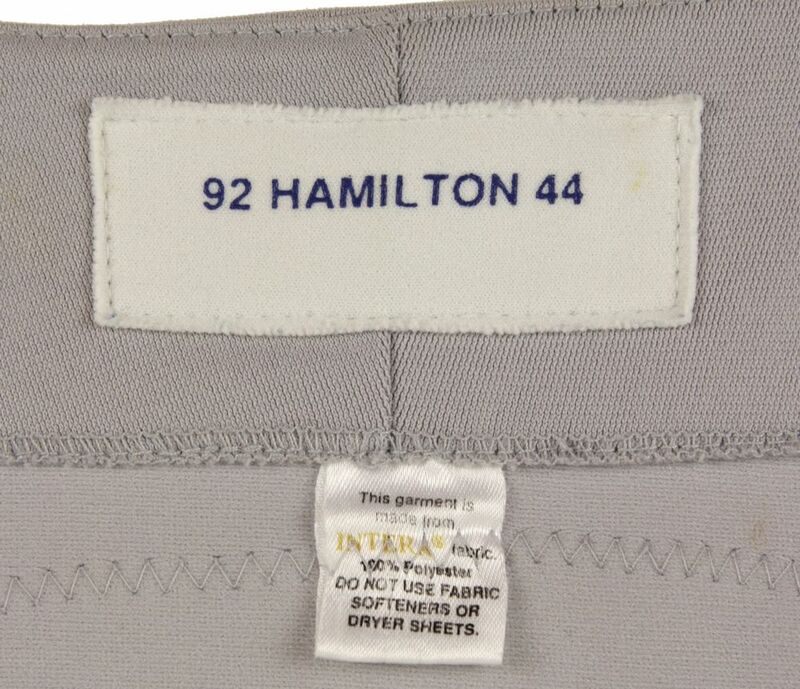 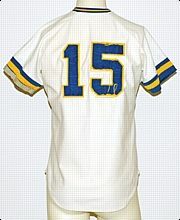 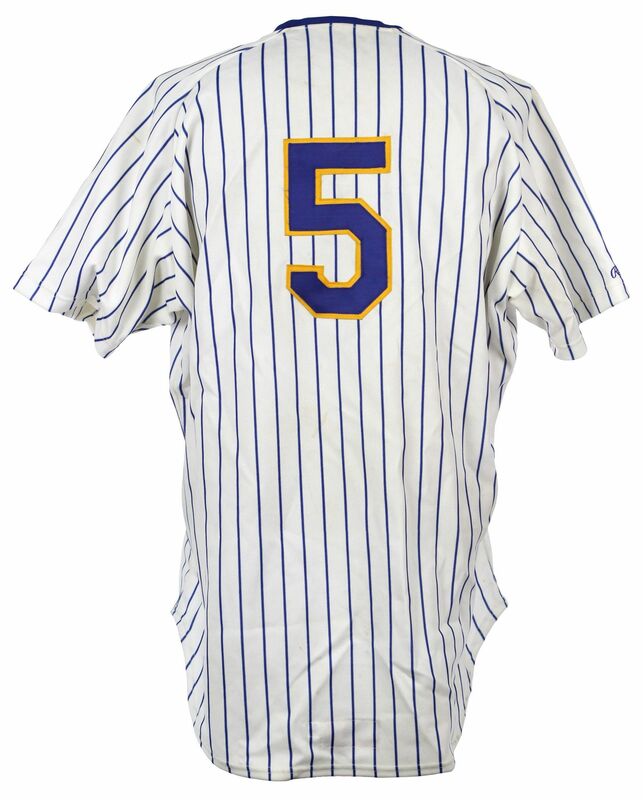 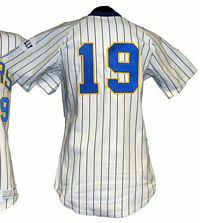 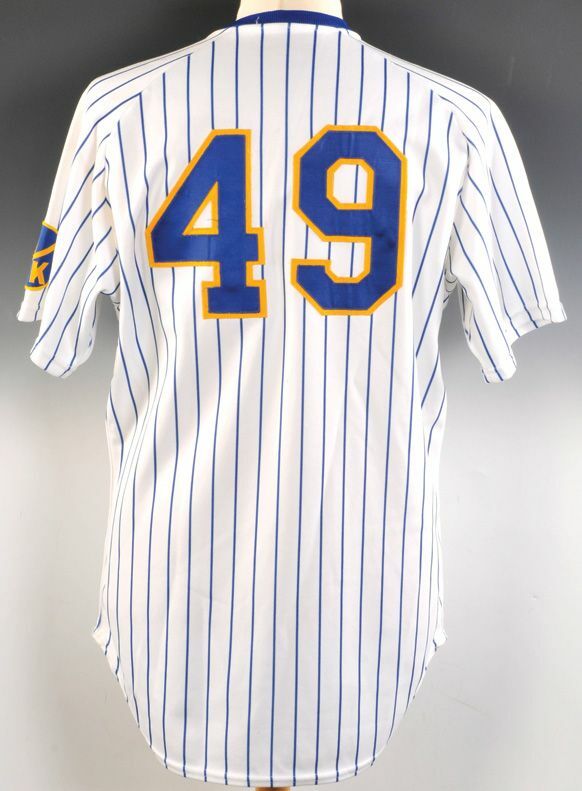 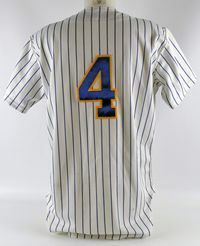 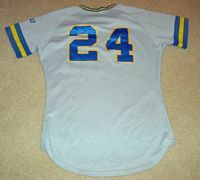 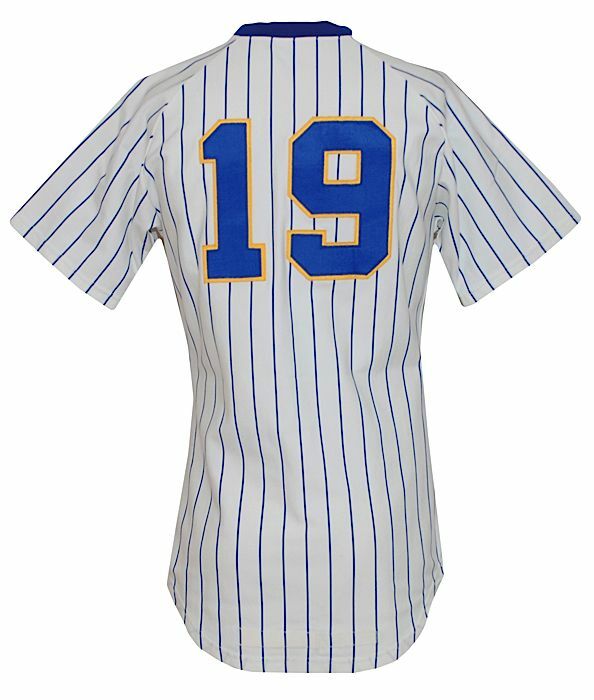 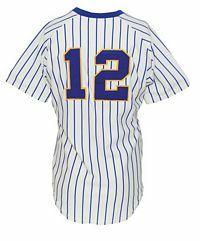 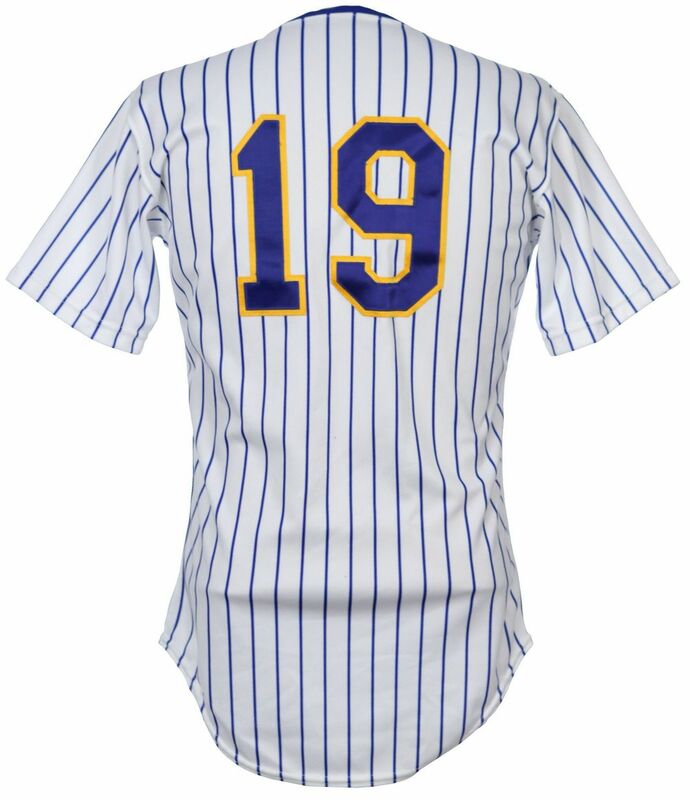 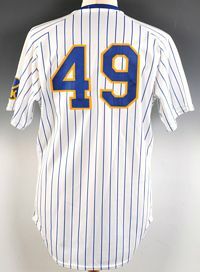 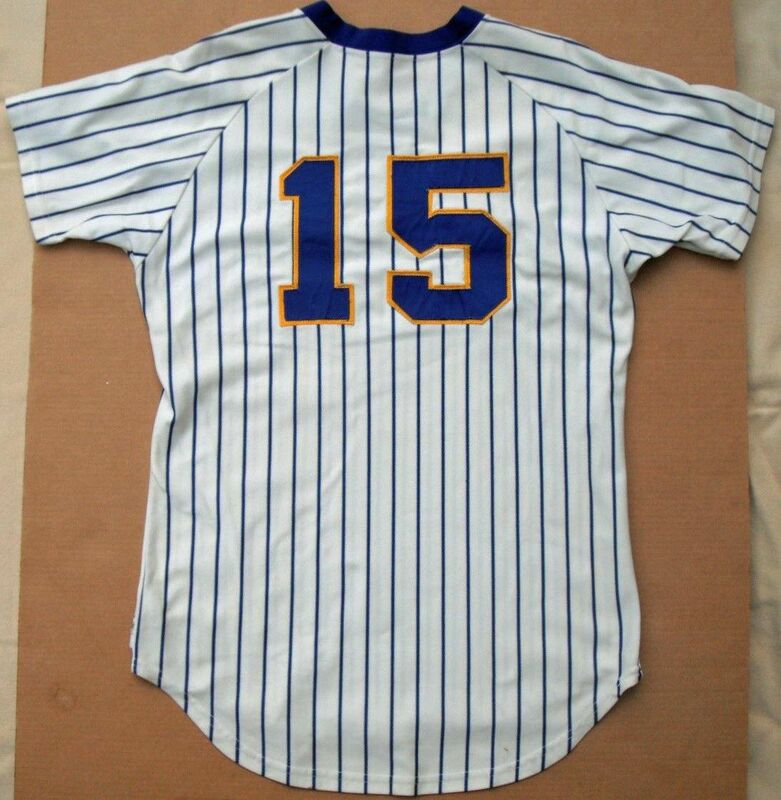 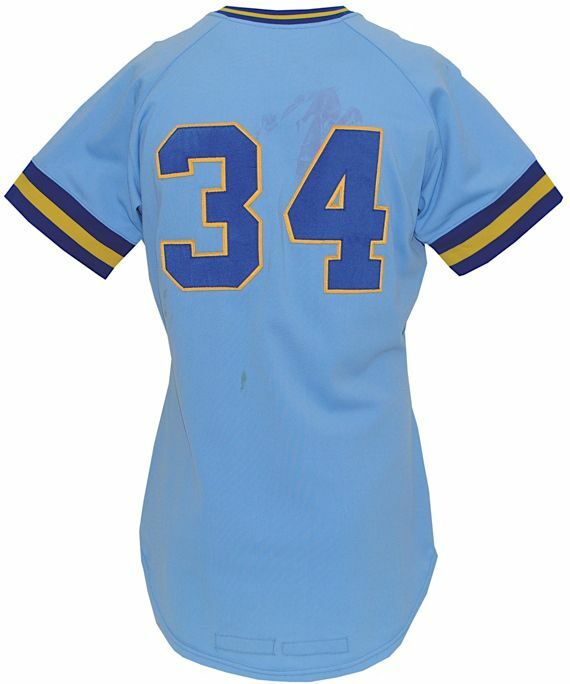 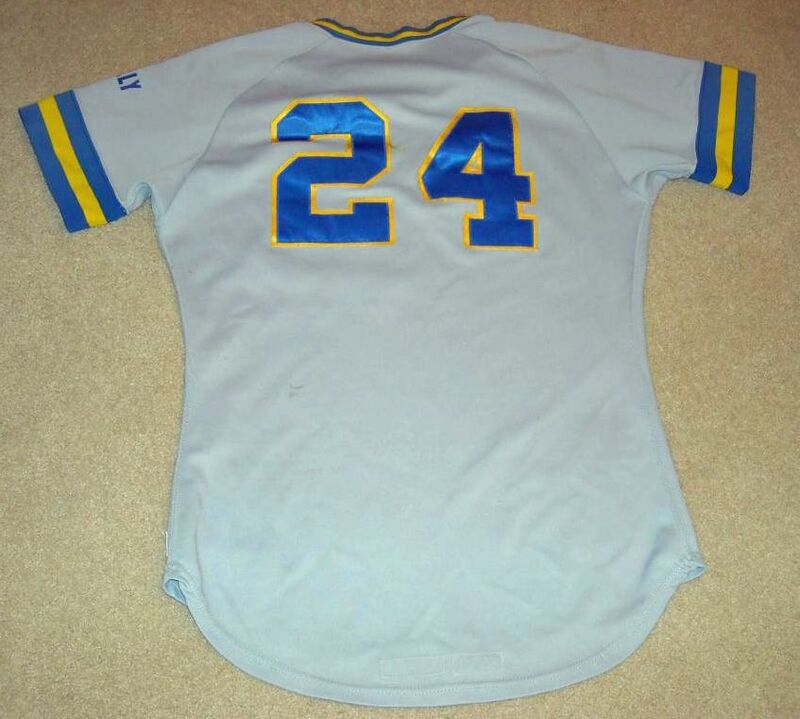 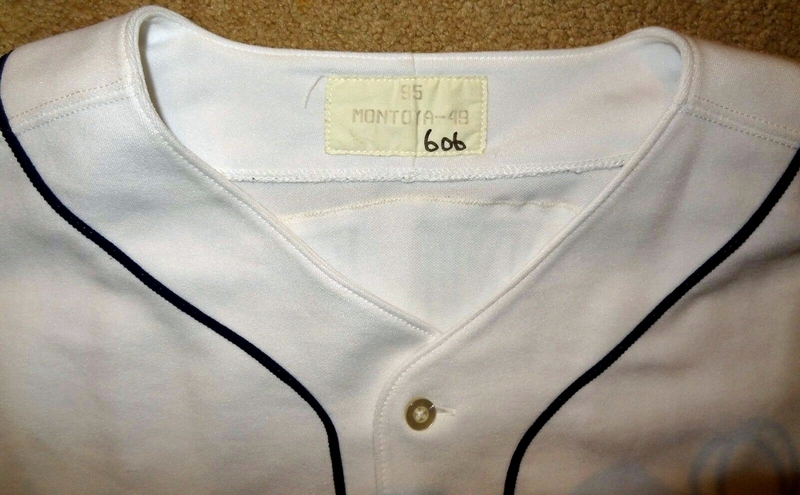 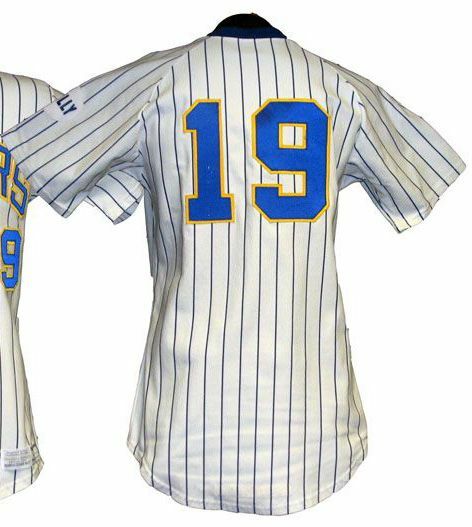 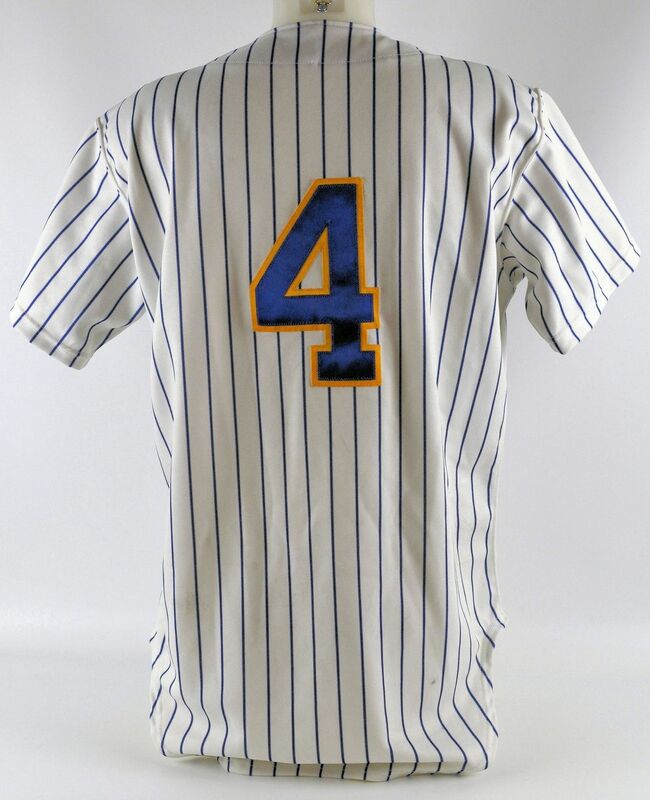 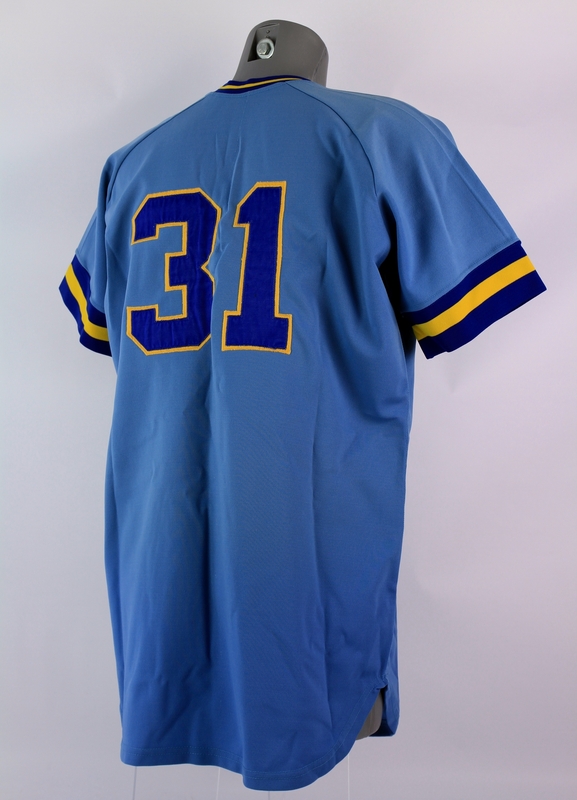 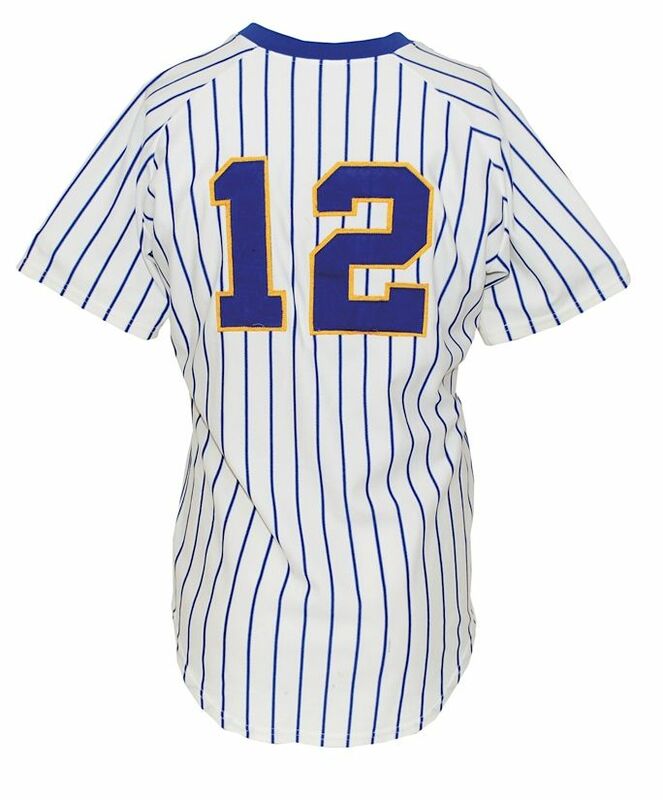 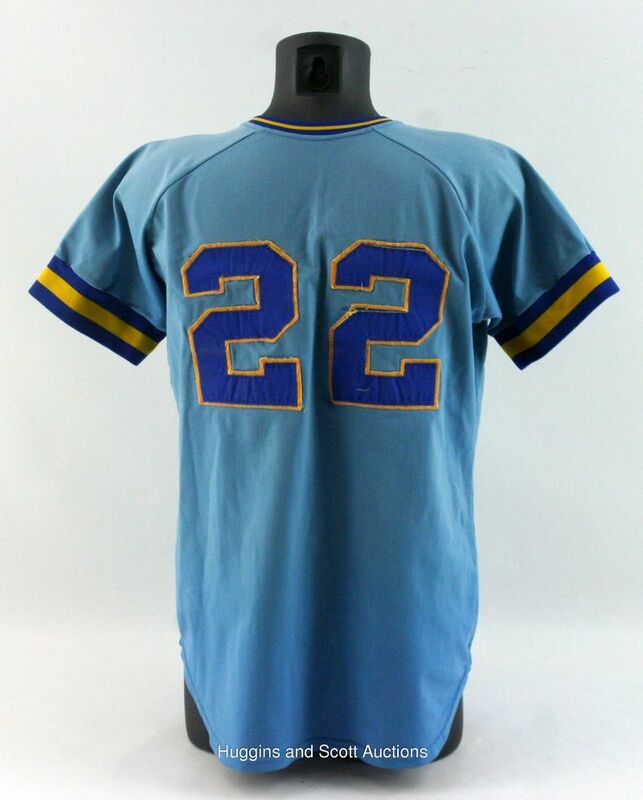 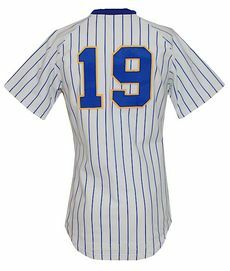 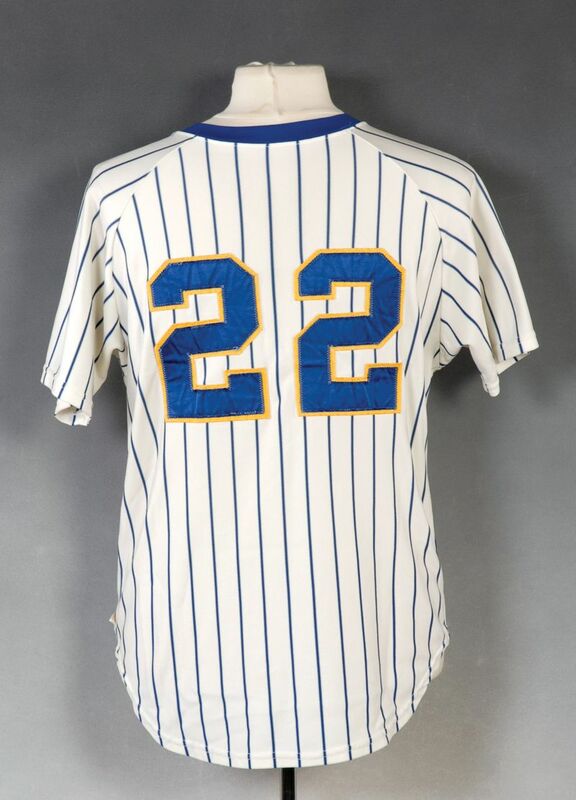 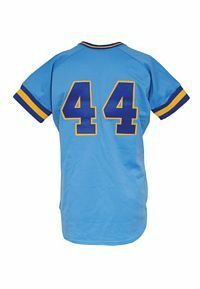 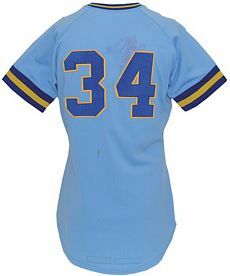 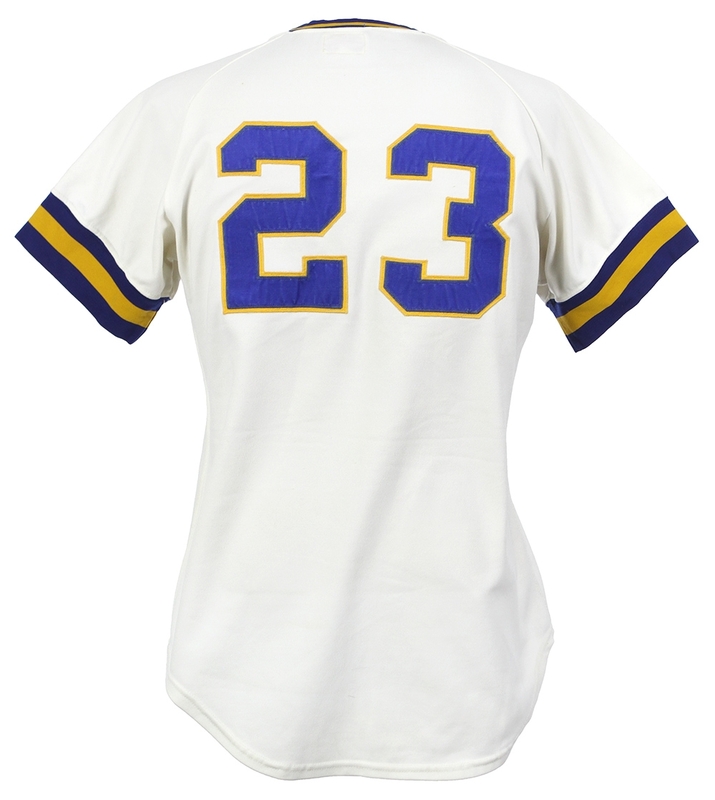 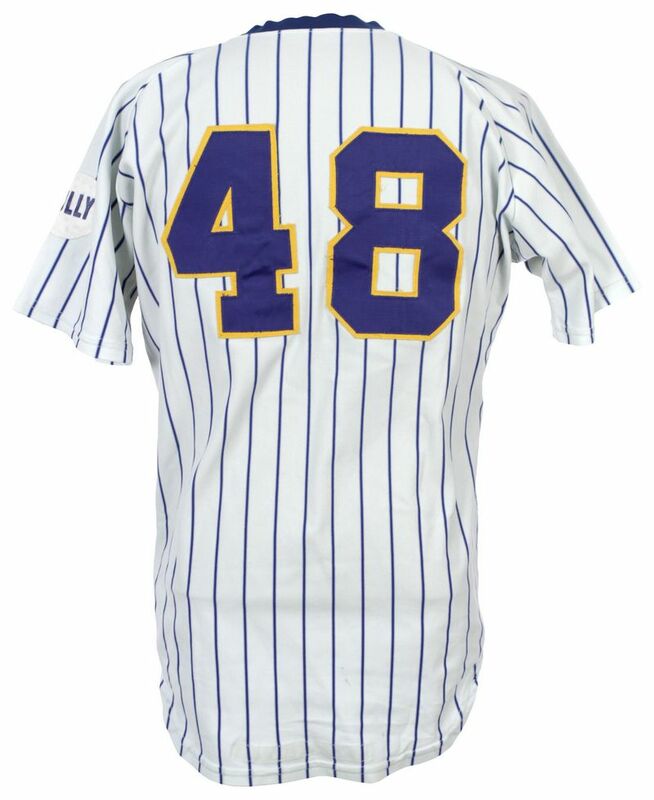 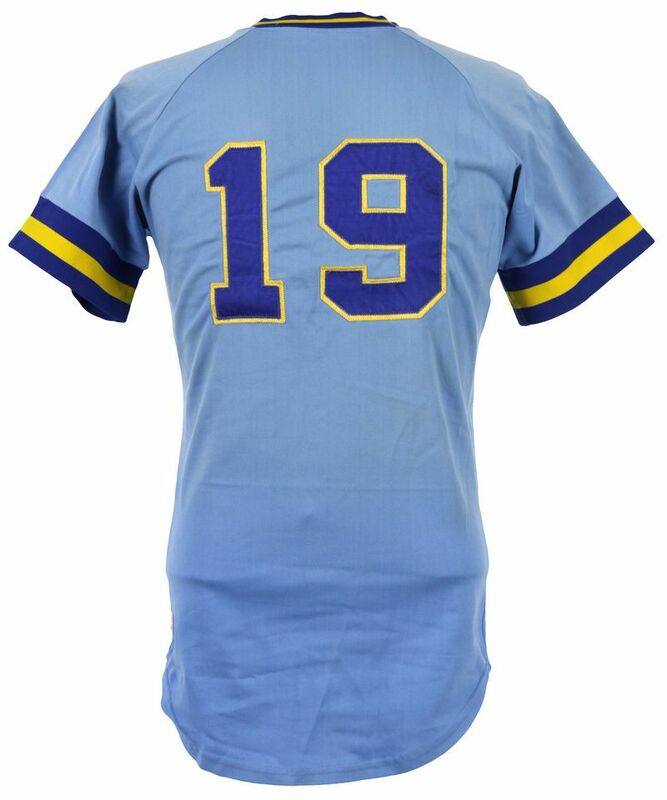 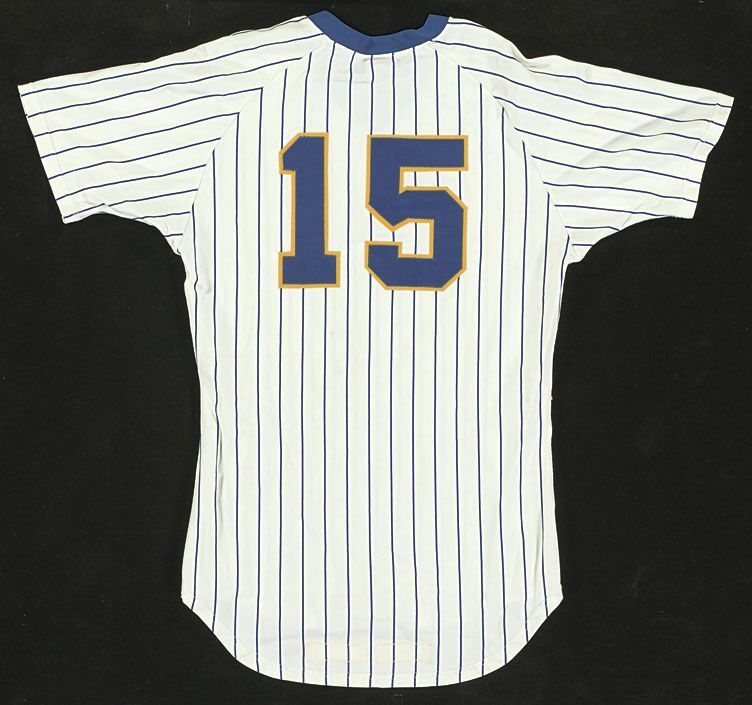 1976 being Hammerin' Hank's final season, the team had to make a number of extra jerseys just for him. 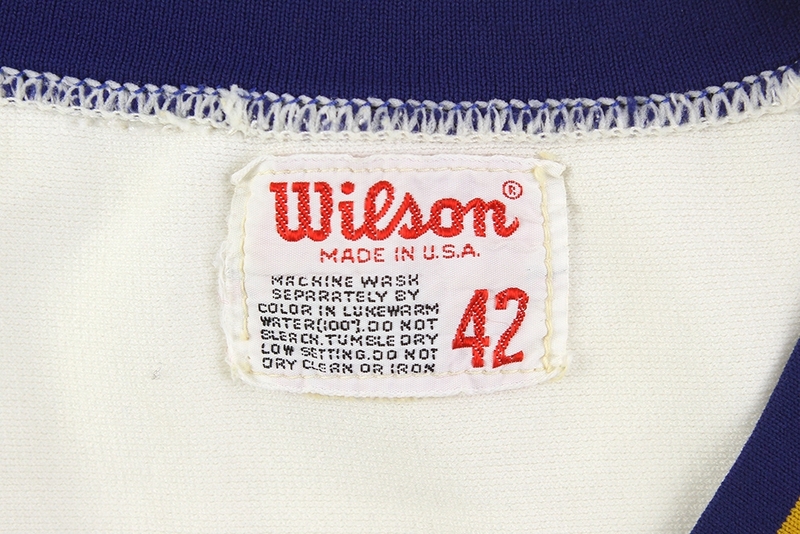 Wilson jersey just for Hank. 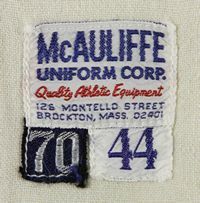 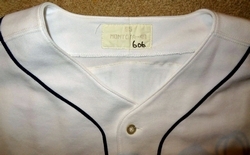 McAuliffe jersey for Hank - note different number font. 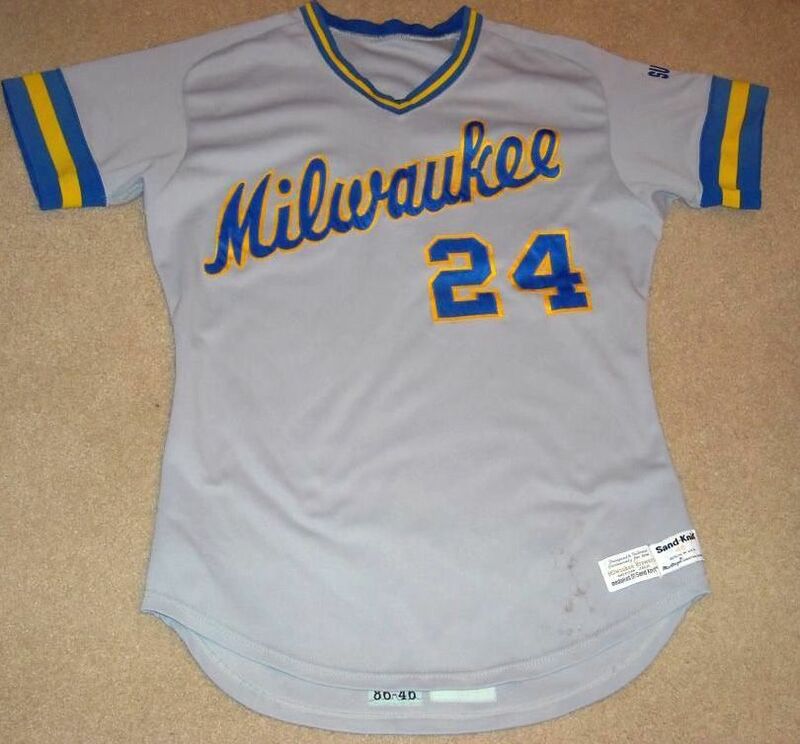 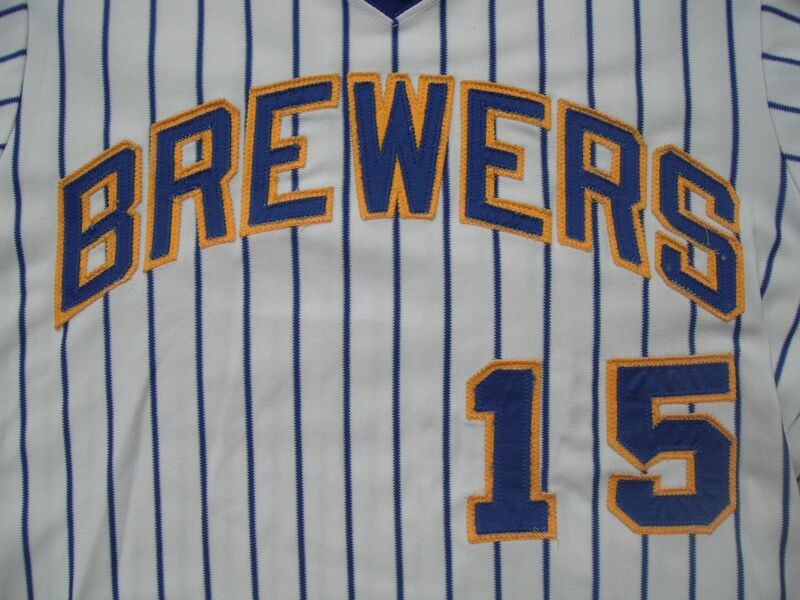 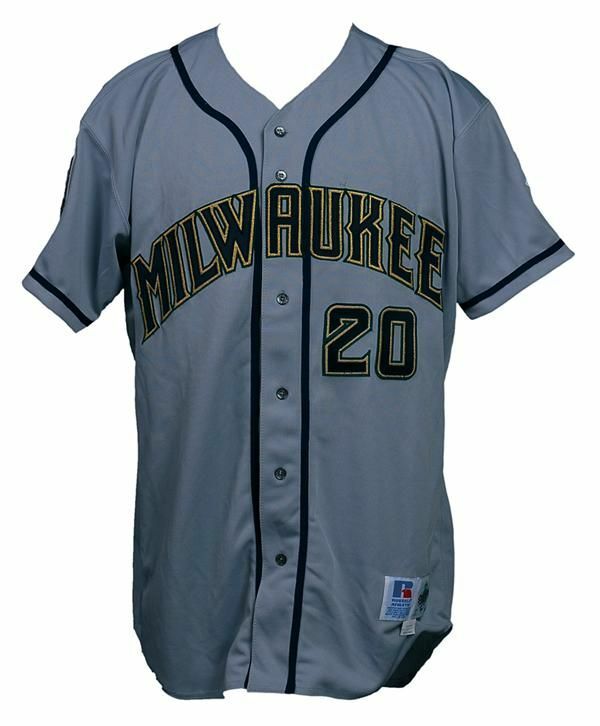 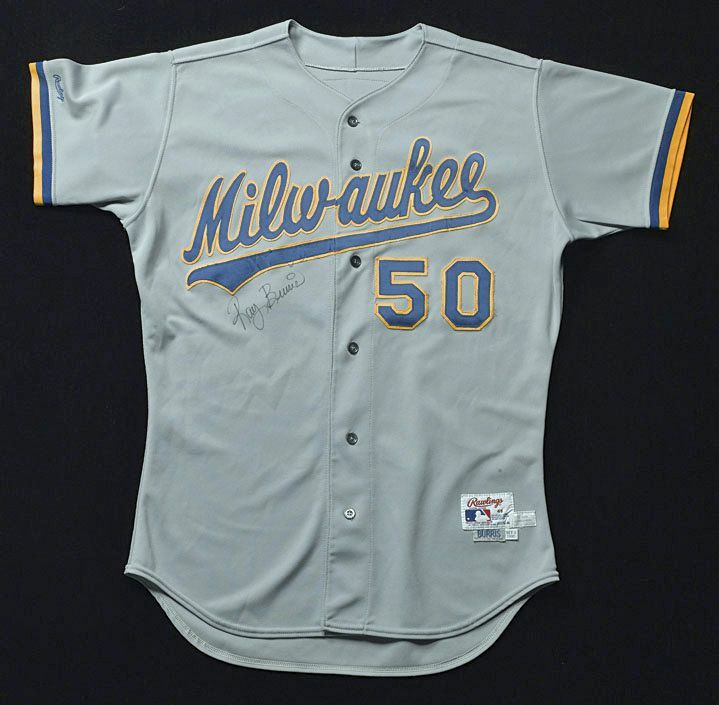 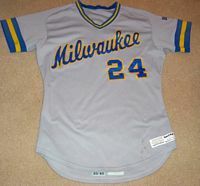 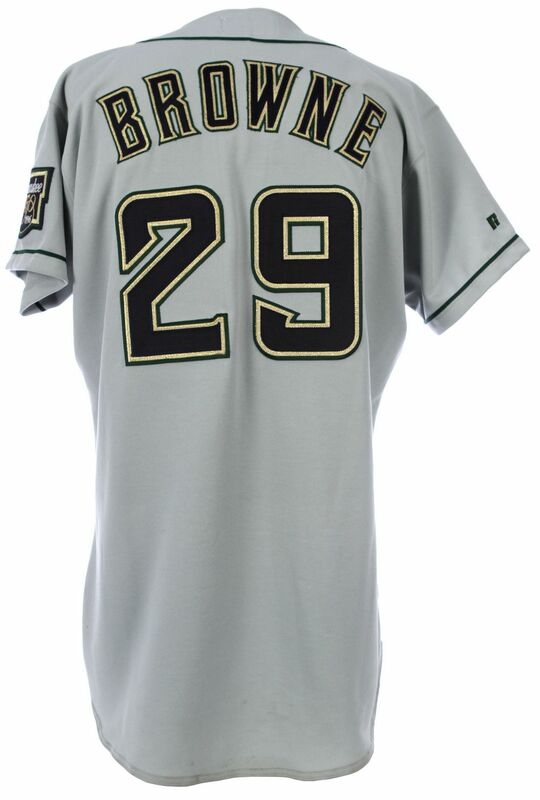 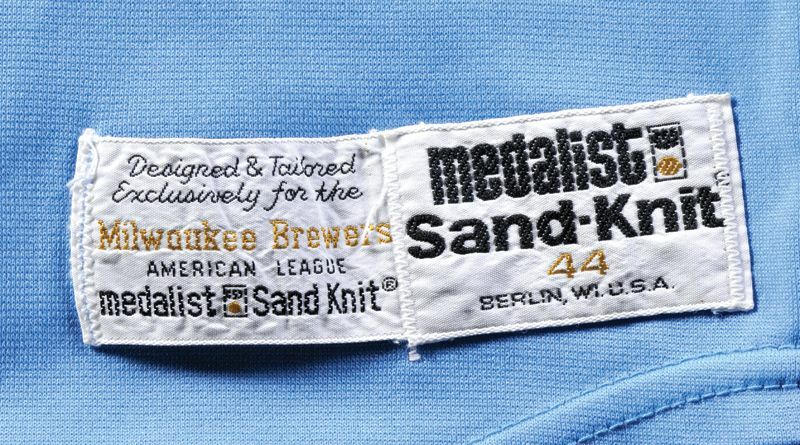 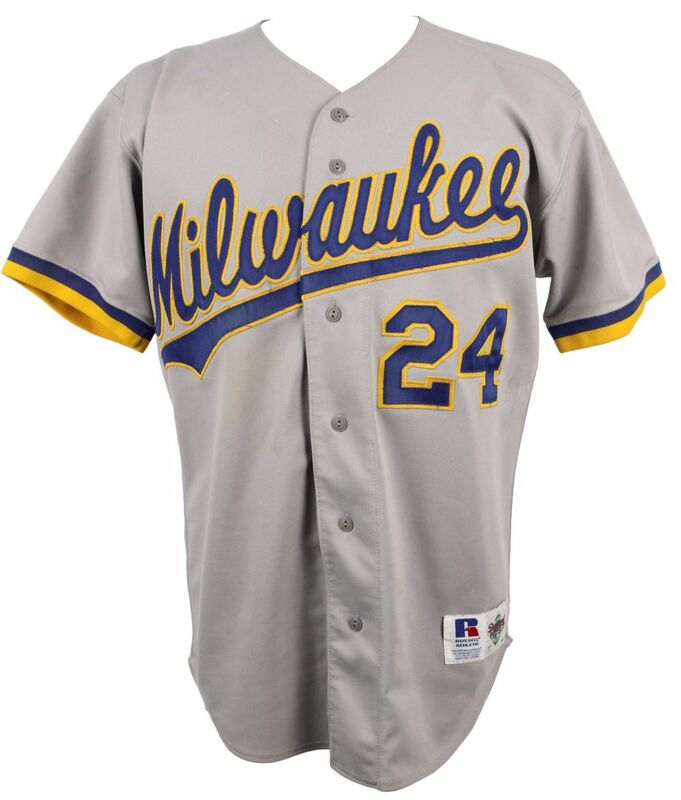 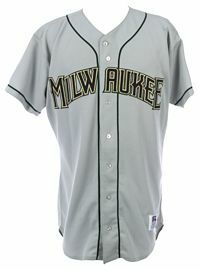 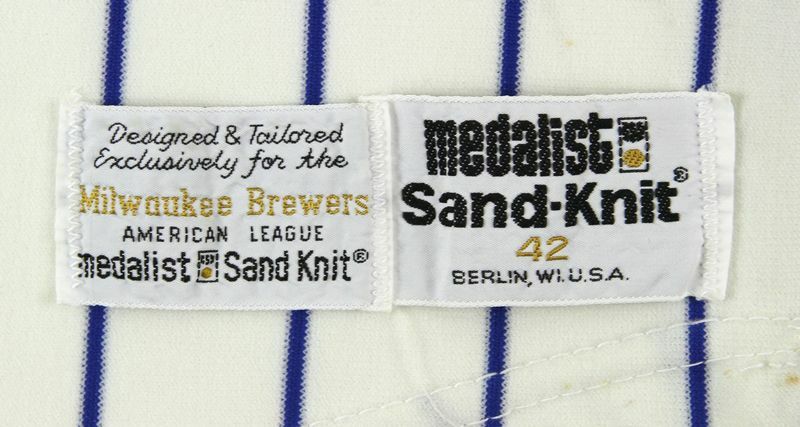 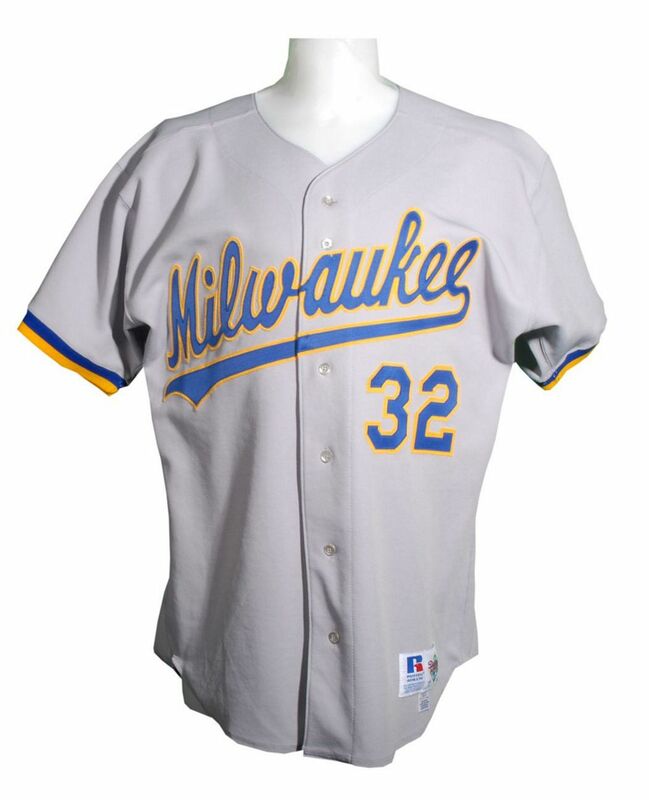 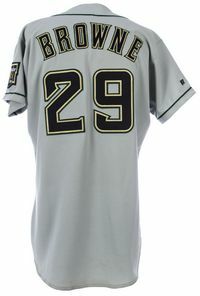 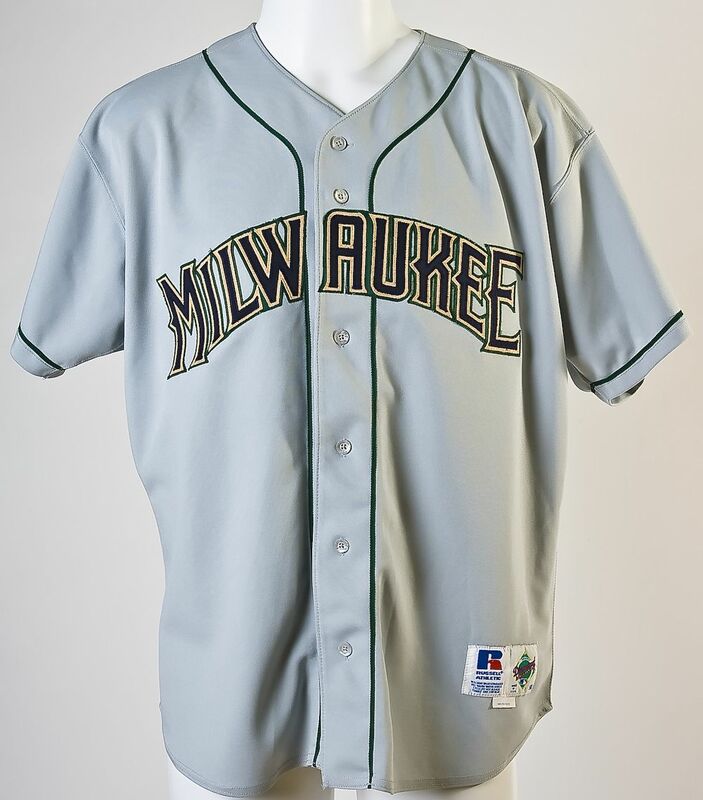 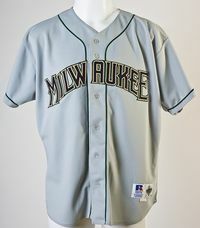 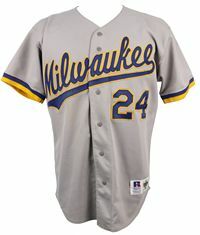 The home jersey gets pinstripes, road jersey gets "Milwaukee" in script. 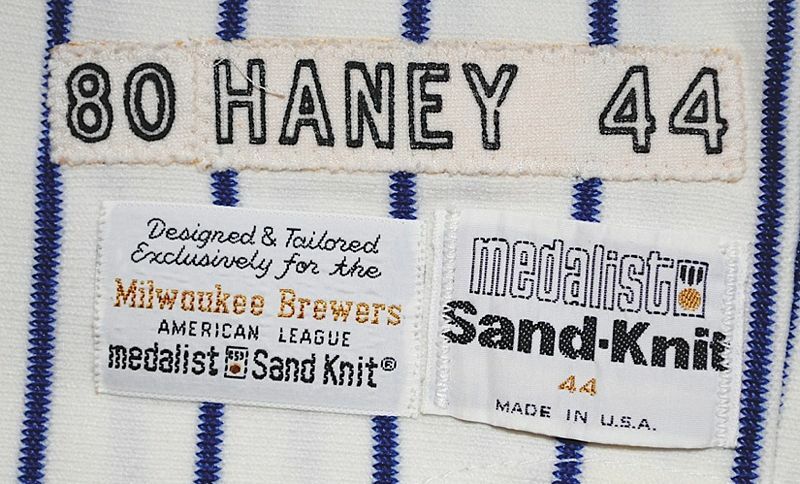 The ingenious four-fingered glove logo debuts. 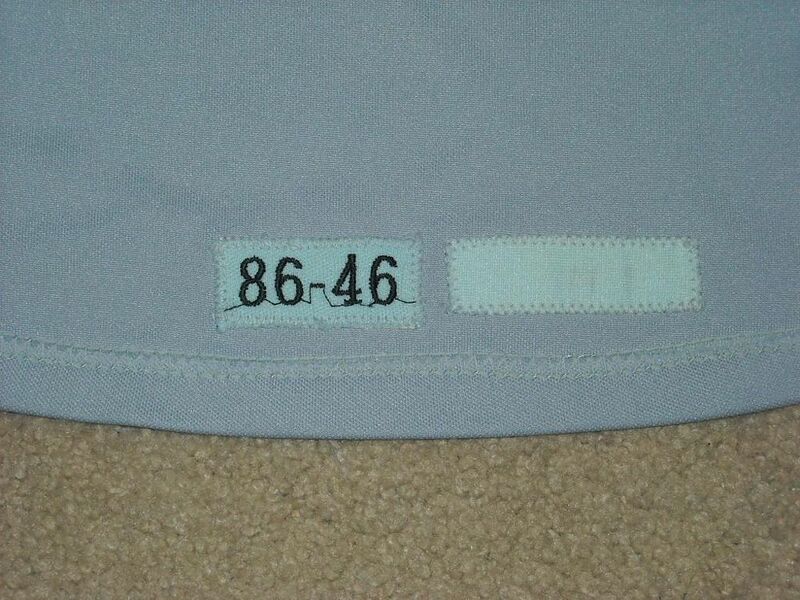 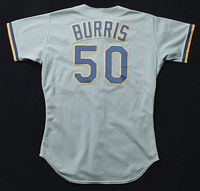 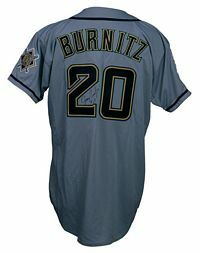 Powder blue road jersey gives way to blue-grey. 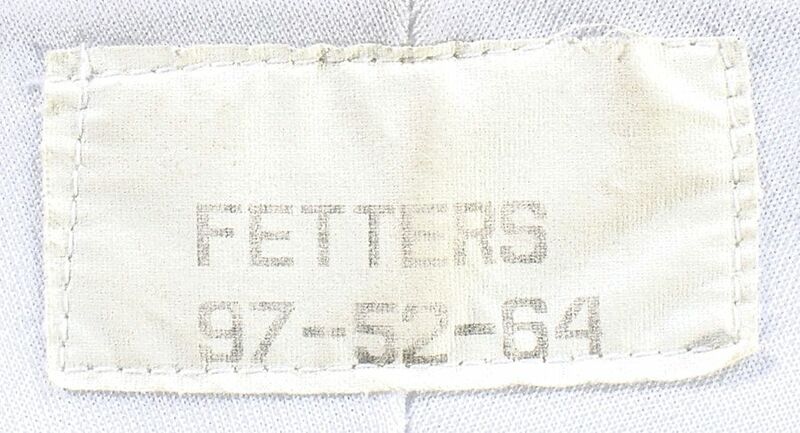 Yellow front panel cap is dropped in 1986. 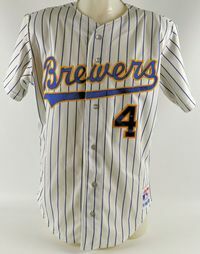 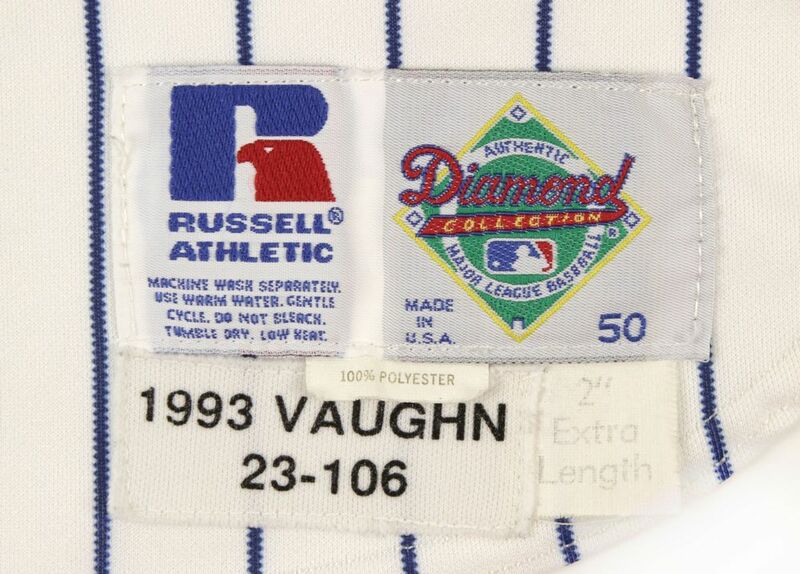 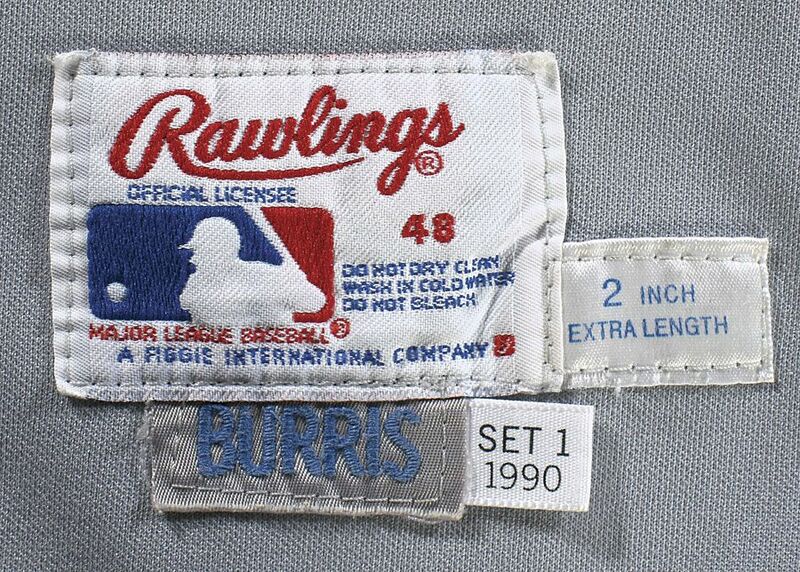 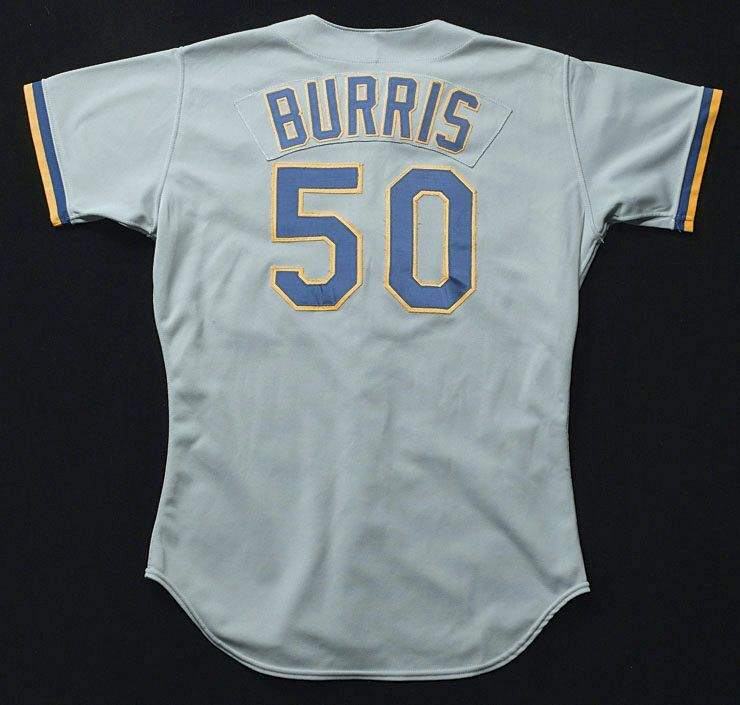 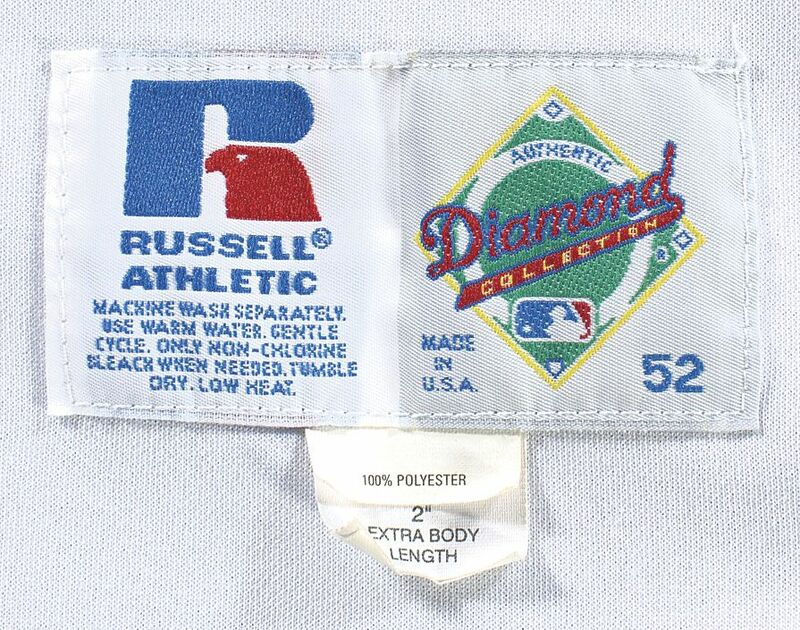 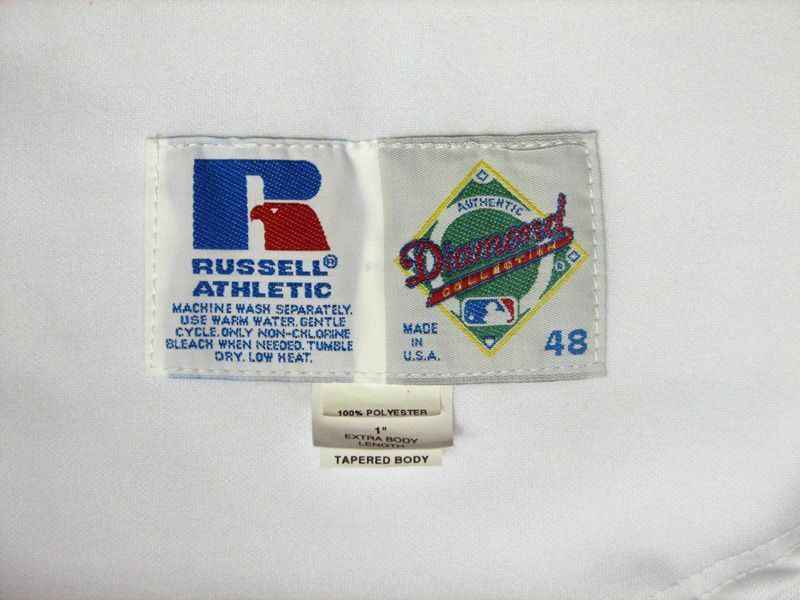 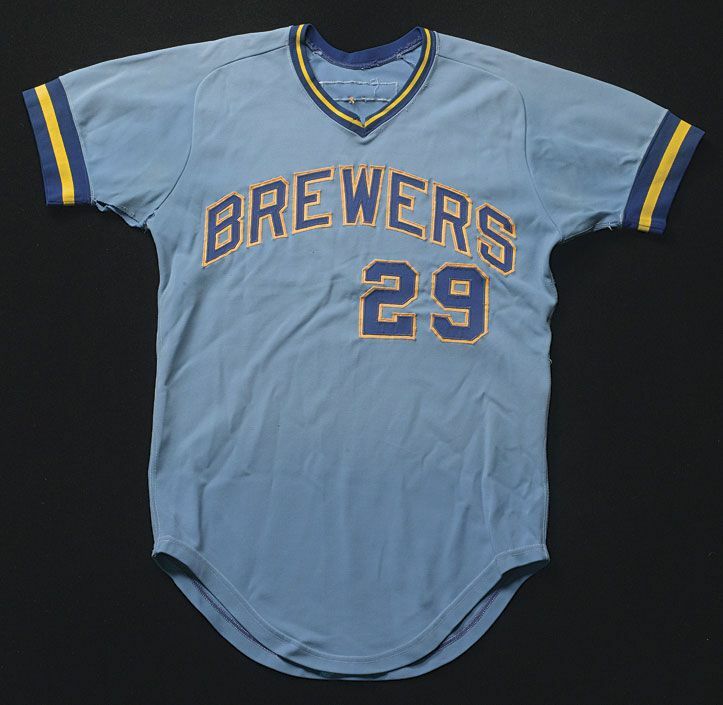 During the 1989 season the team introduces its new buttoned-style jersey (at least for road jerseys - anyone know if buttoned home jerseys were also introduced in 1989?). 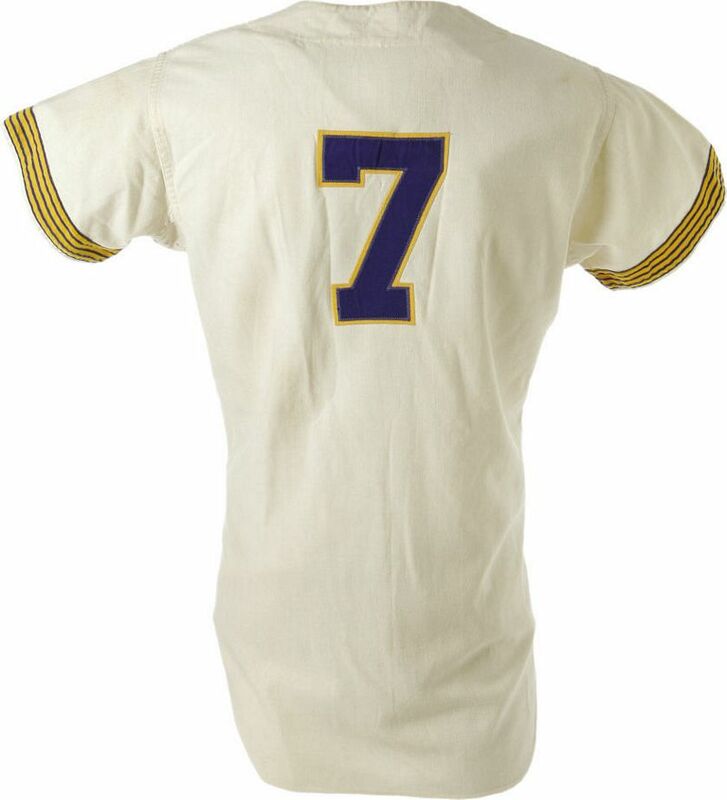 Home jersey front changes to script, road jersey script gets an underline, NOB added, and sleeve cuffs change. 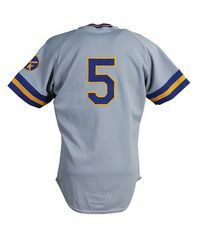 NOB nameplate now used on road jerseys. 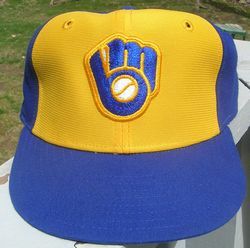 A complete overhaul. 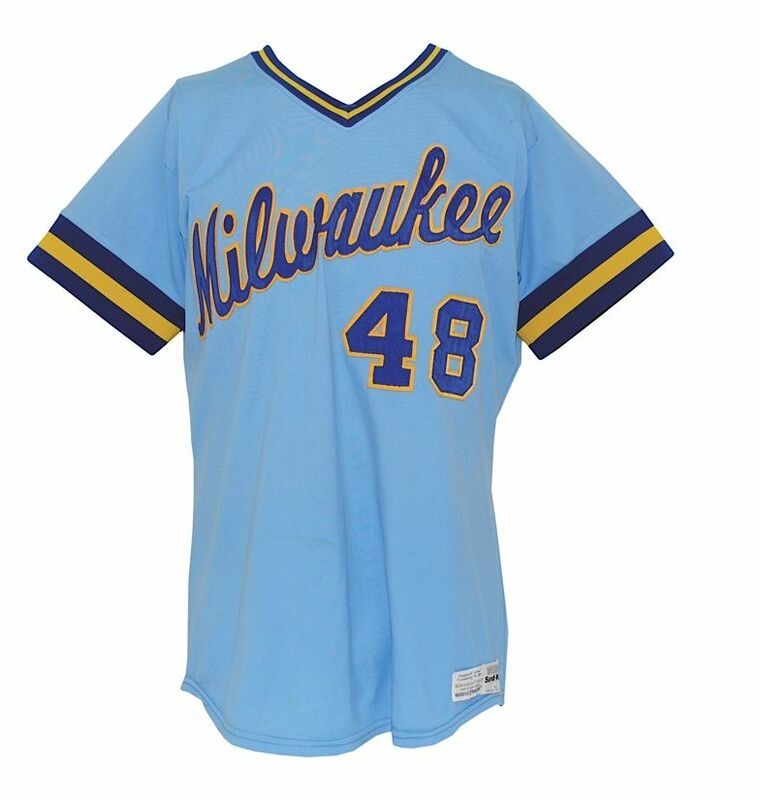 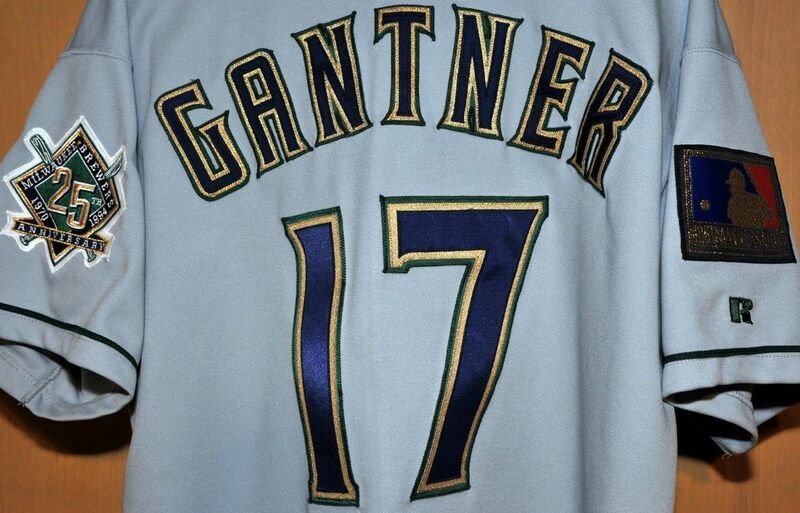 Colors changed to navy, teal (cause it's the 90's) and gold. 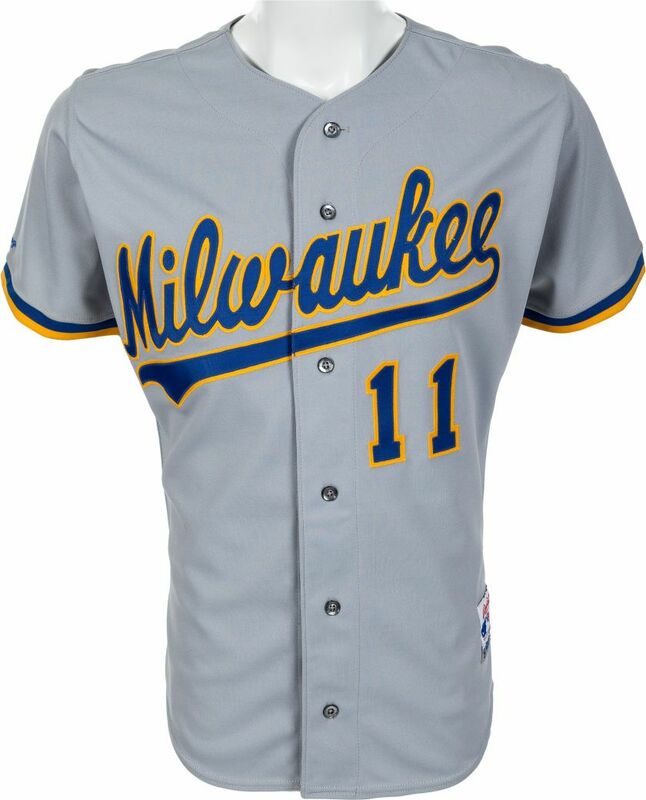 Alternate jersey added. 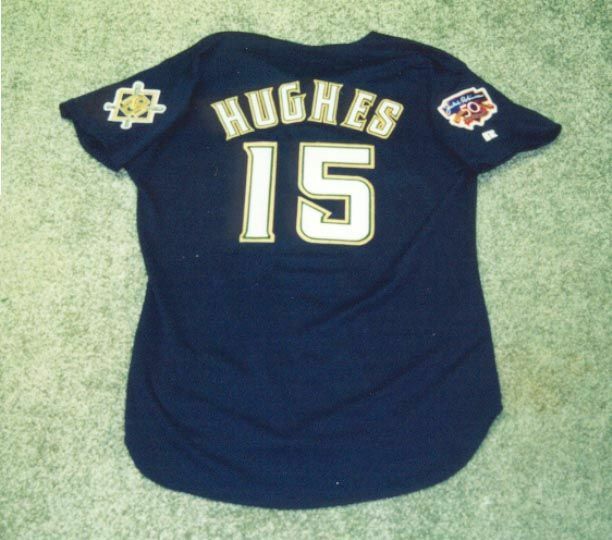 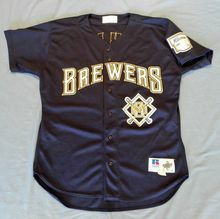 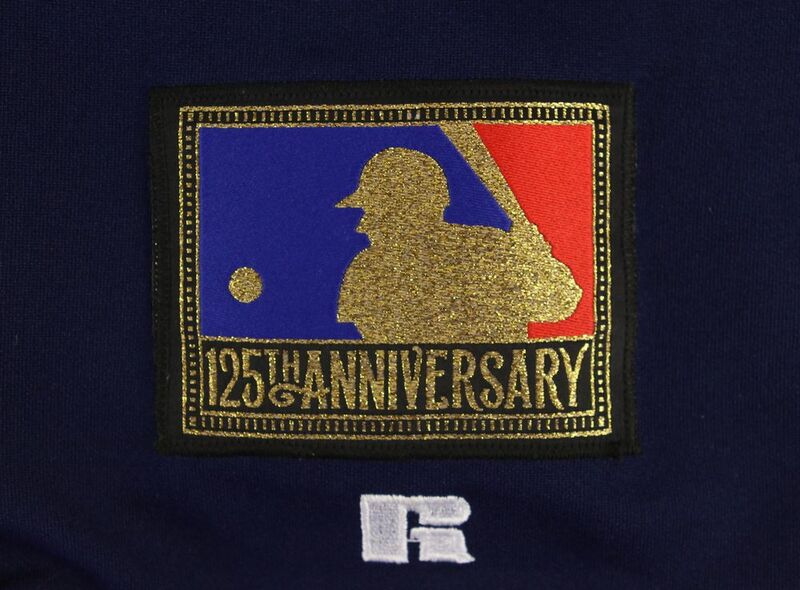 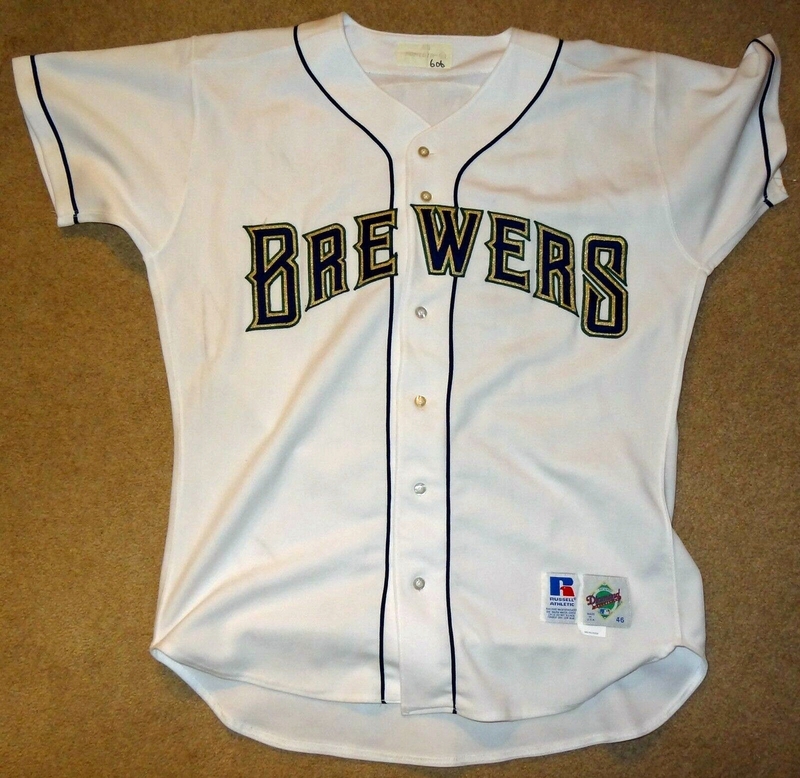 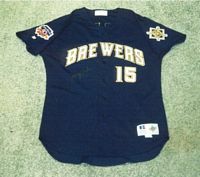 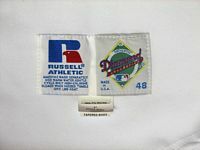 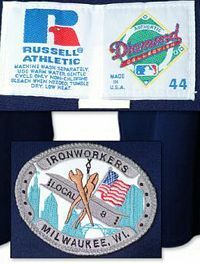 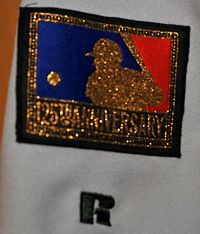 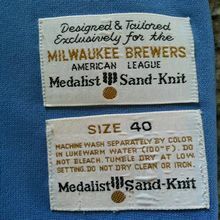 MLB 125th anniversary patch and Brewers 25th anniversary patch worn in 1994. 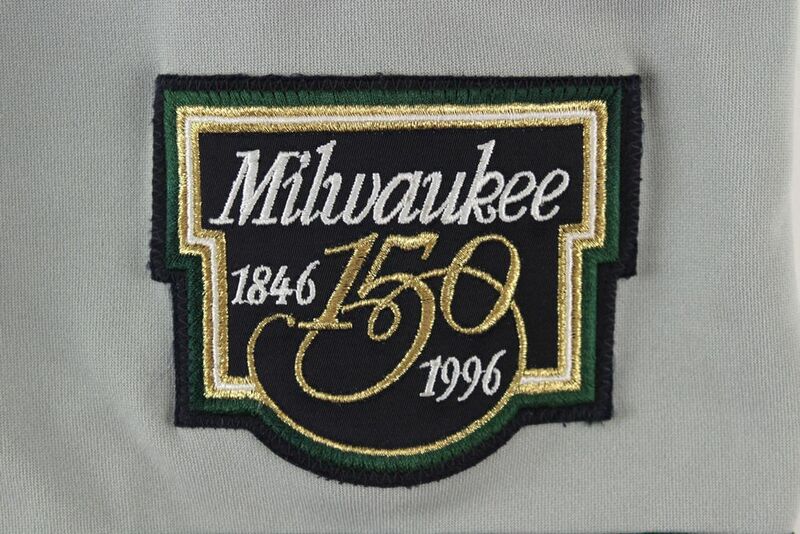 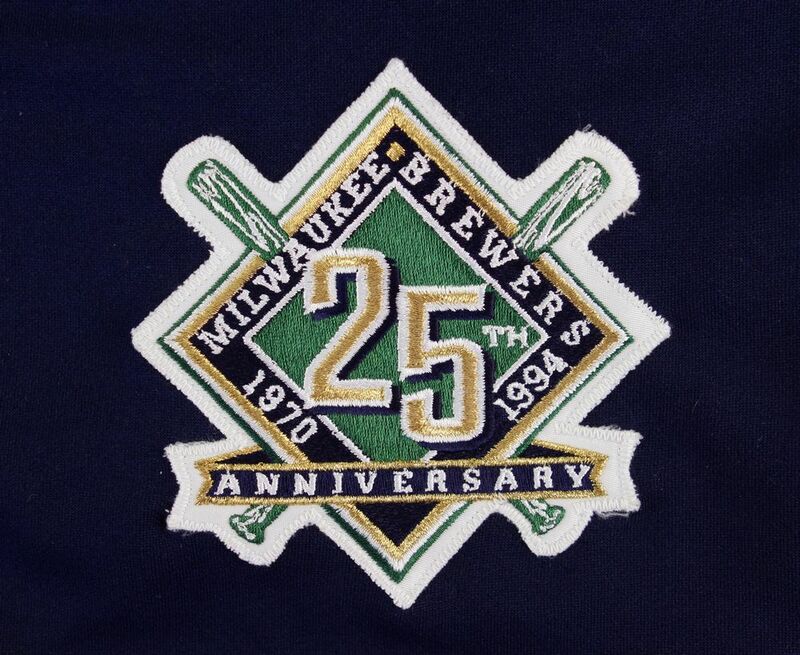 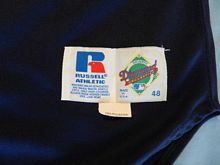 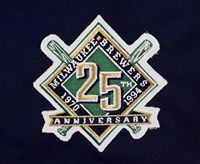 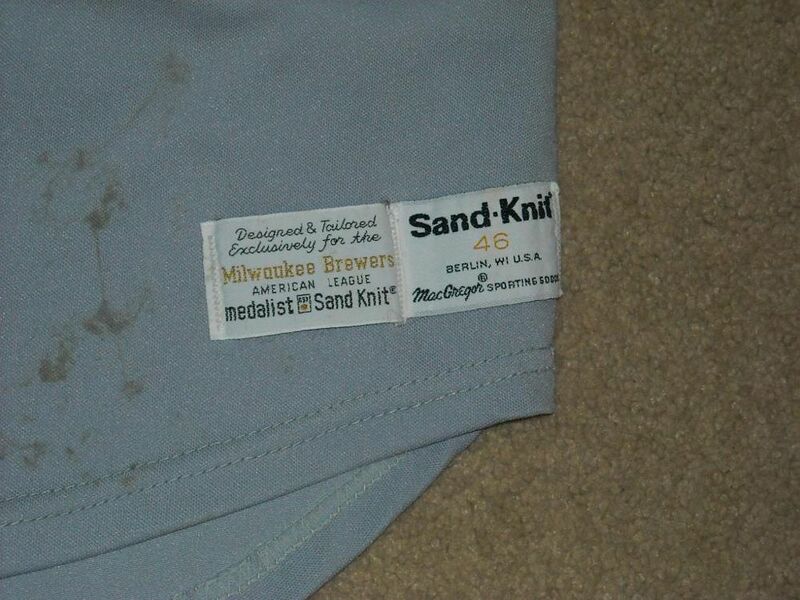 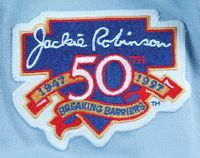 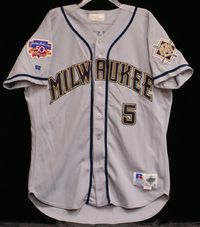 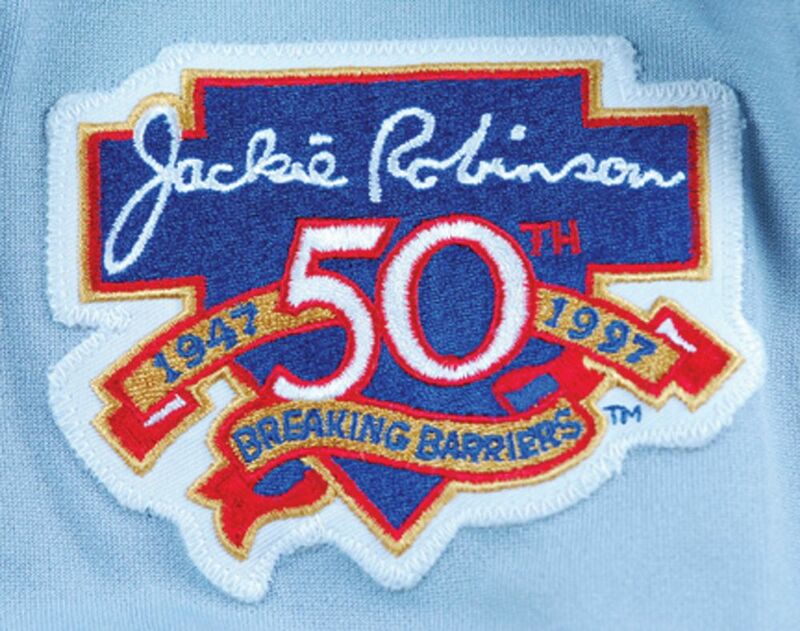 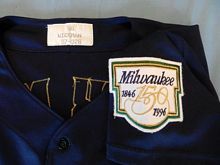 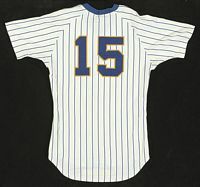 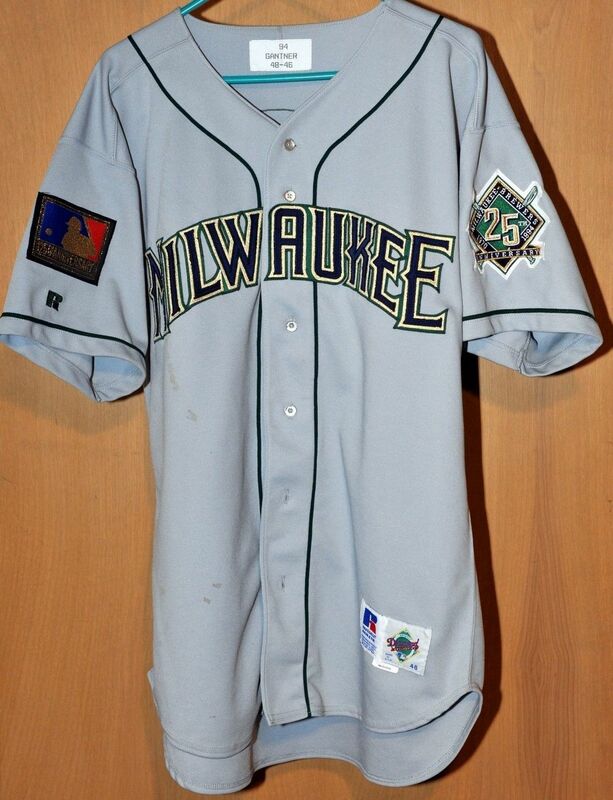 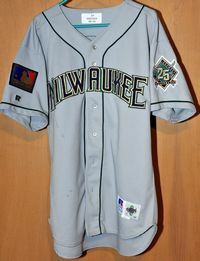 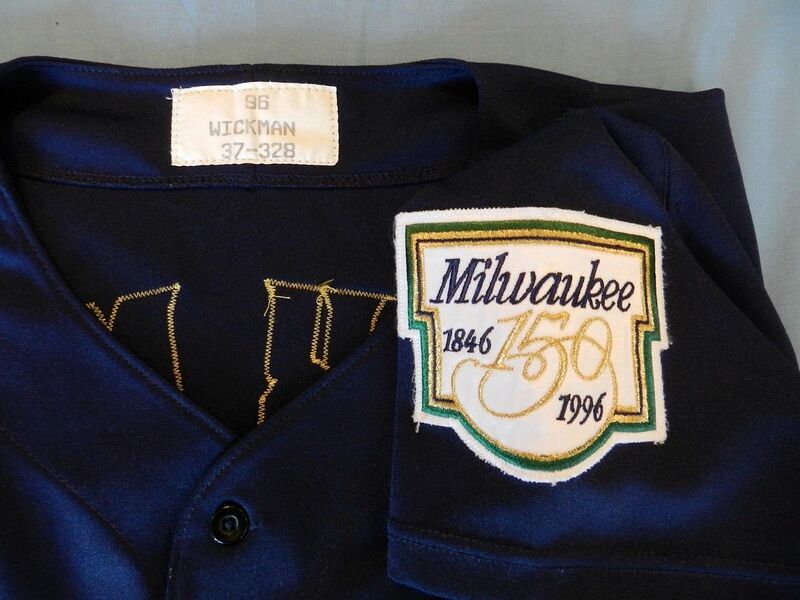 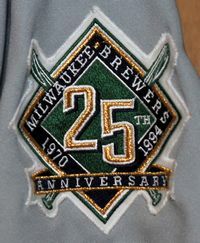 Milwaukee 150th anniversary patch worn in 1996. 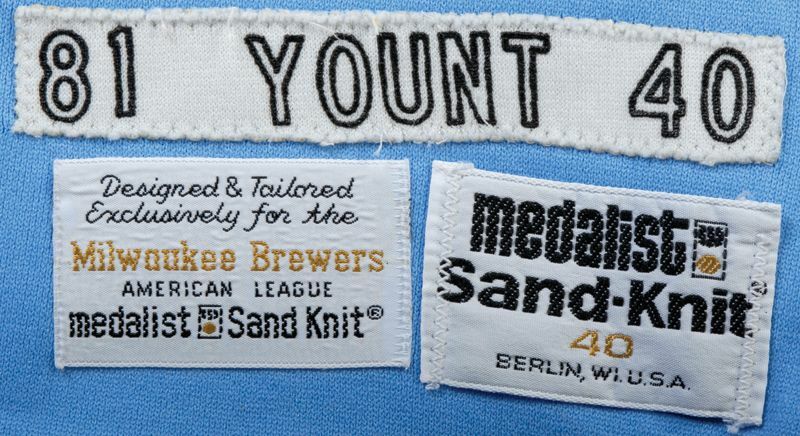 Wordmark loses the big letters at each end. 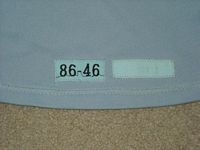 Front numbers addred. Road jersey changes from green-grey to blue-grey and piping from green to navy. 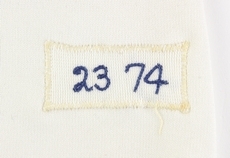 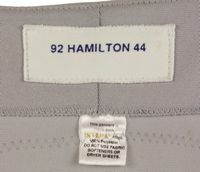 On the alternate, a front number replaces the logo. 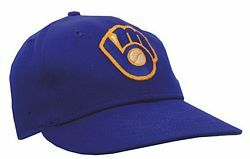 New cap logo is less busy. 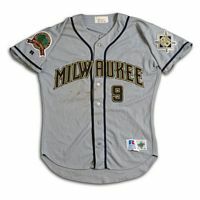 Milwaukee transfers from the A.L. 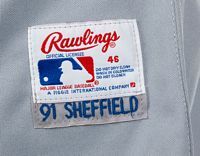 to the N.L. 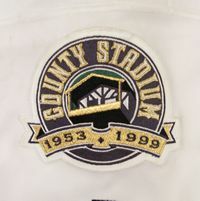 in 1998. 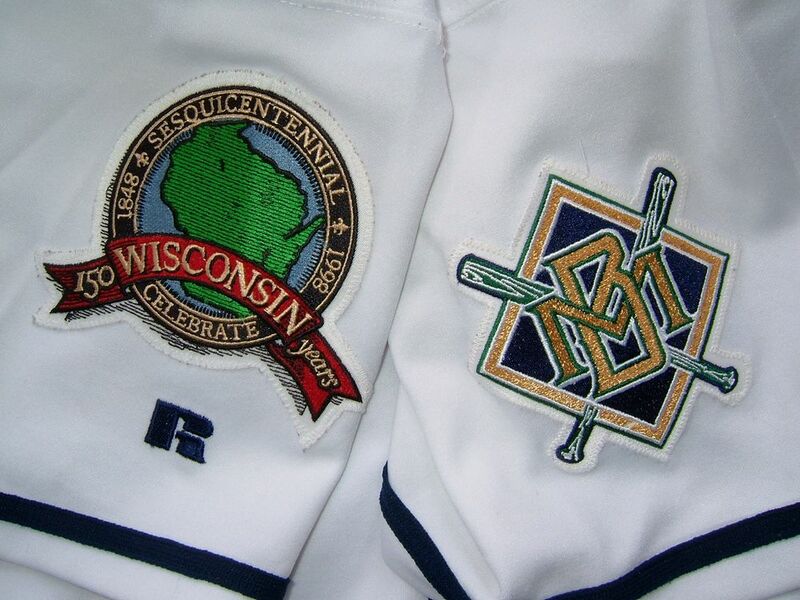 Wisconsin Centennial patch in 1998. 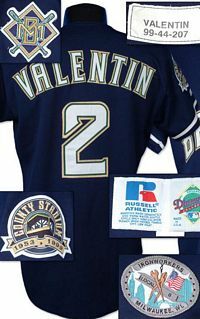 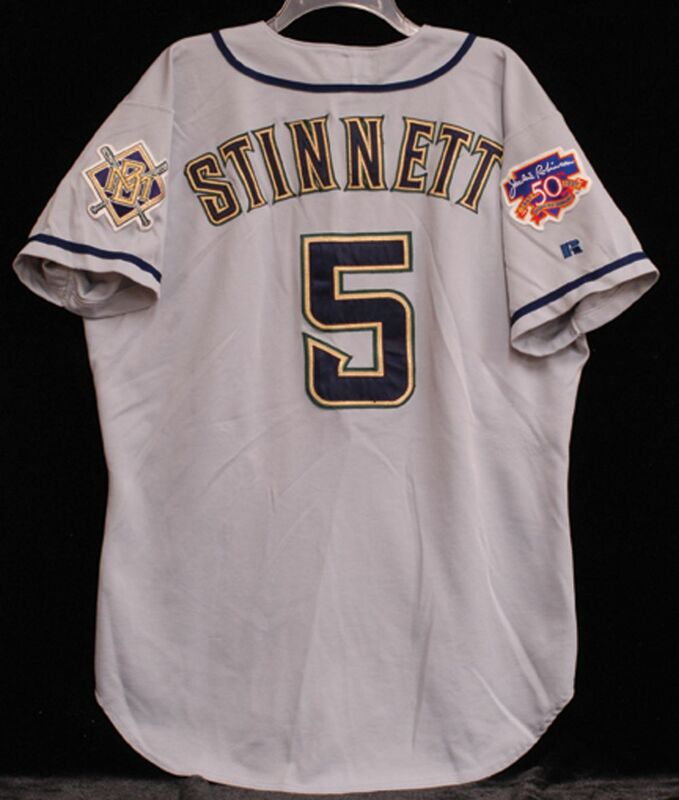 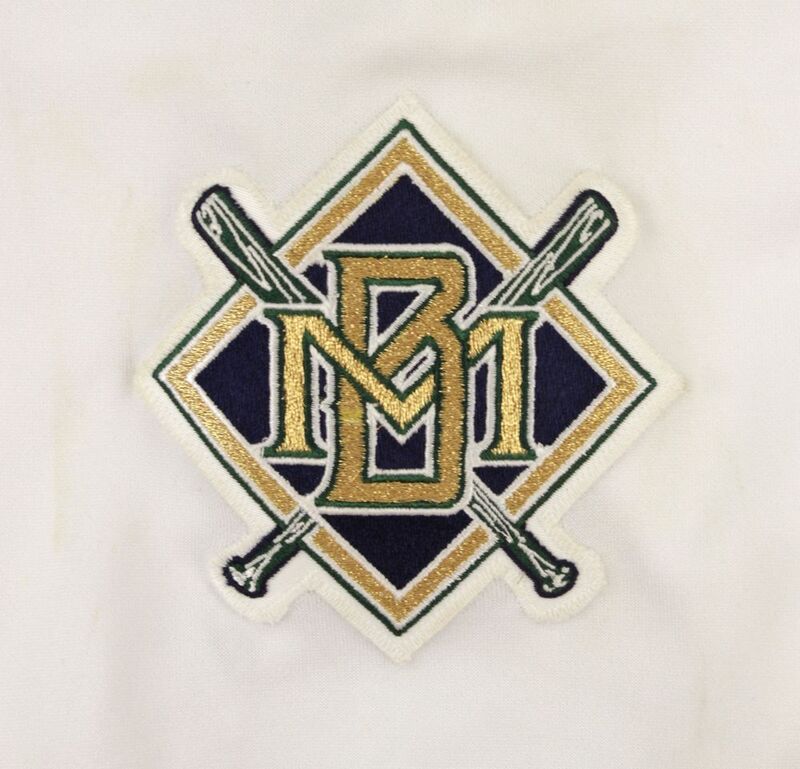 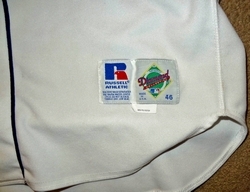 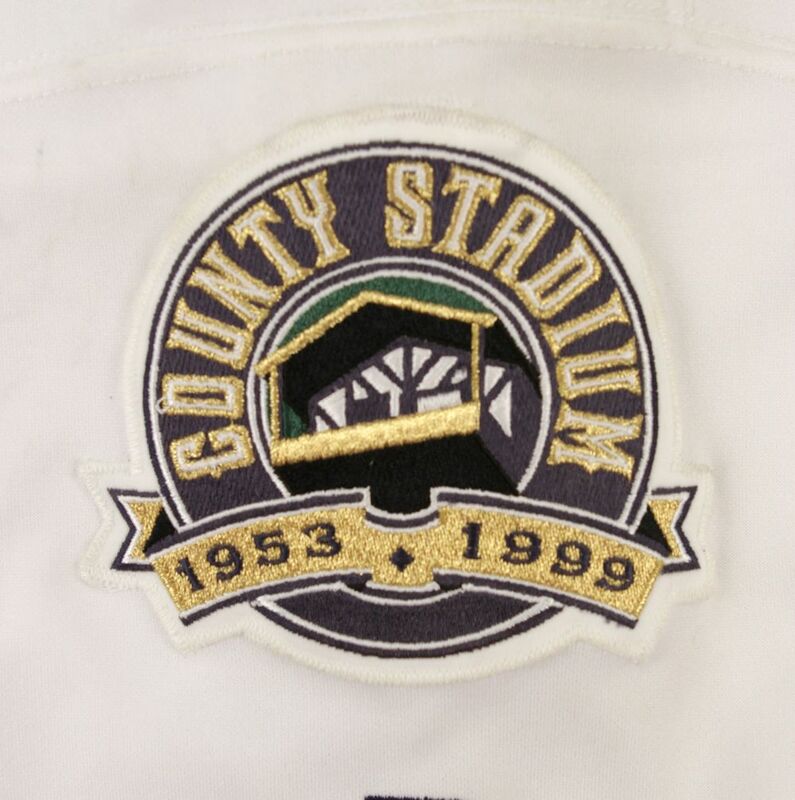 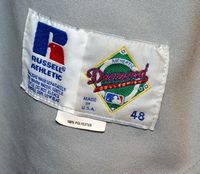 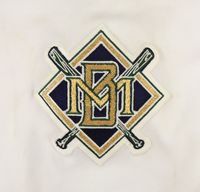 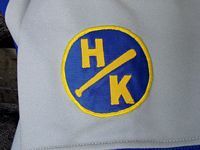 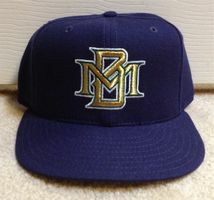 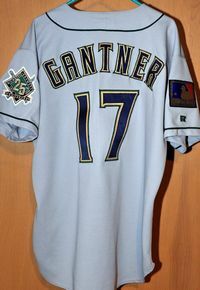 County Stadium patch for 1999.